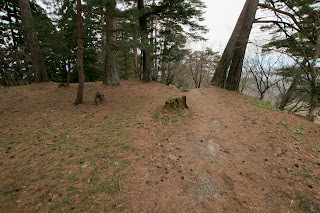 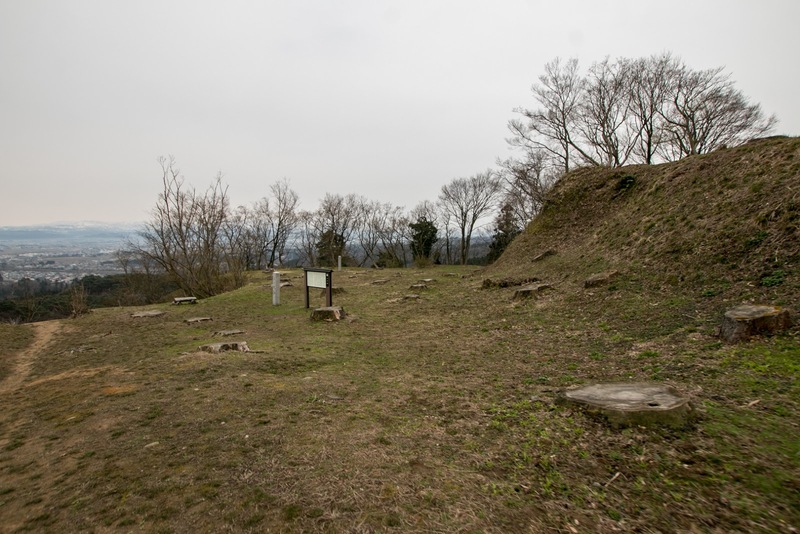 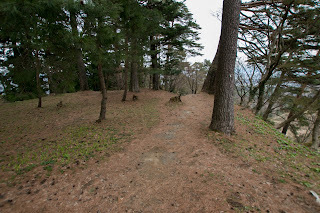 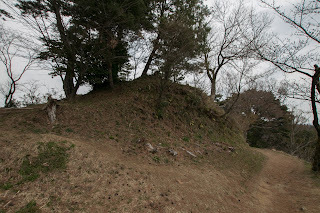 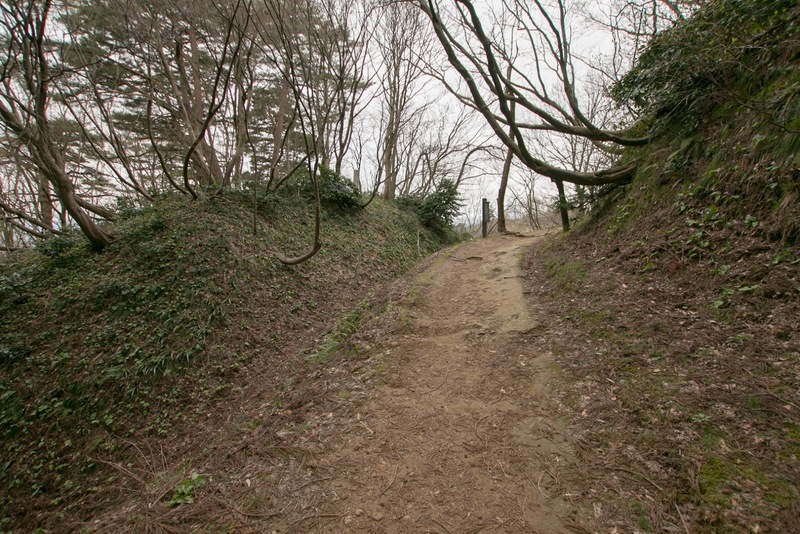 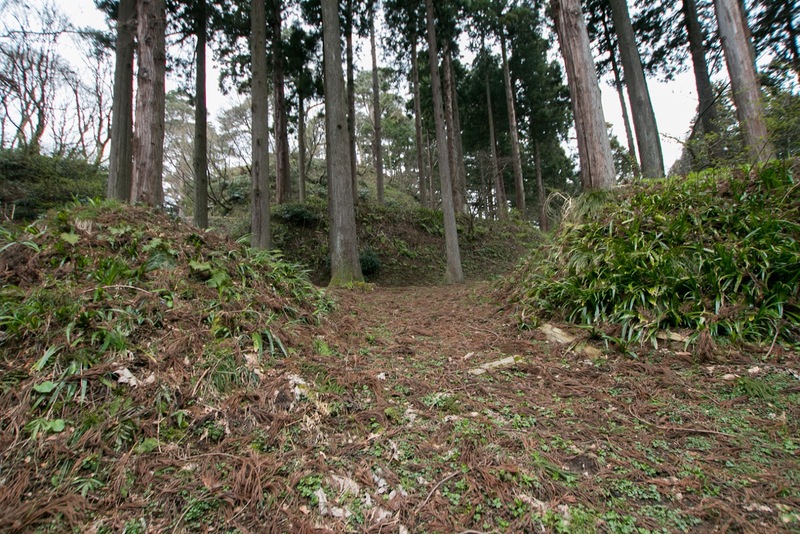 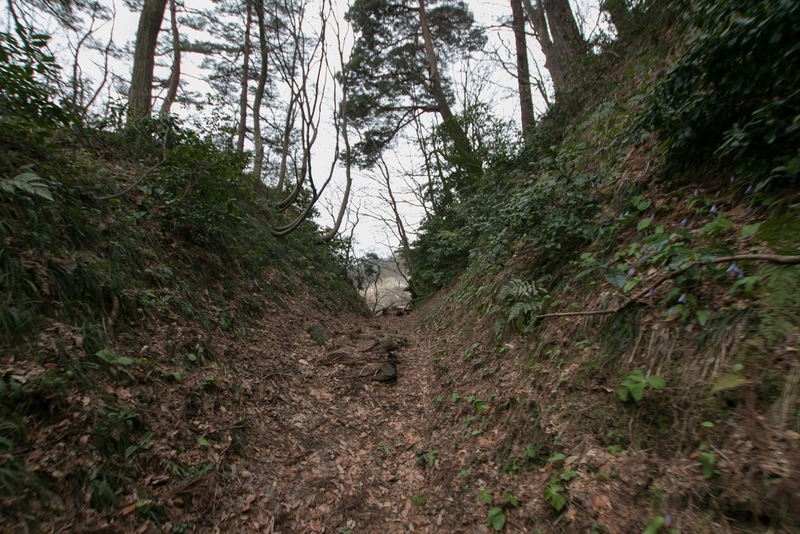 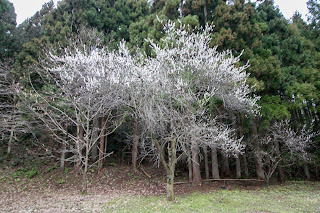 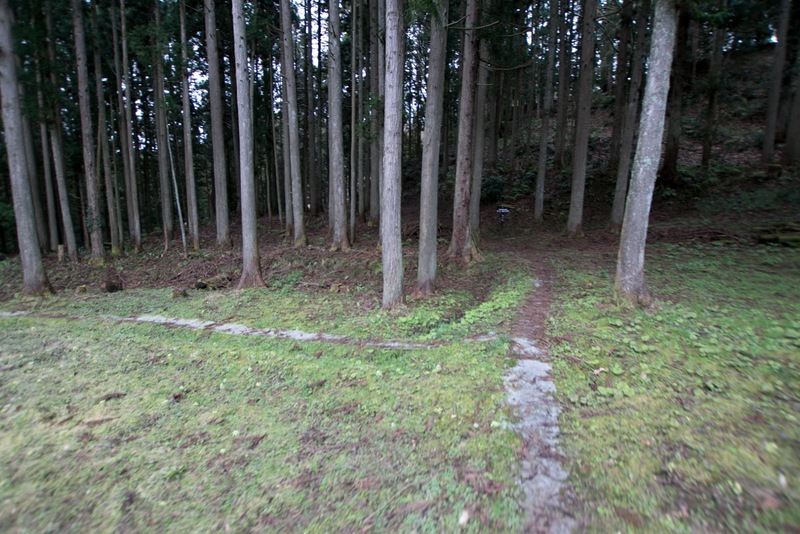 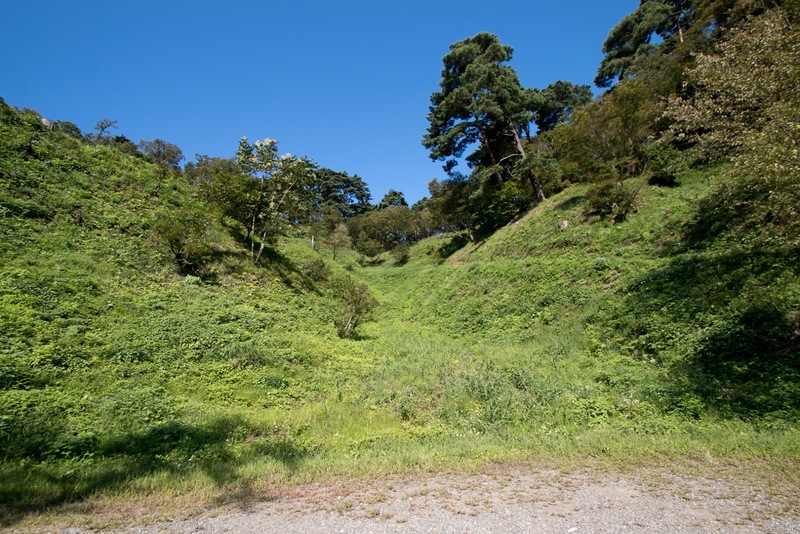 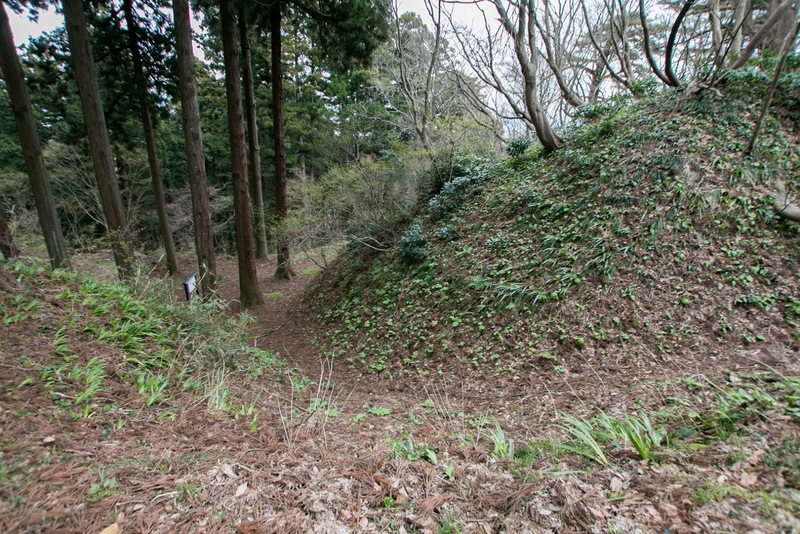 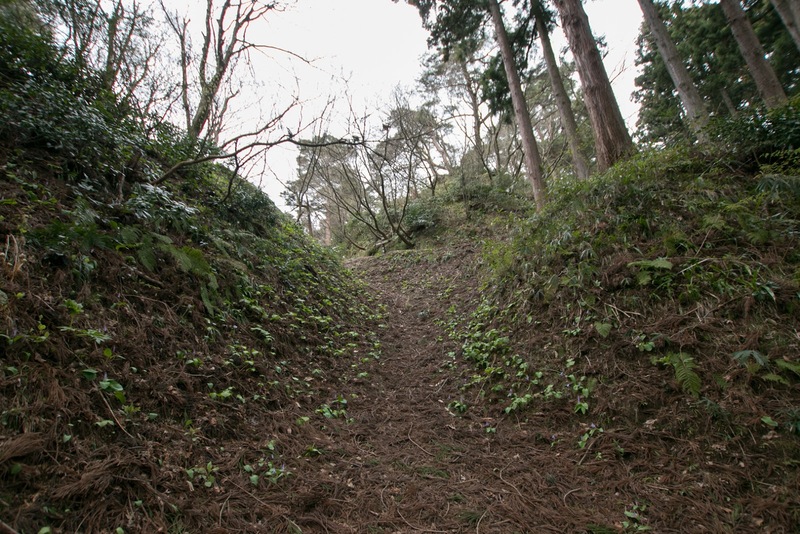 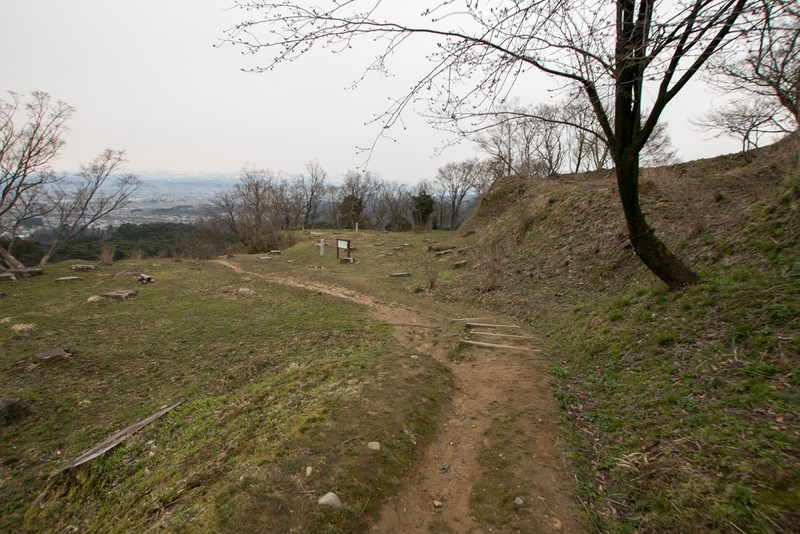 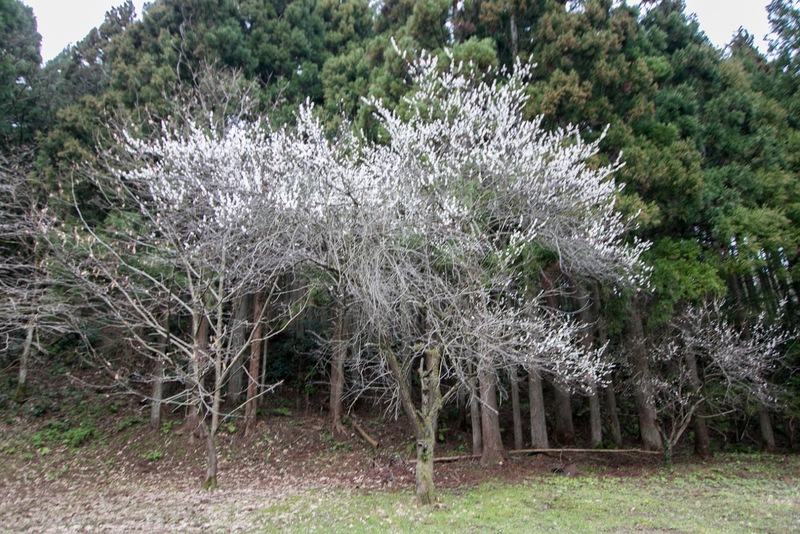 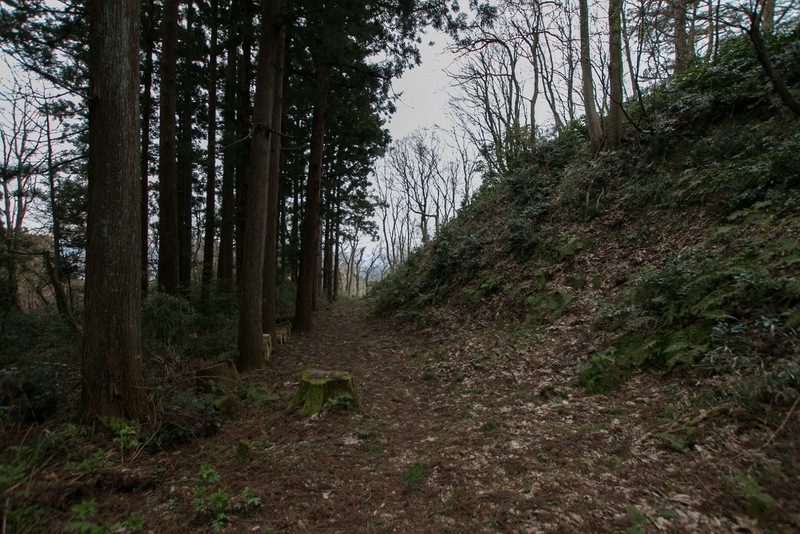 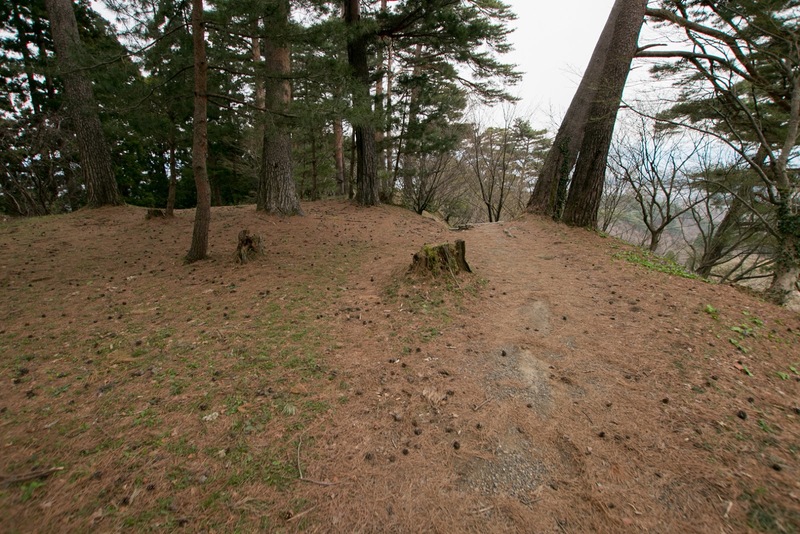 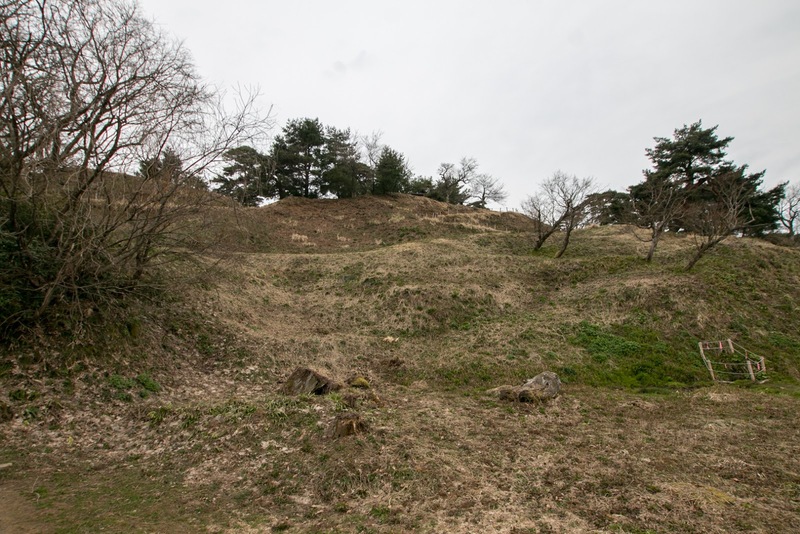 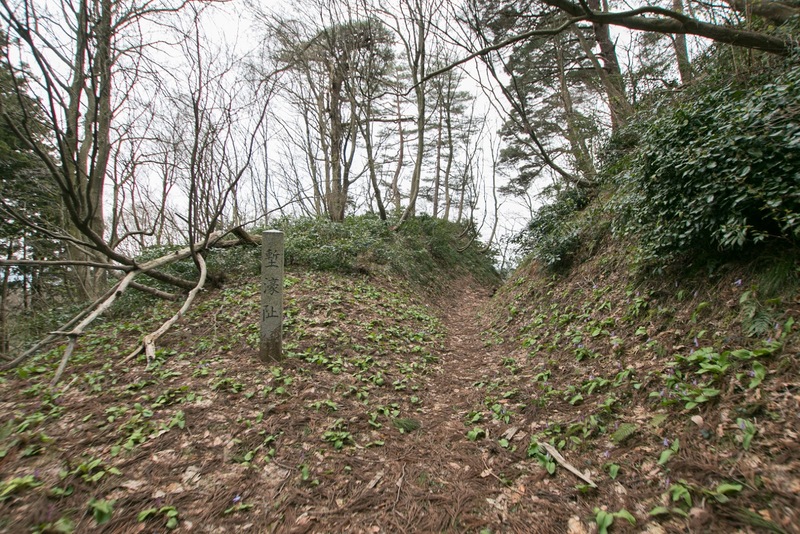 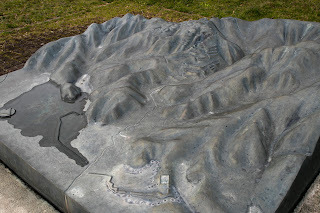 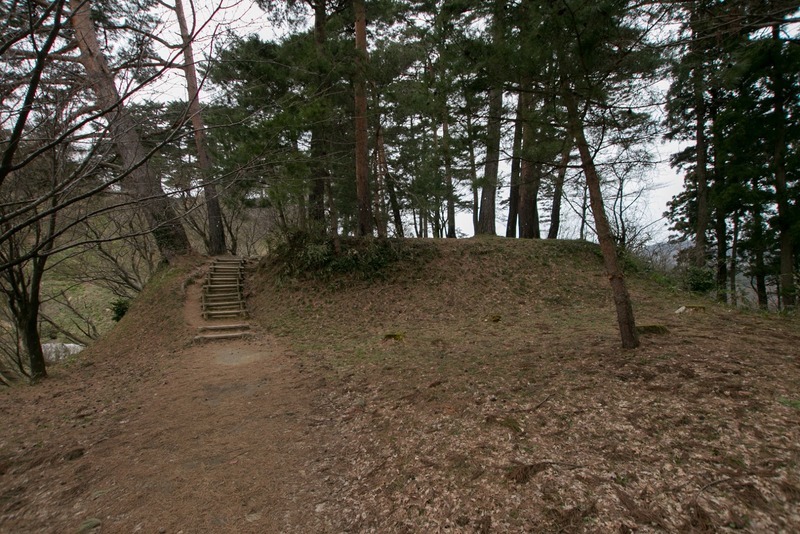 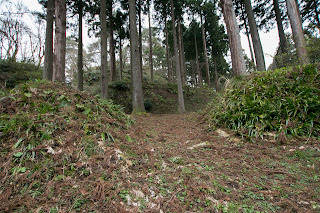 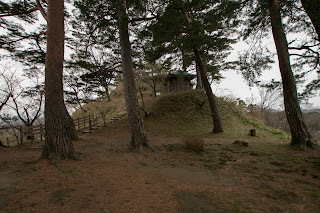 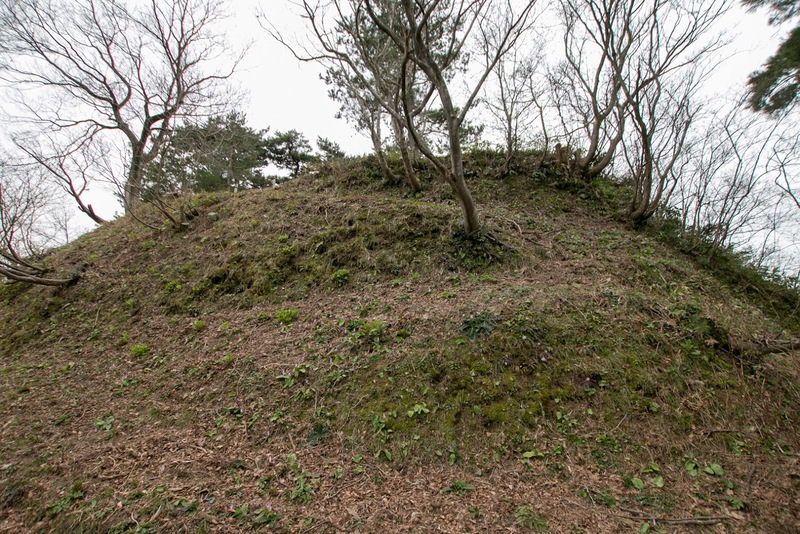 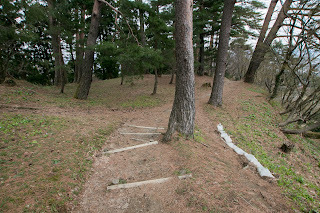 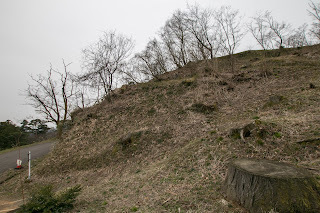 Along with the expansion of Uesugi clan, Kasugayama castle was extended all over the body of Kasugayama mountain. 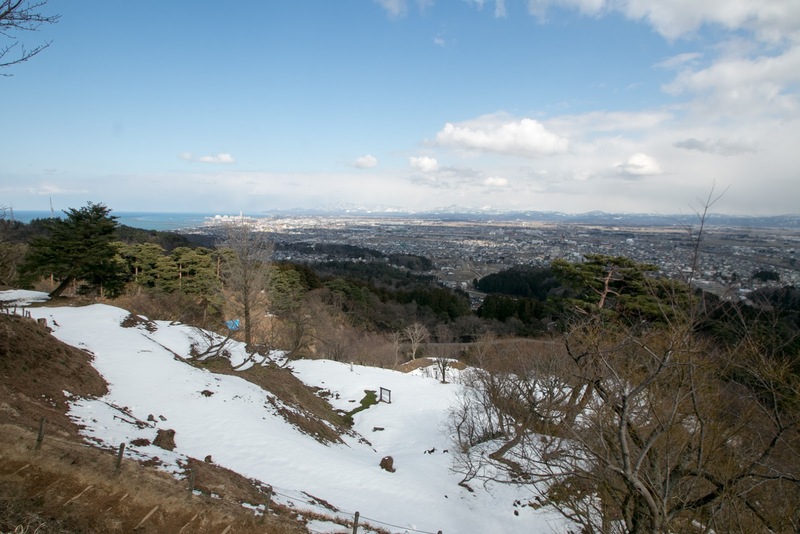 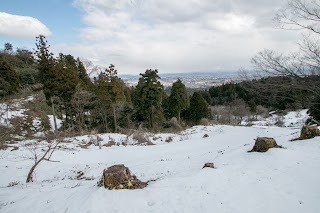 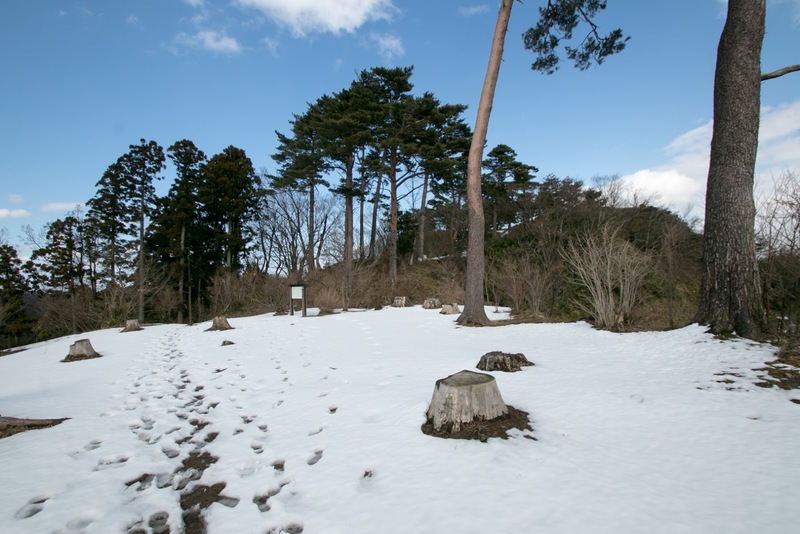 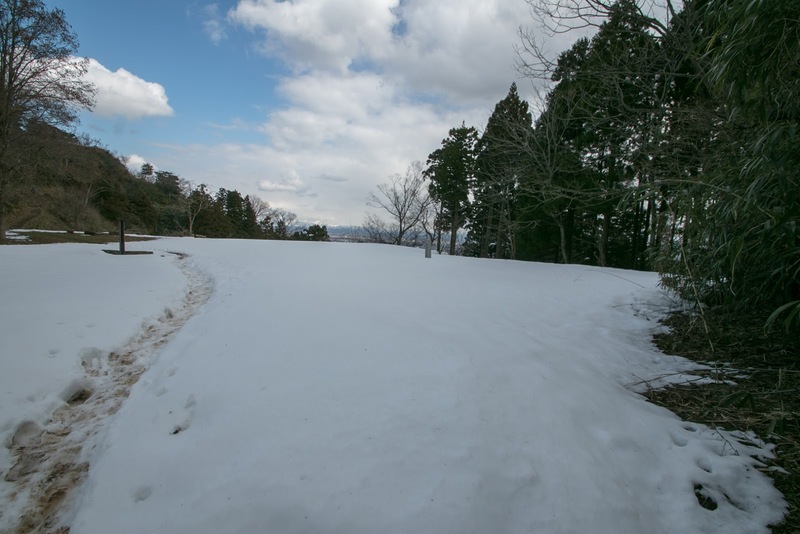 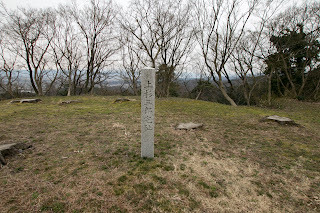 Kasugayama mountain has two ridges grew from its peak to northward and southward like wing, and major part of the castle locate at these areas. 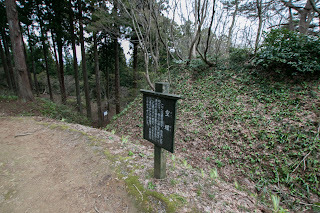 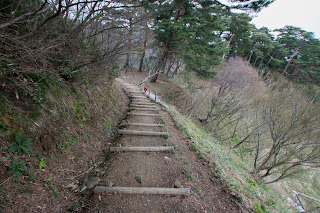 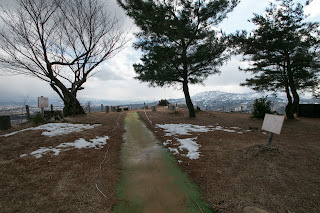 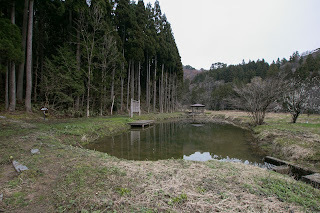 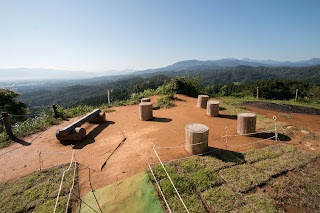 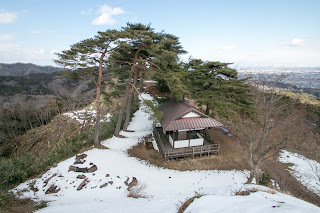 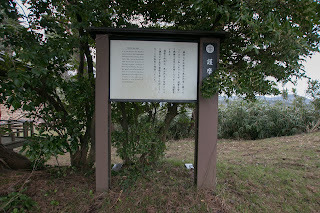 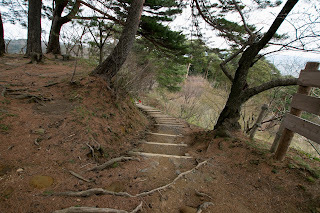 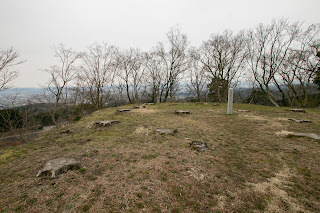 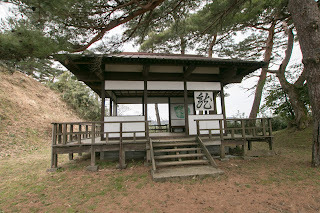 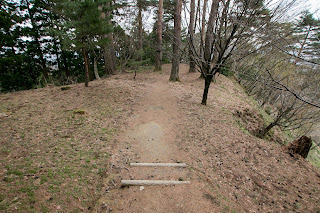 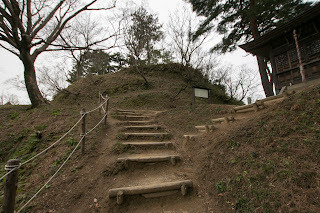 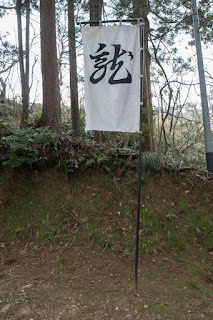 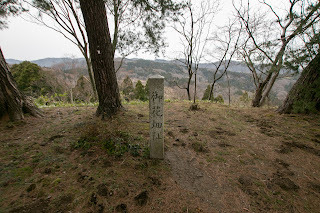 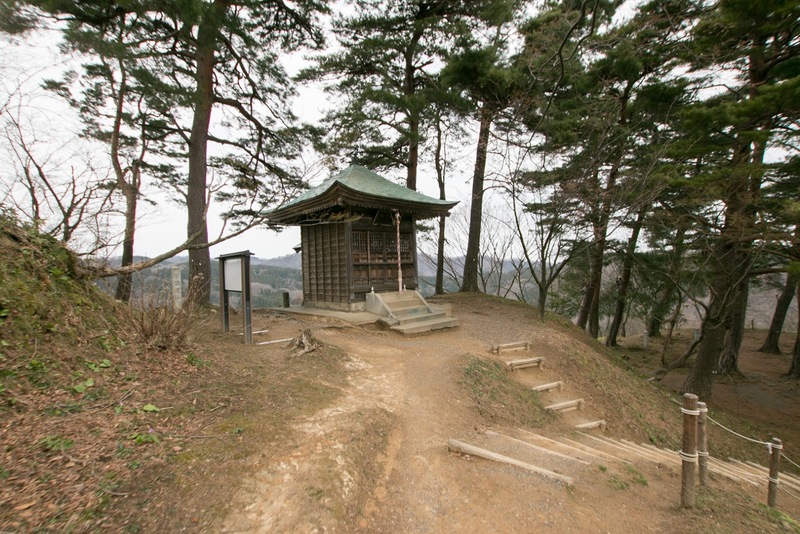 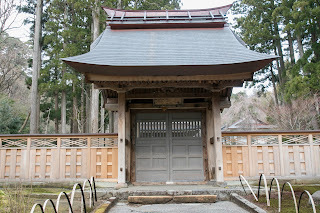 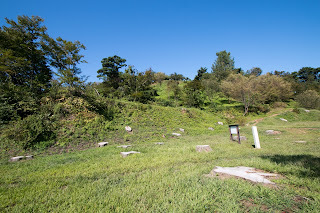 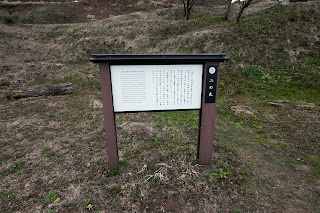 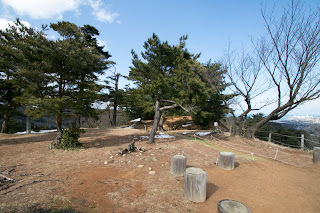 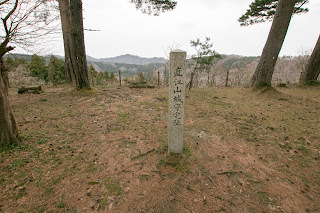 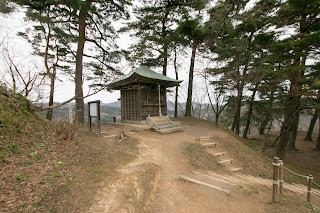 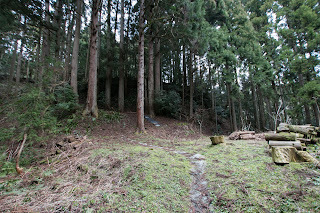 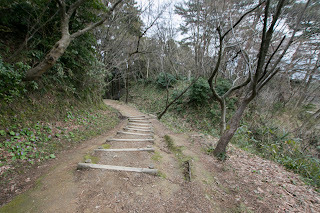 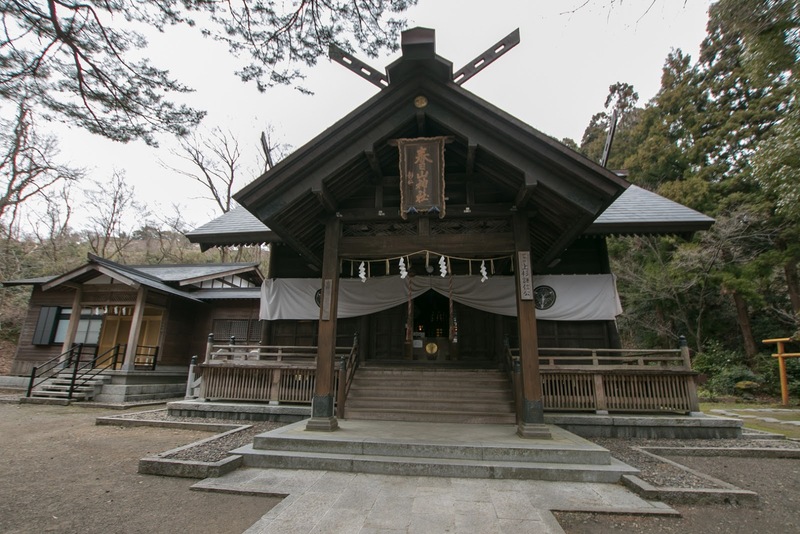 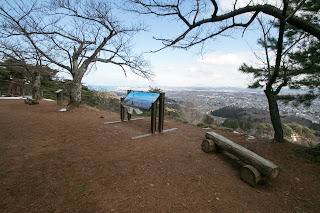 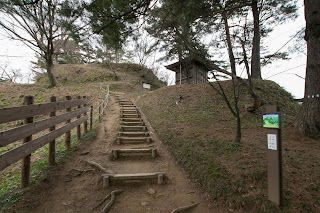 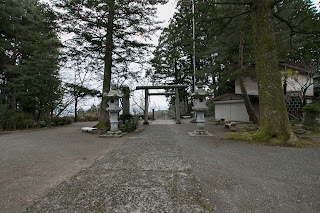 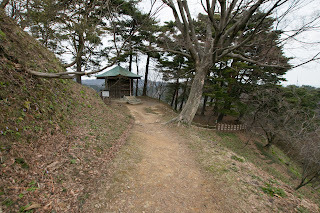 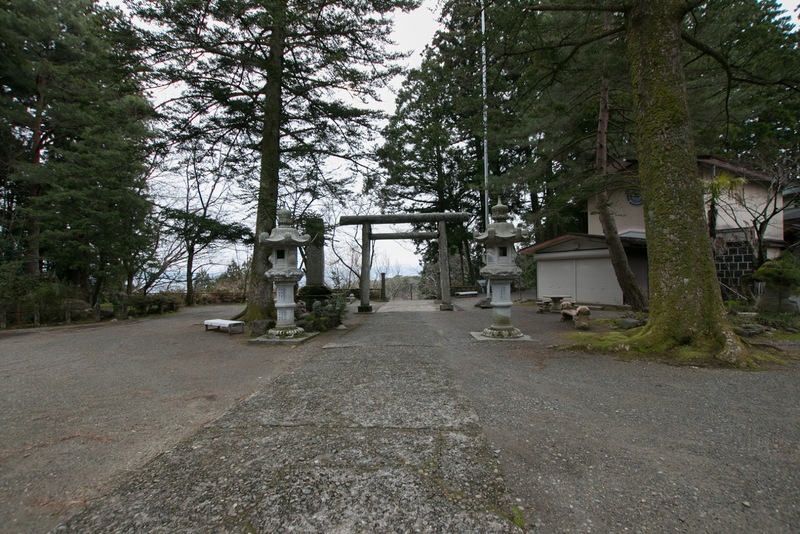 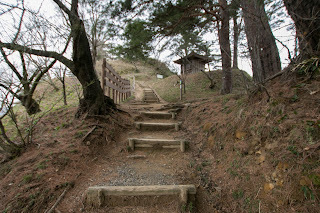 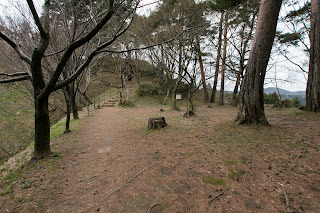 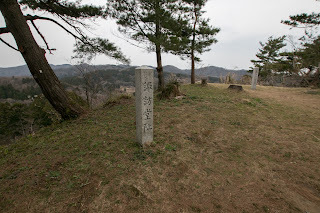 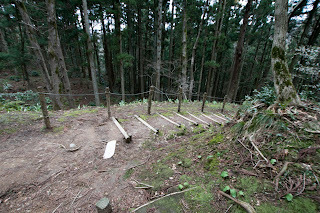 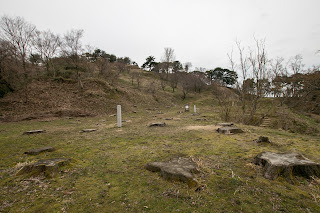 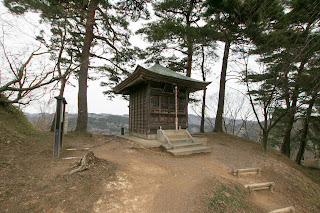 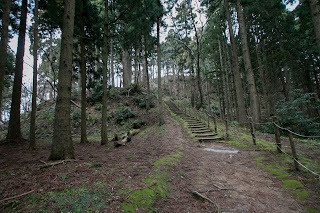 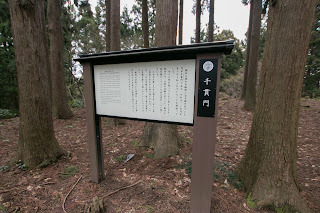 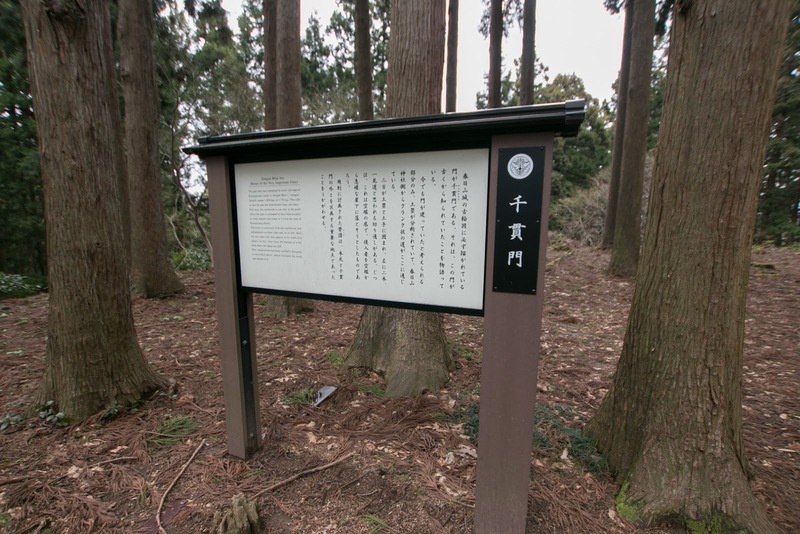 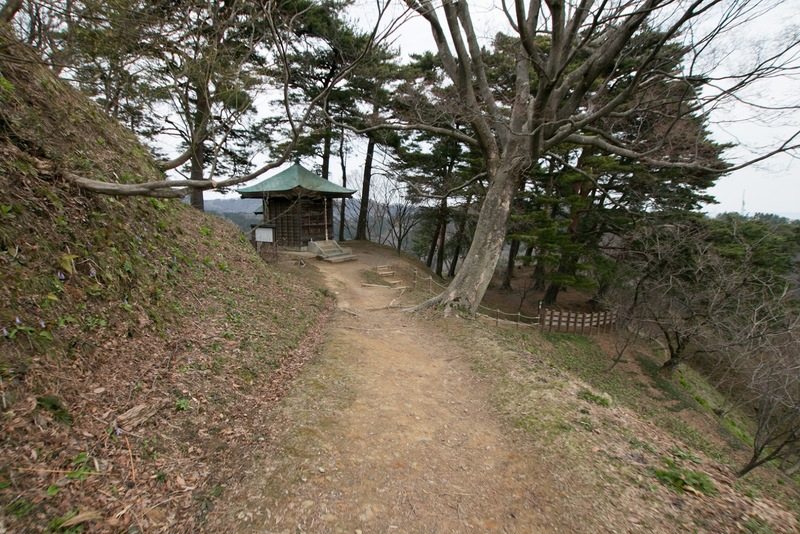 At the peak of the hill there were core areas called as Mujyo, consists of central area, watching tower area, temple hall area and garden area. 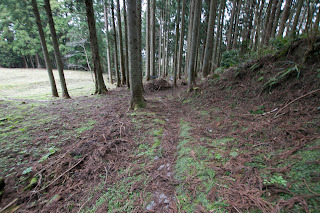 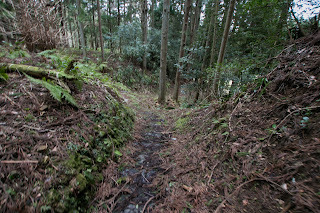 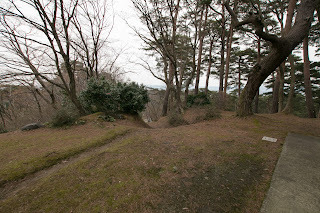 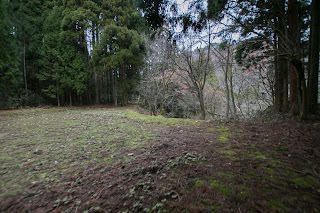 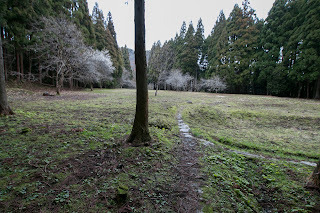 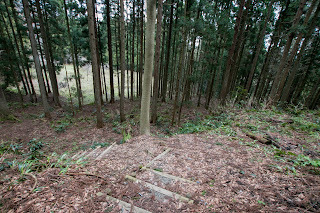 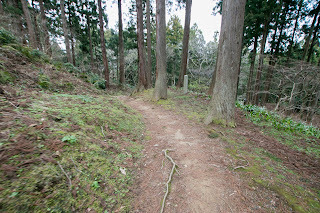 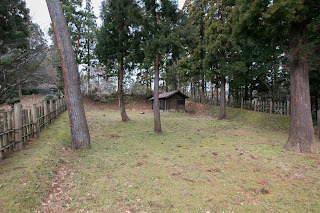 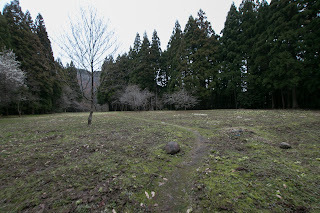 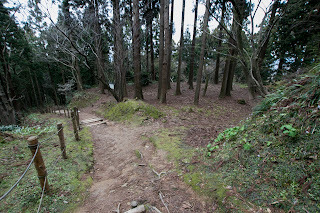 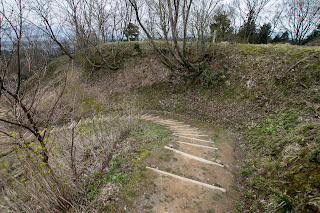 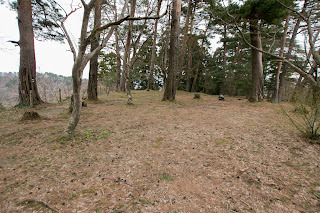 At the south ridge there was a residence of Kagekatsu Uesugi (1556-1623), an adopted son of Kenshin just below Mujyo area, and below this there was a large terrace used for the residence of Kageie Kakizaki (1513-1575), an important retainer of Kenshin. 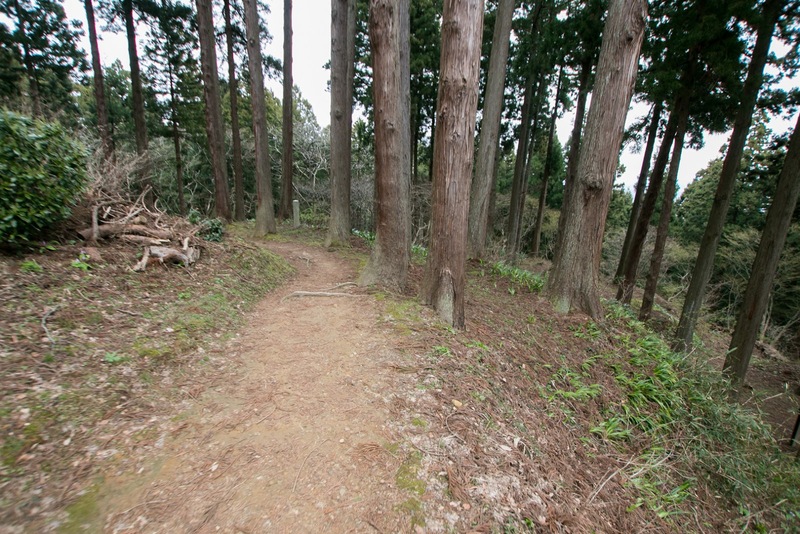 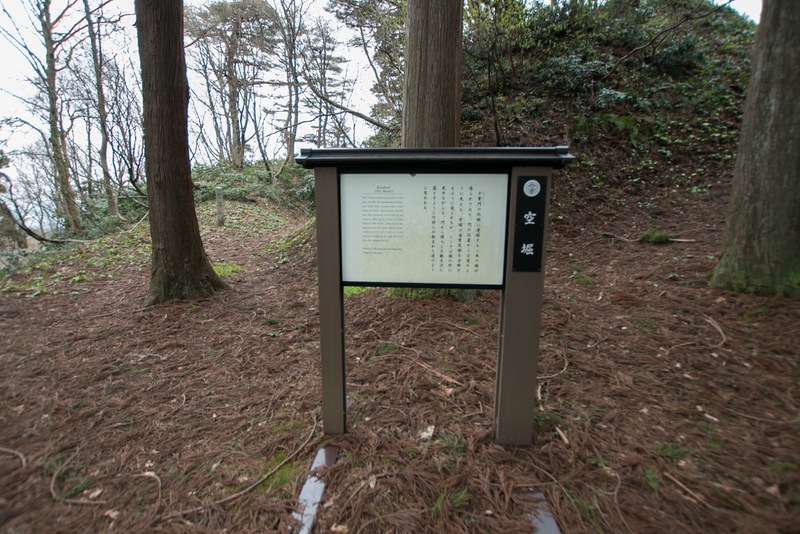 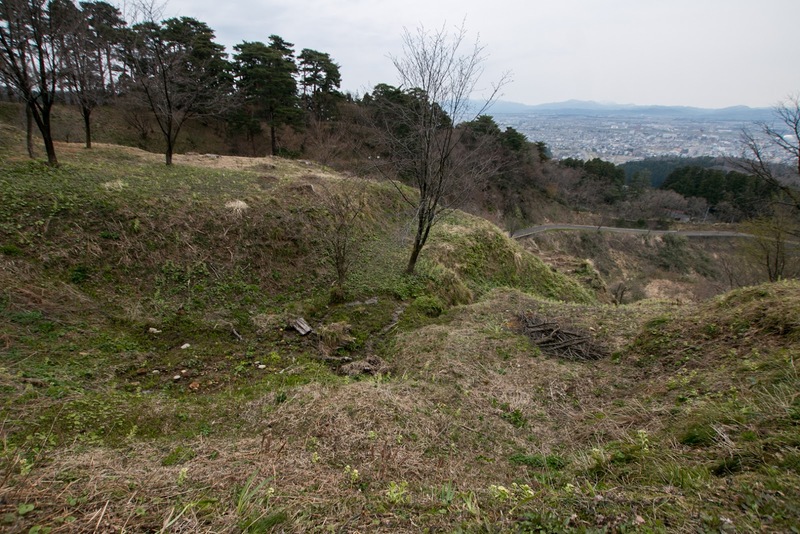 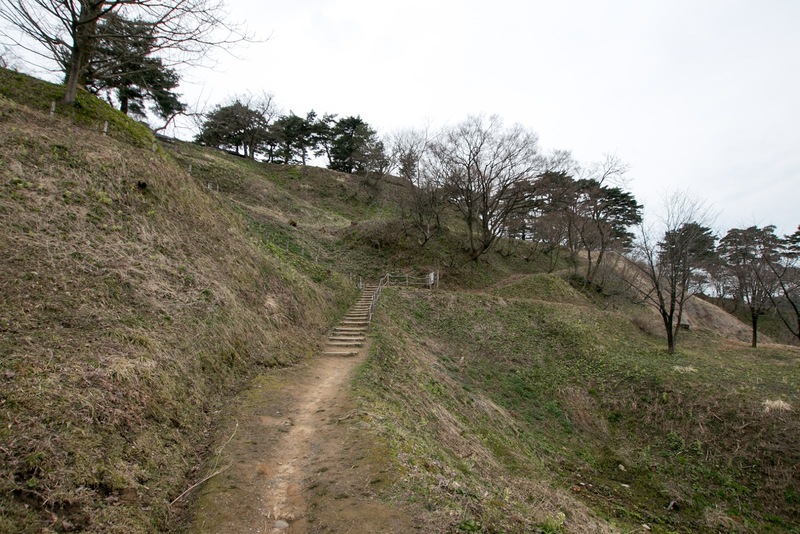 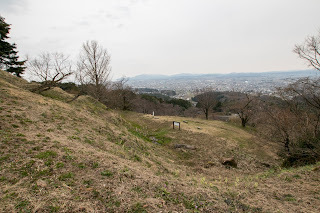 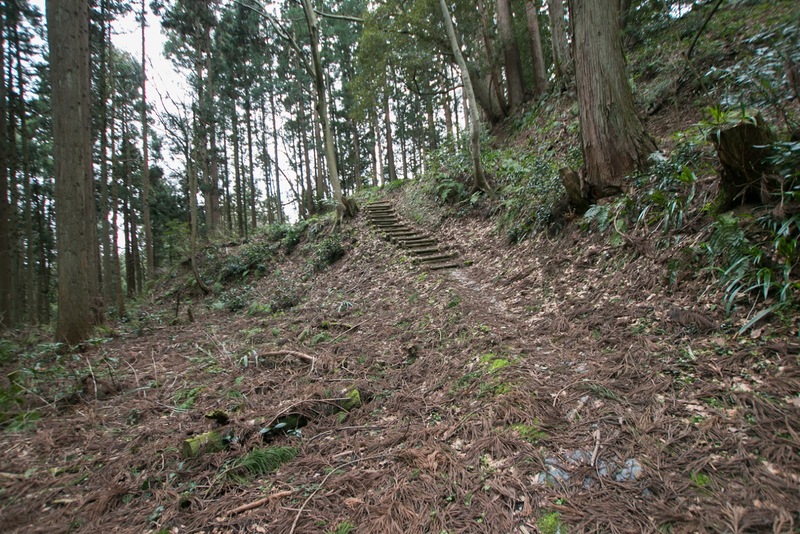 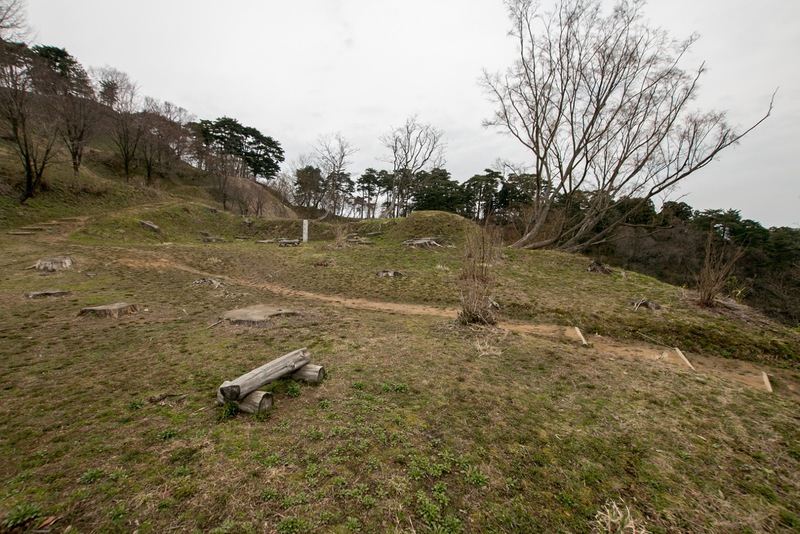 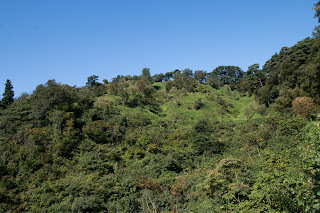 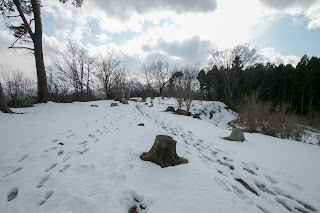 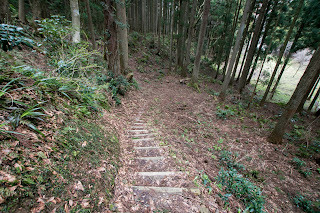 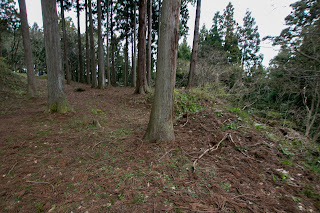 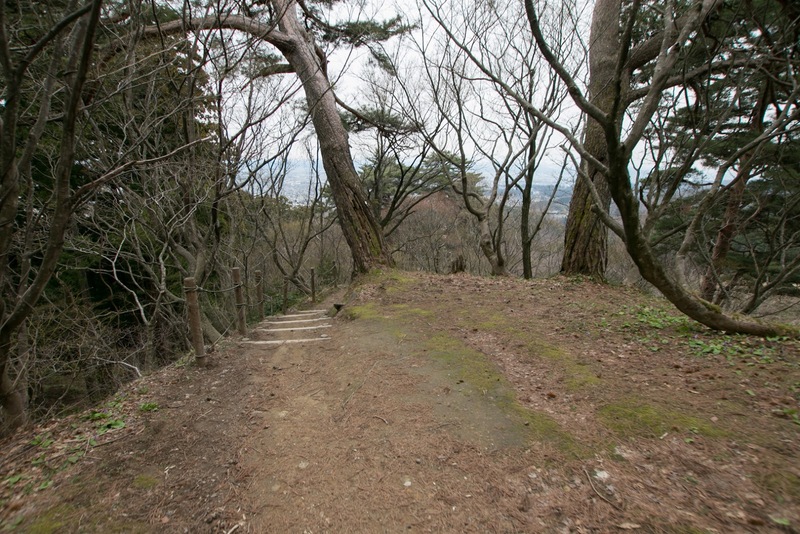 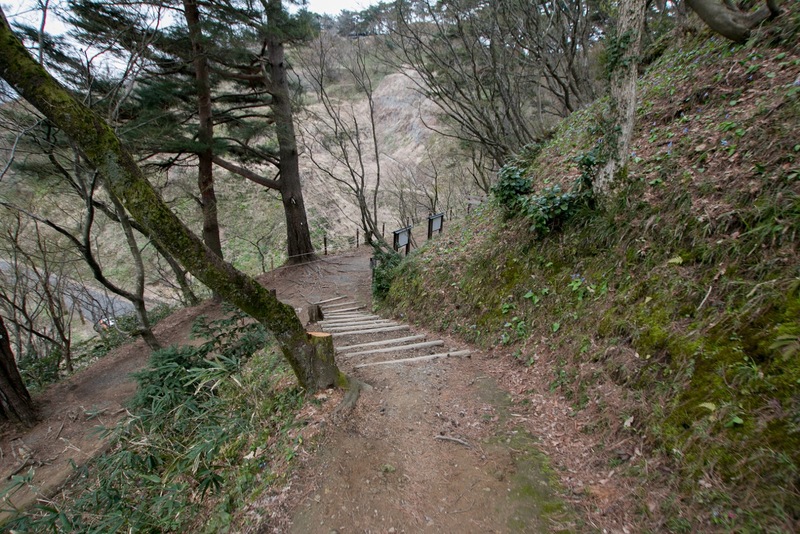 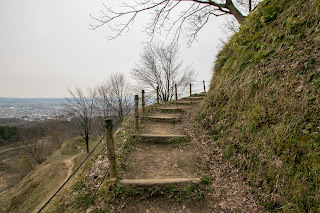 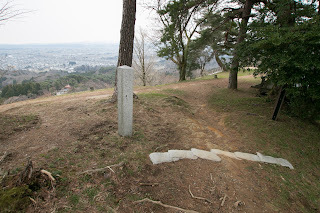 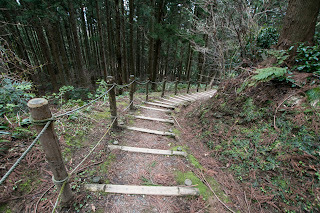 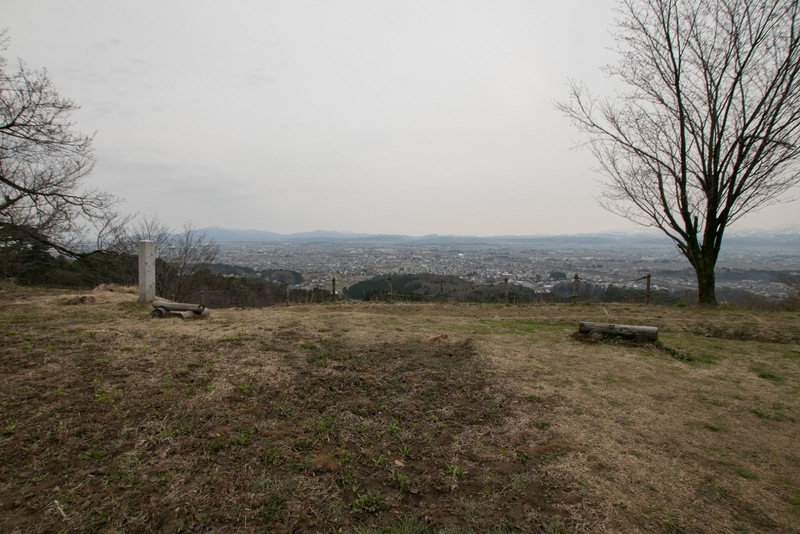 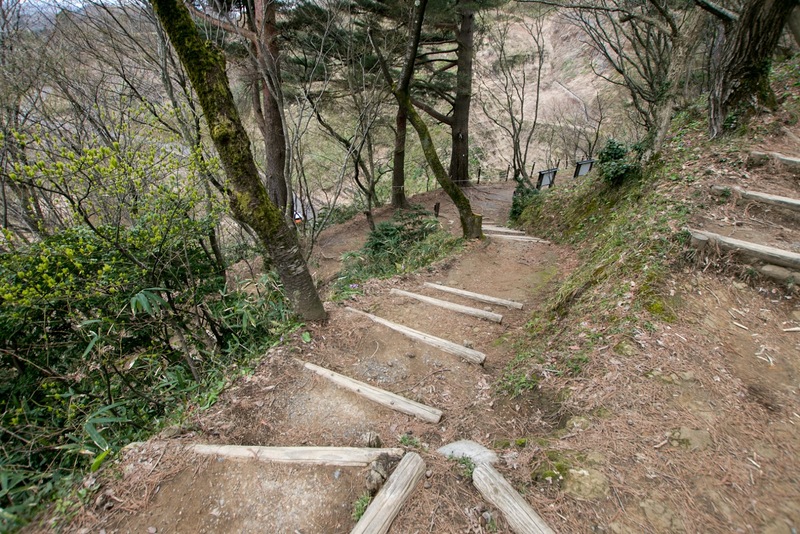 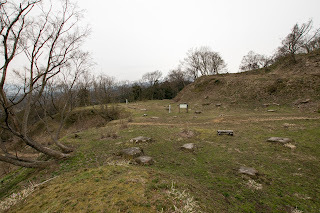 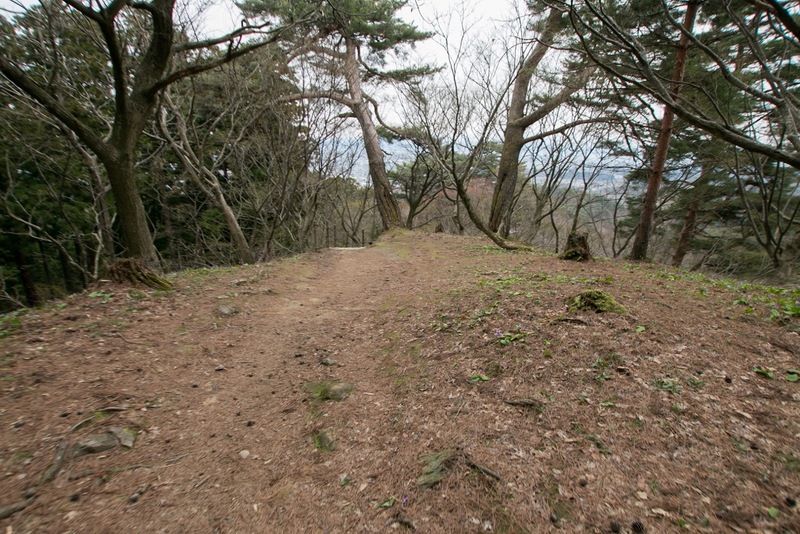 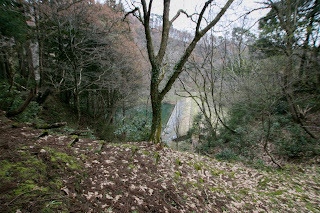 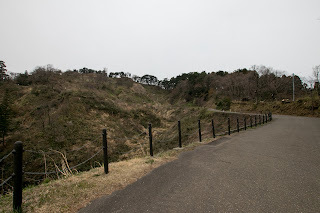 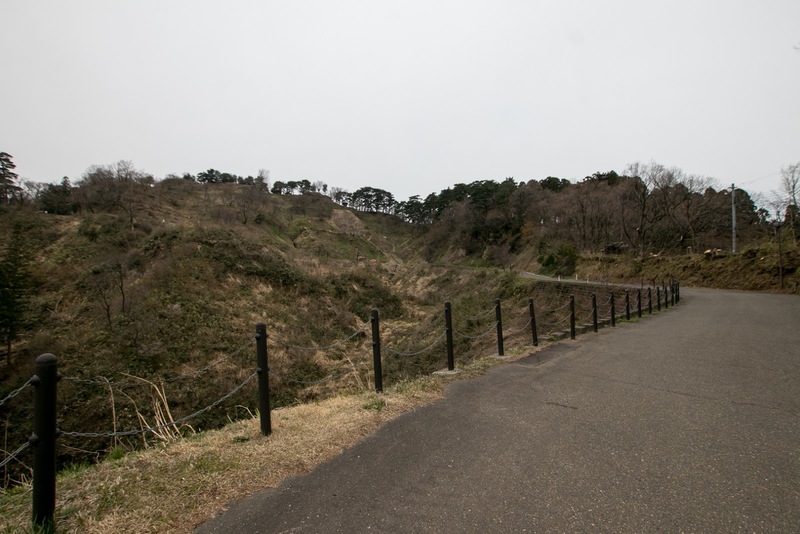 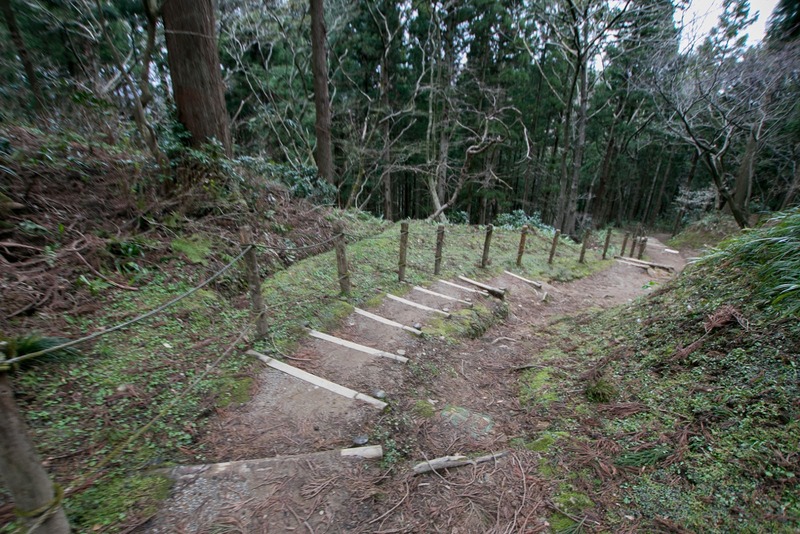 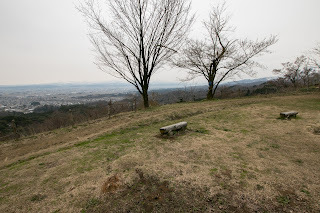 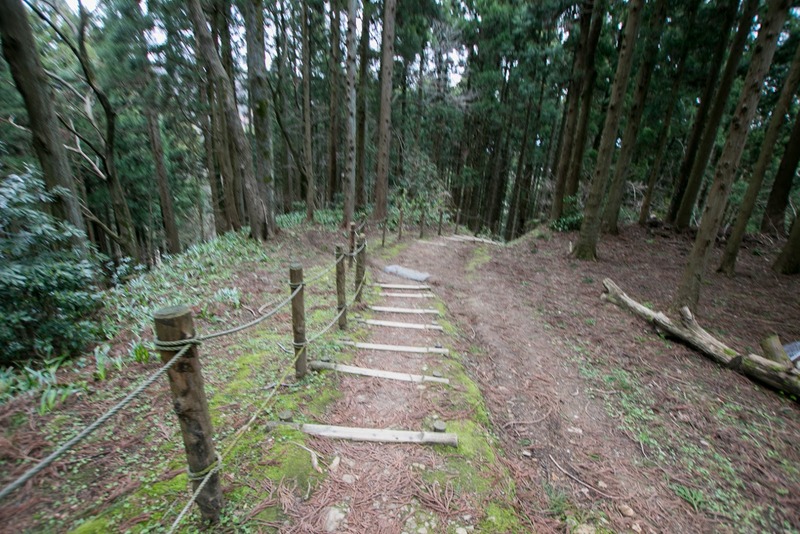 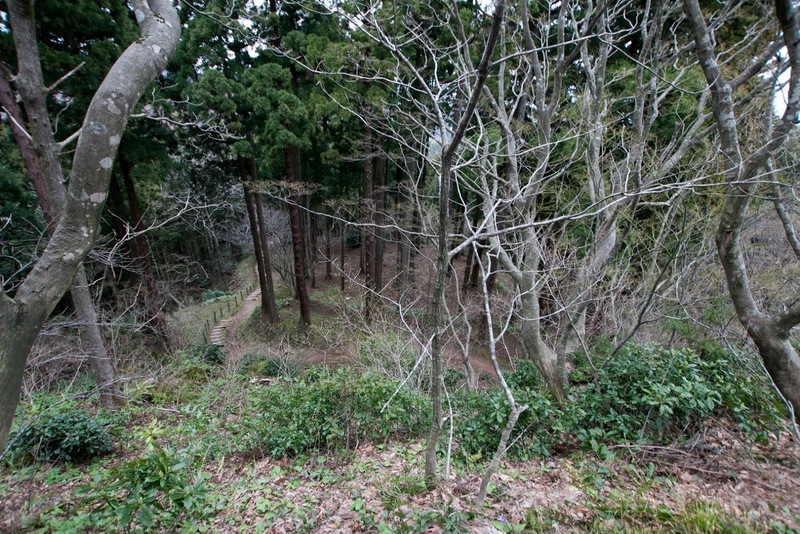 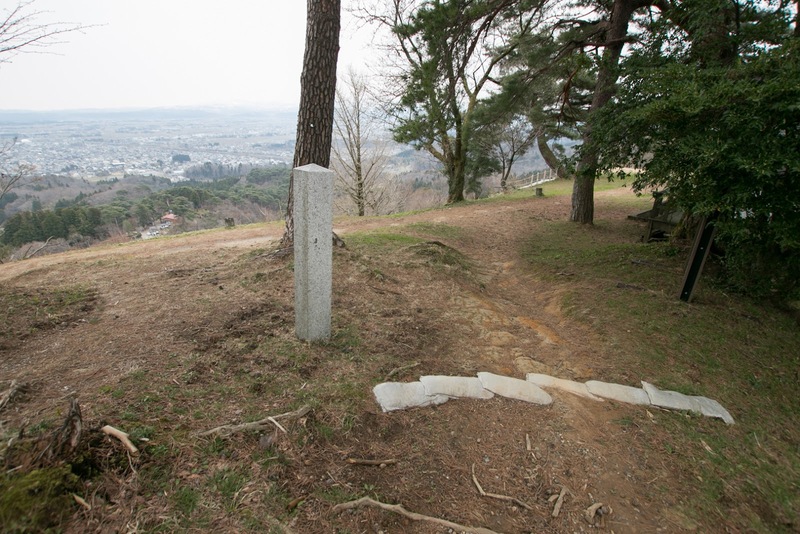 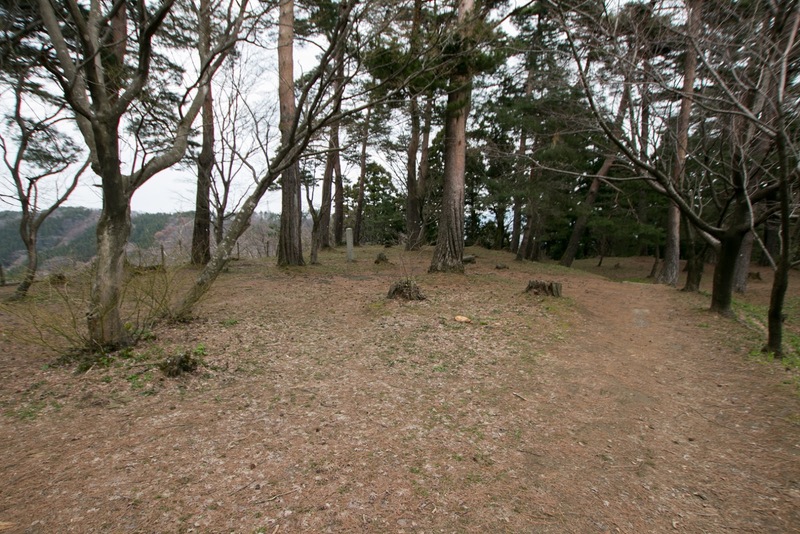 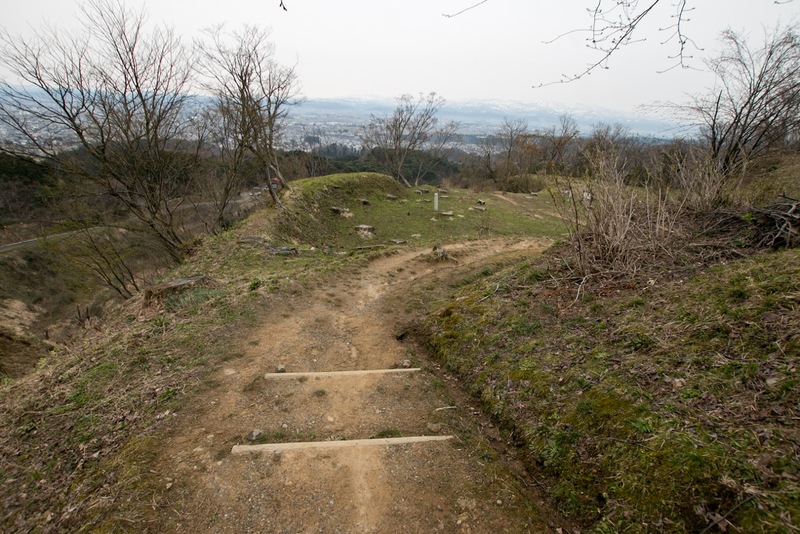 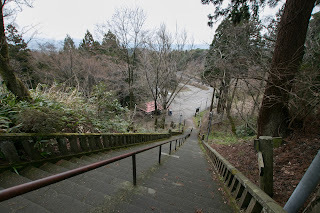 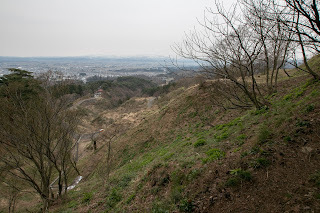 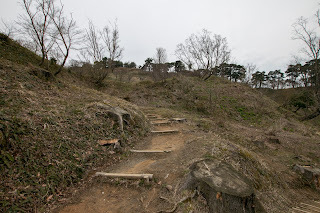 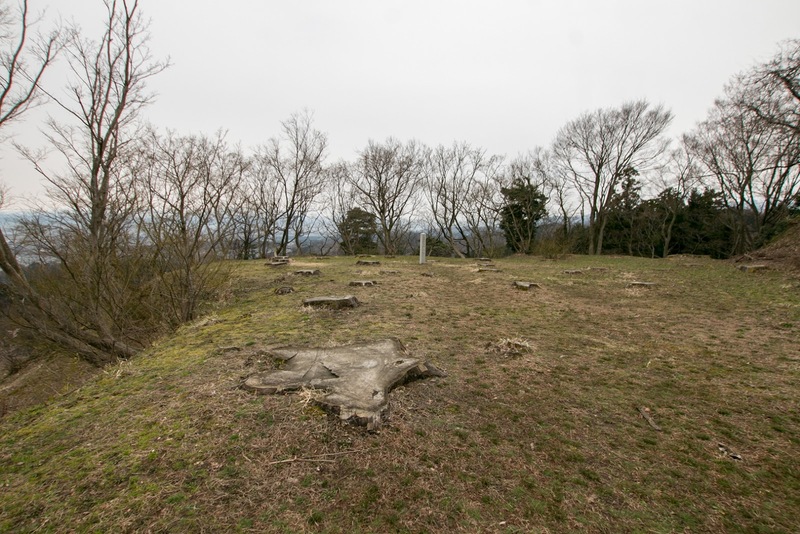 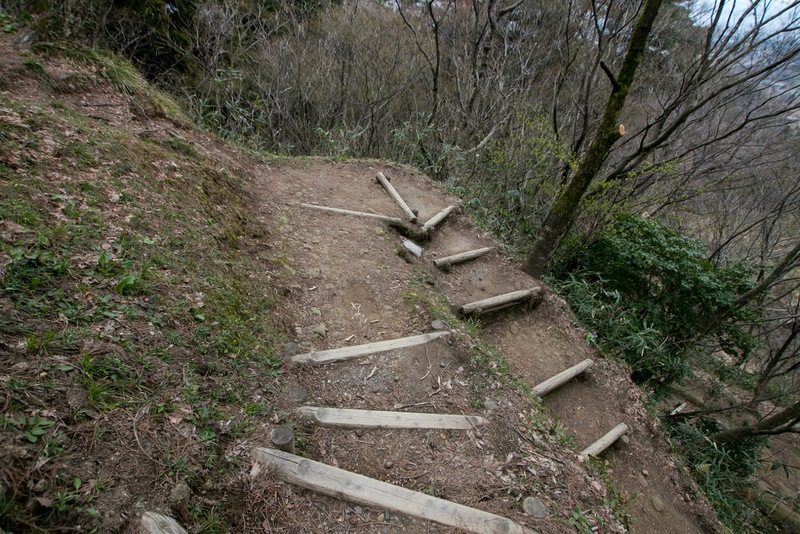 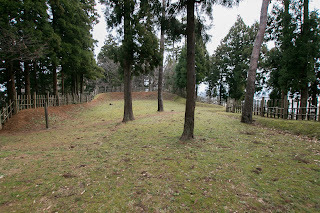 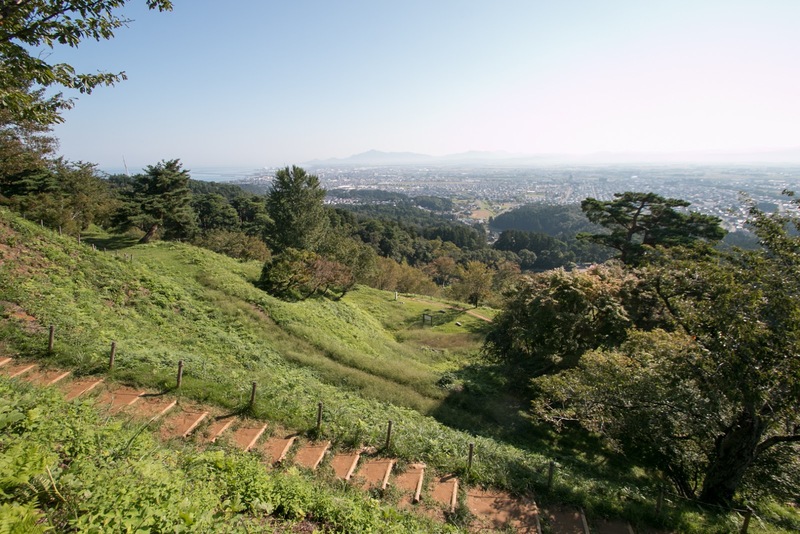 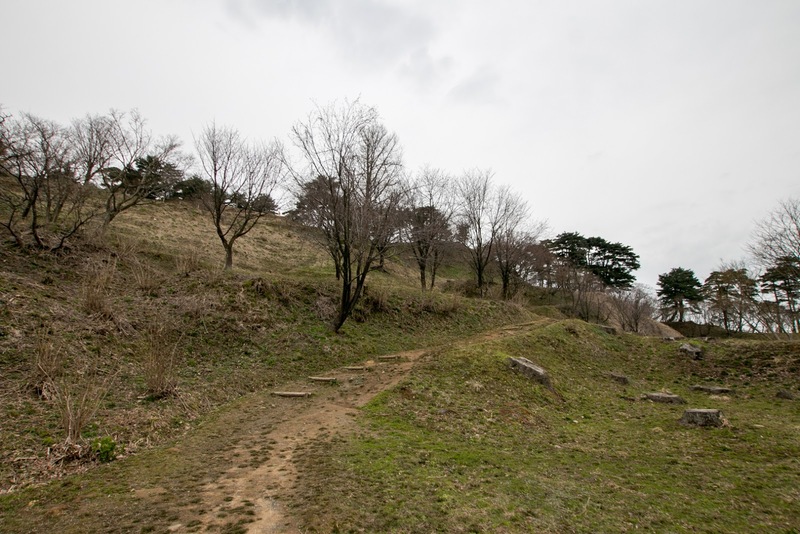 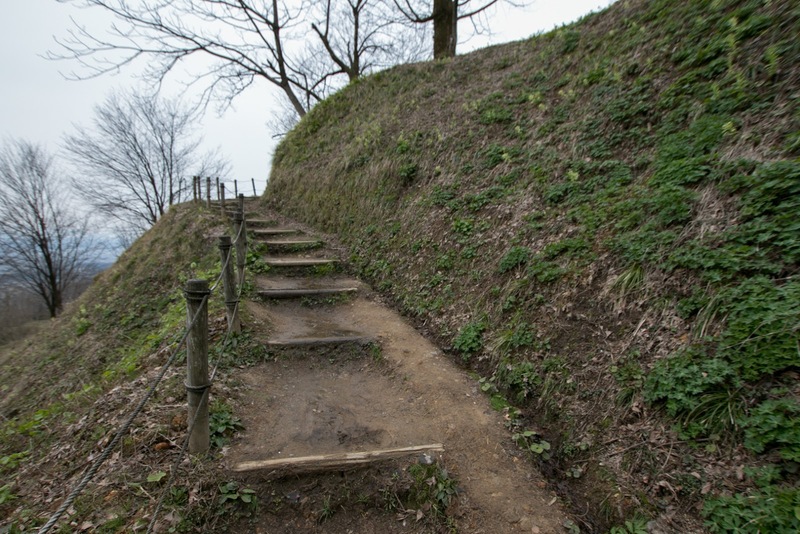 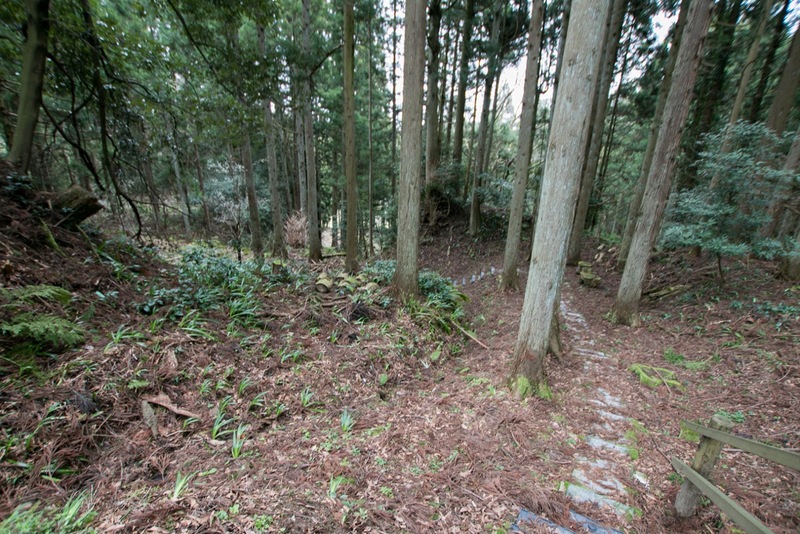 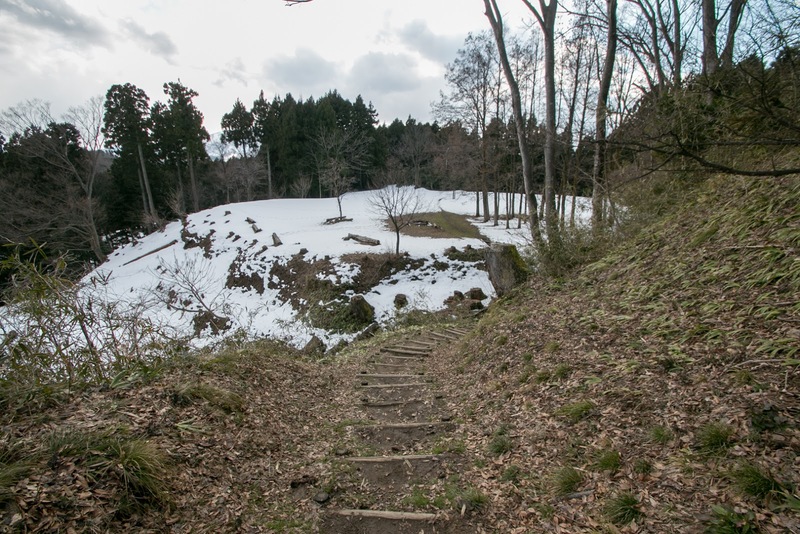 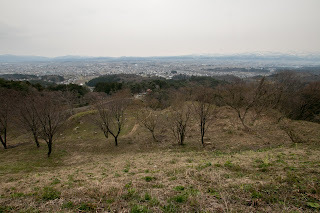 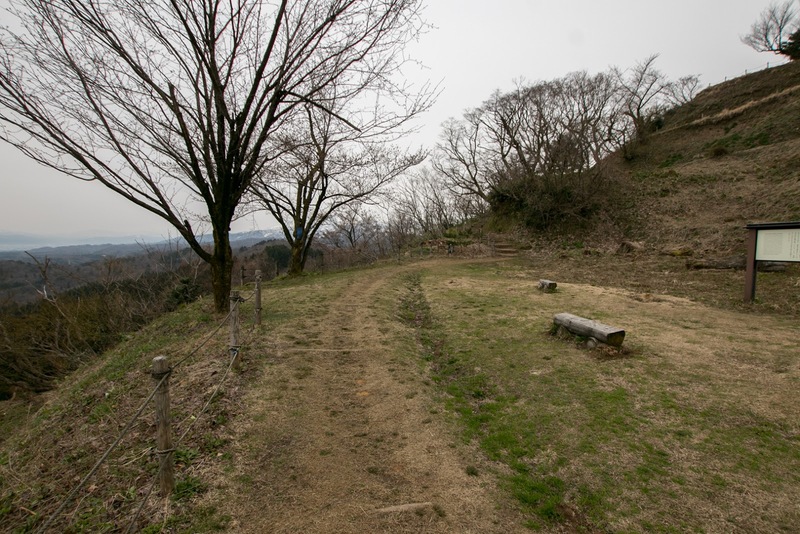 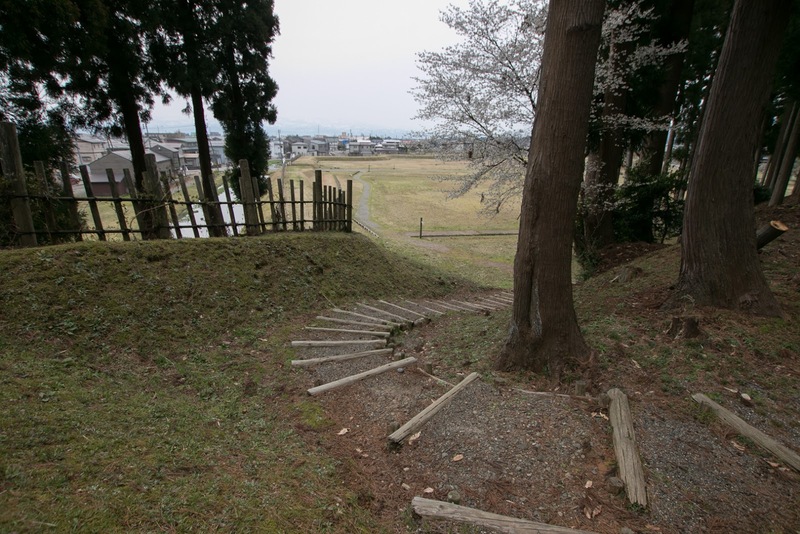 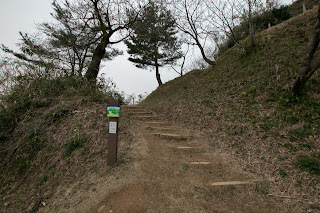 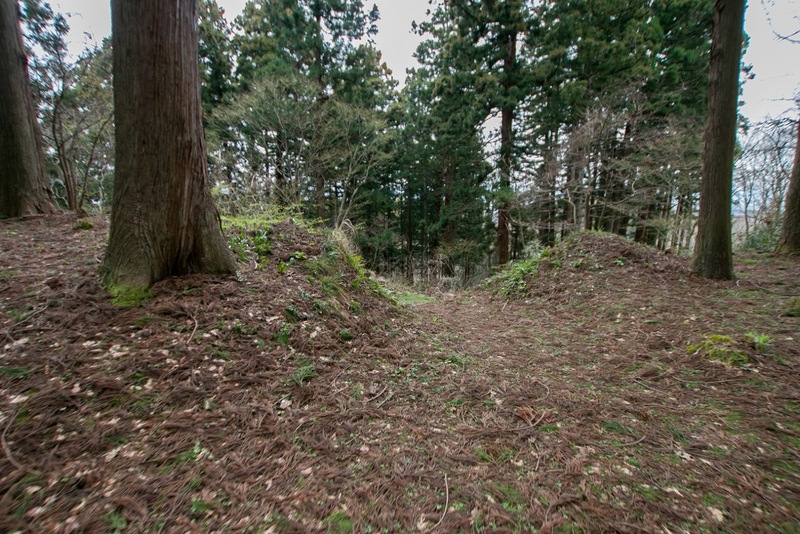 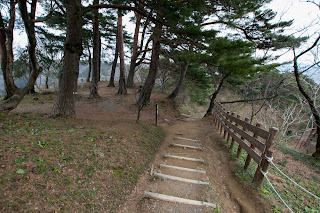 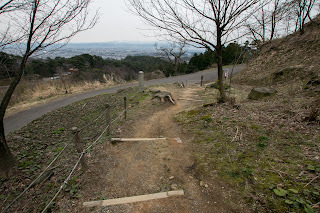 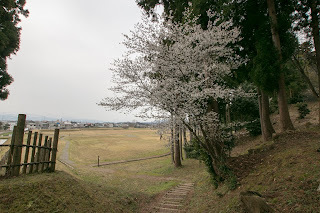 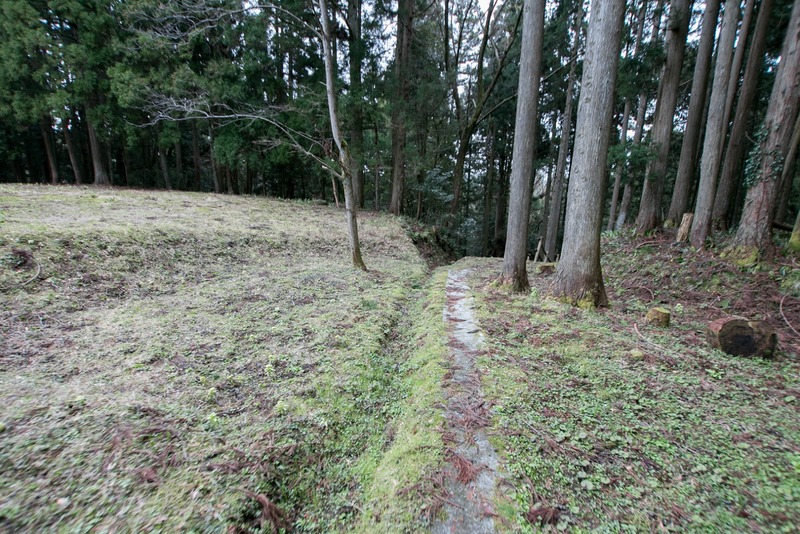 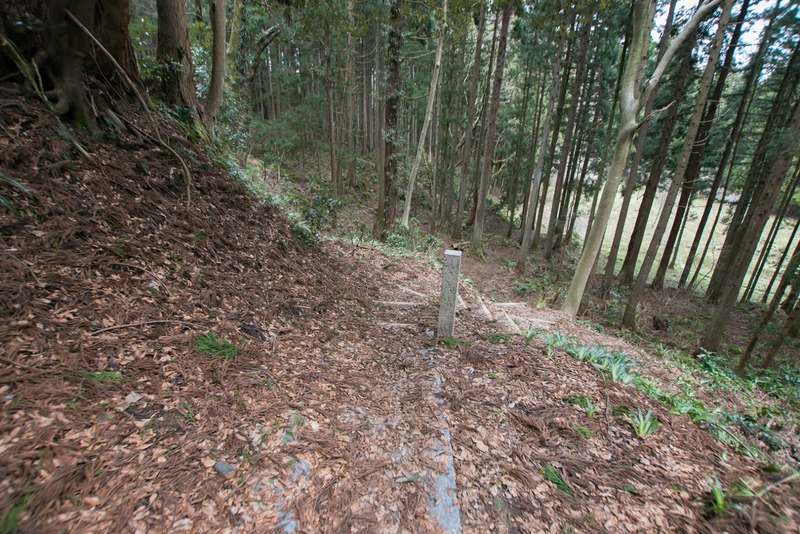 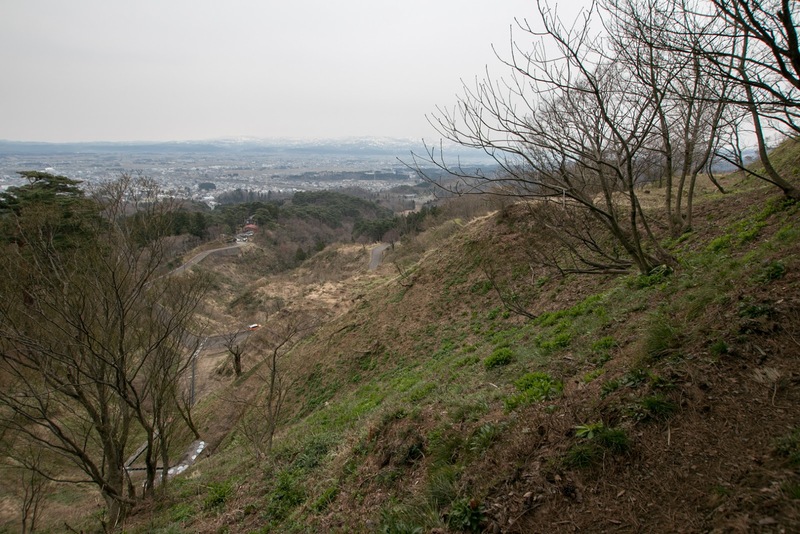 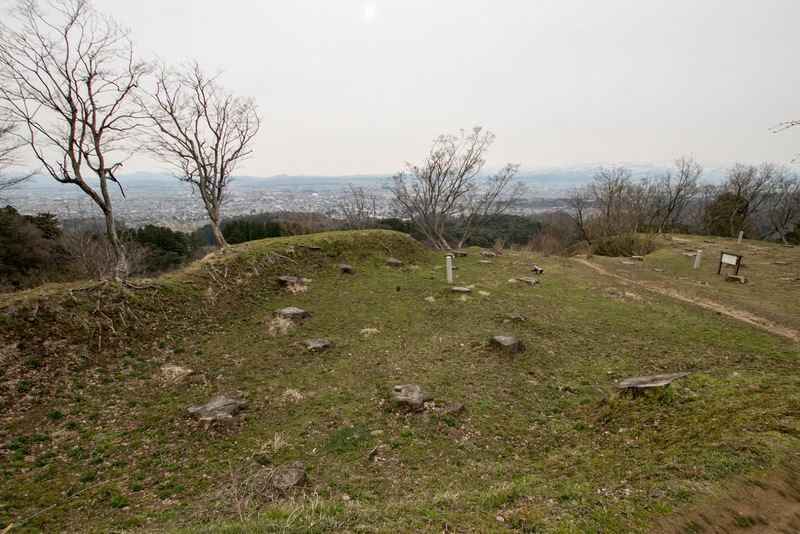 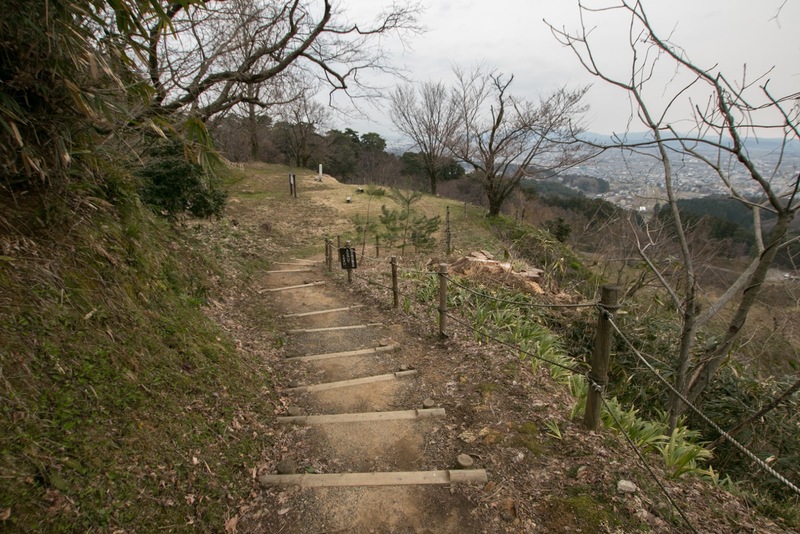 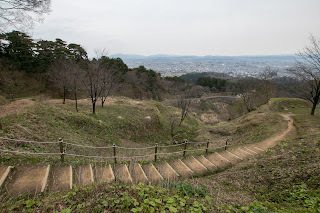 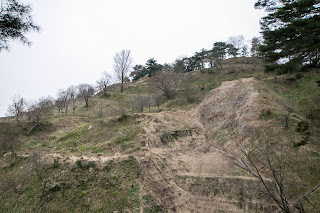 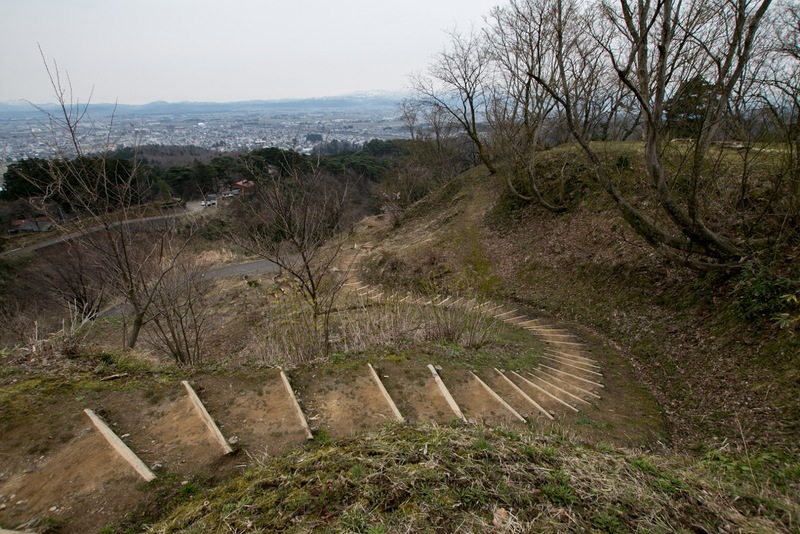 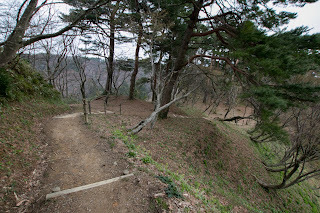 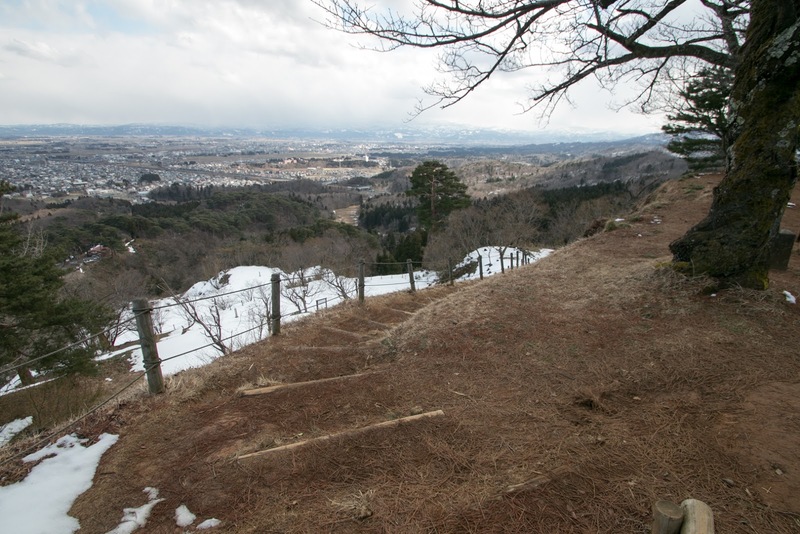 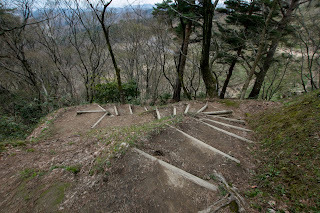 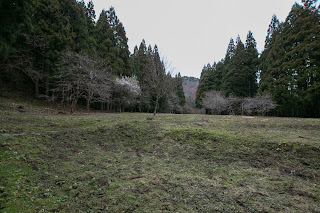 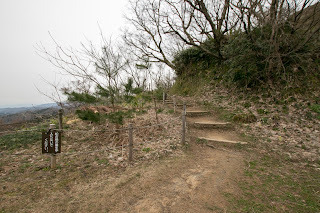 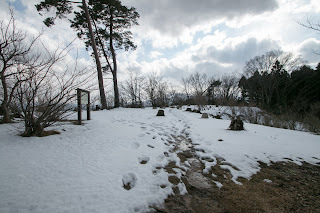 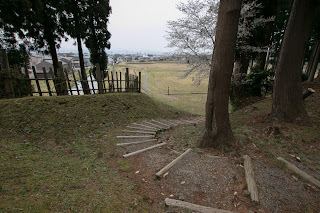 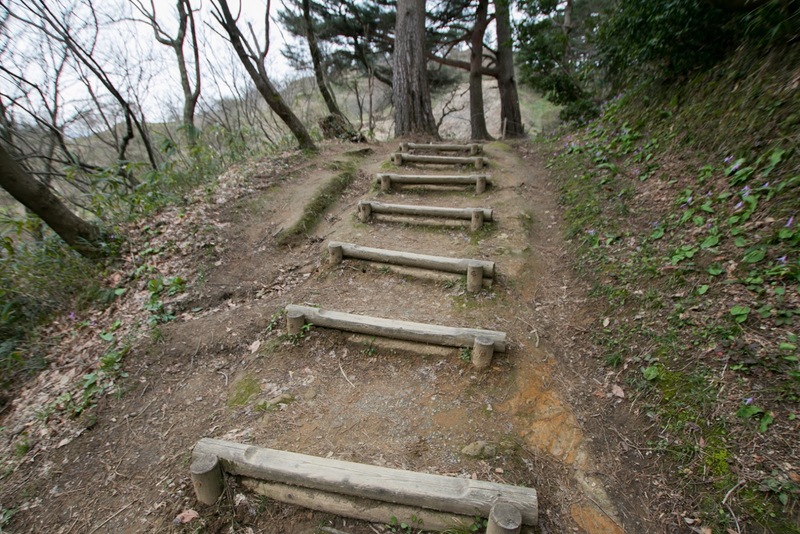 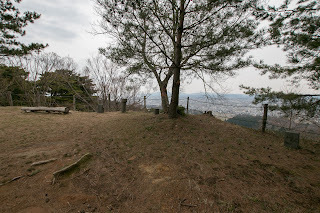 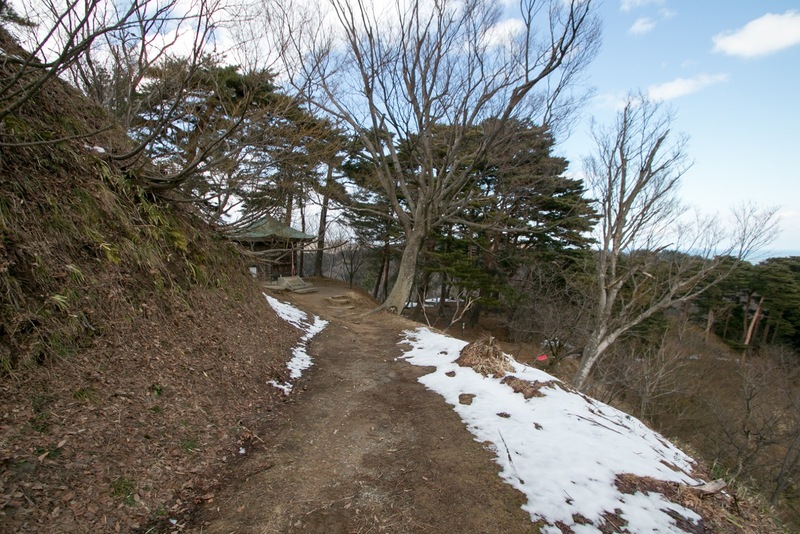 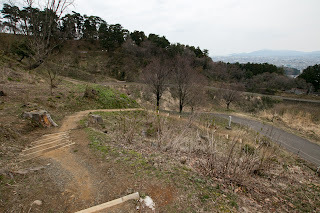 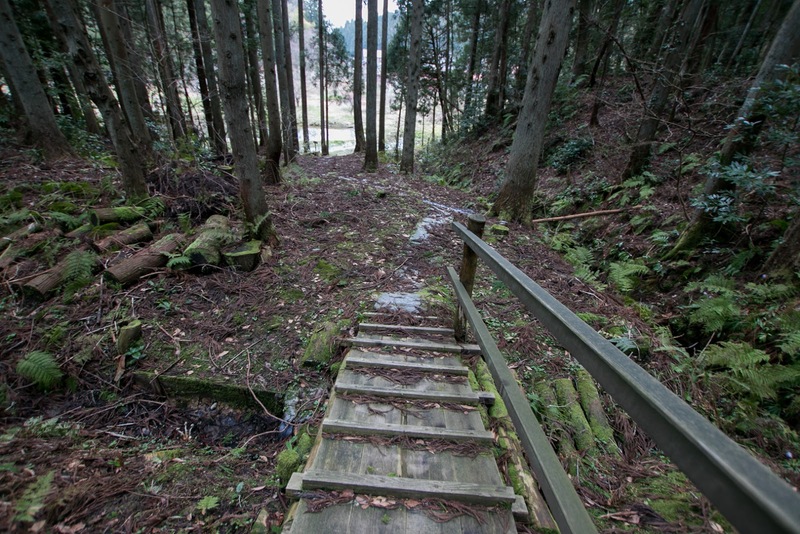 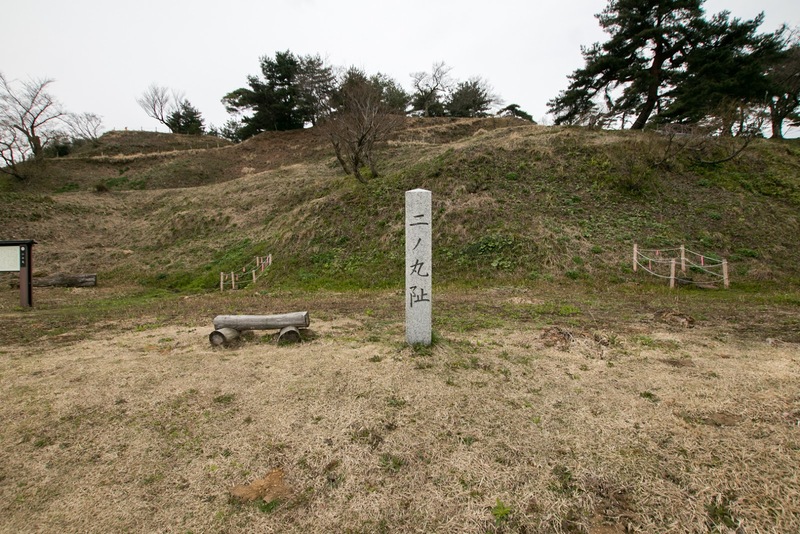 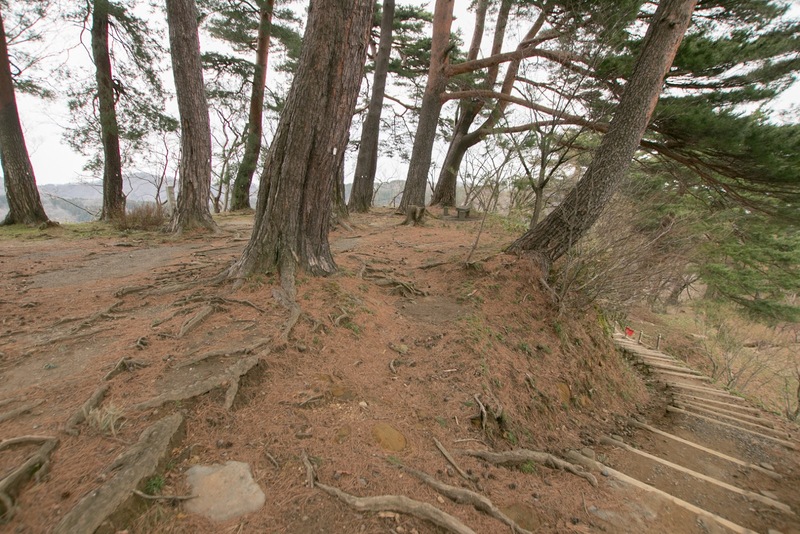 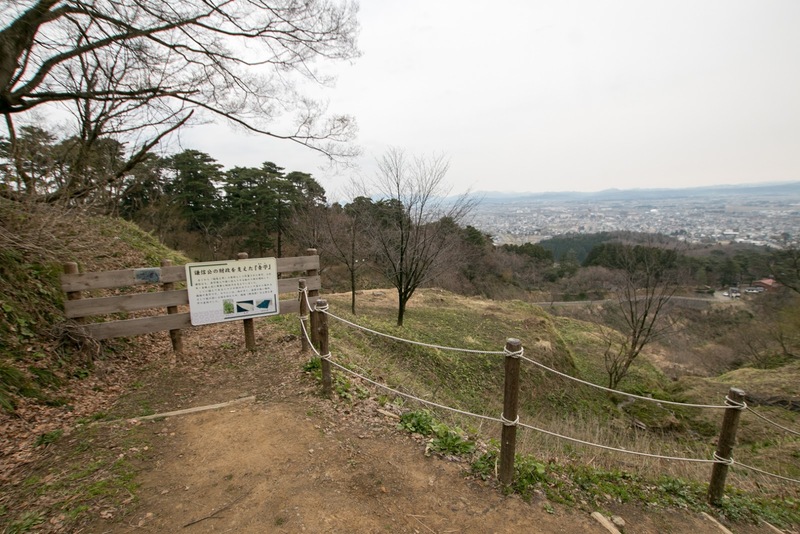 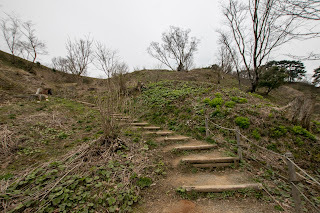 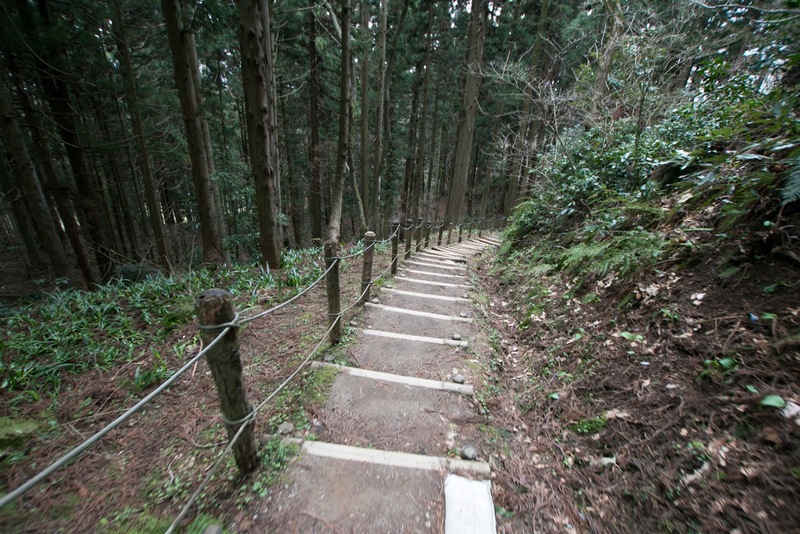 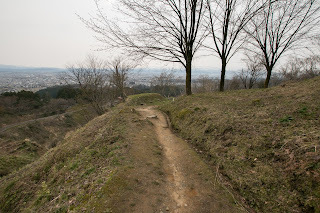 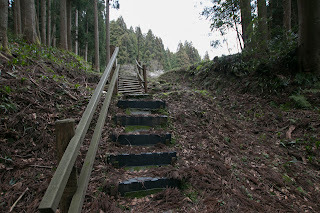 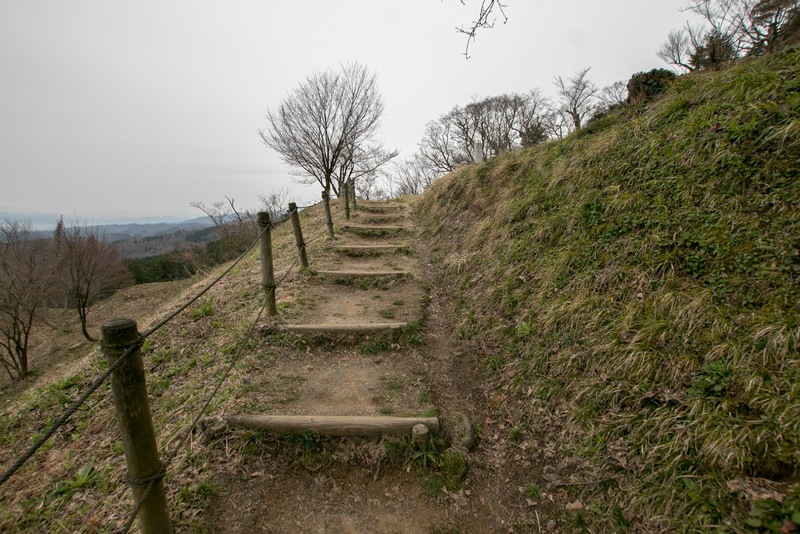 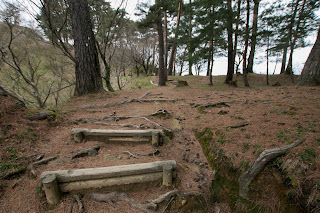 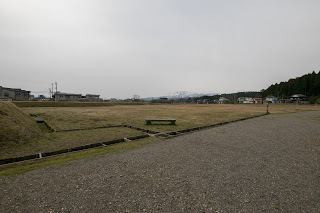 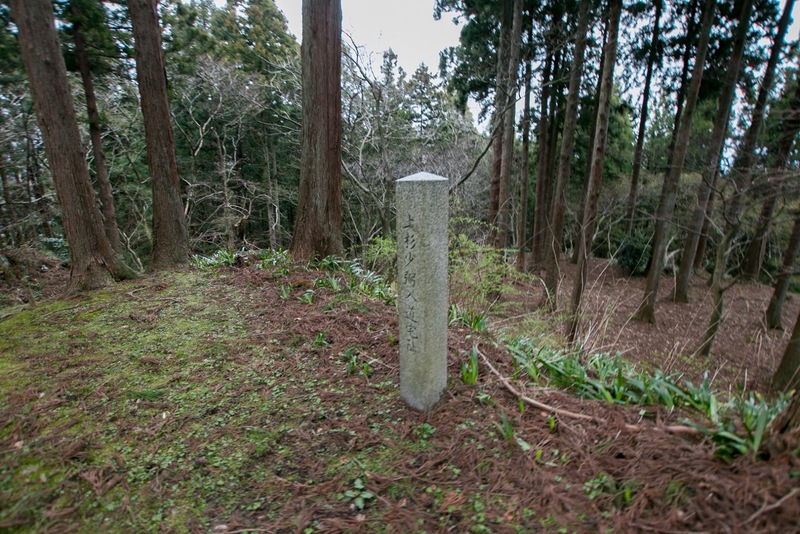 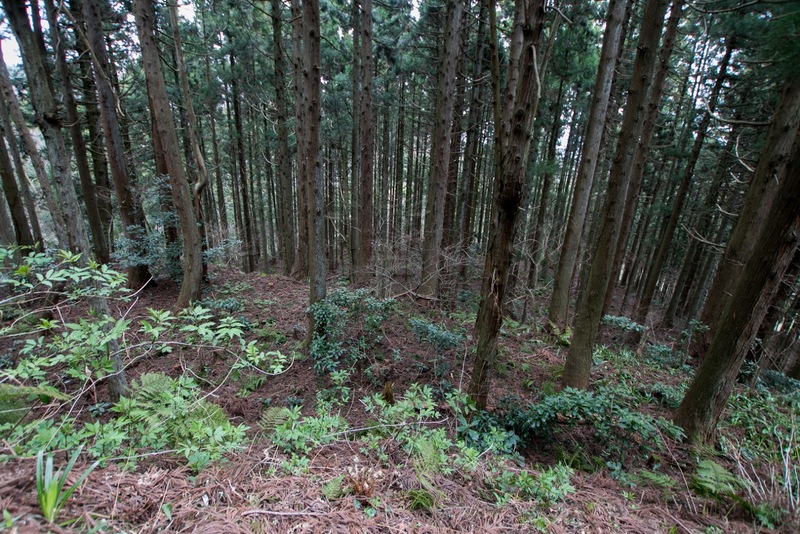 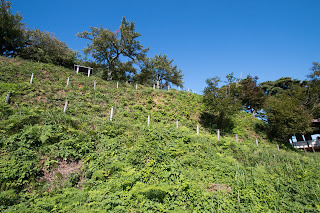 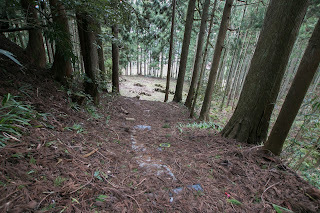 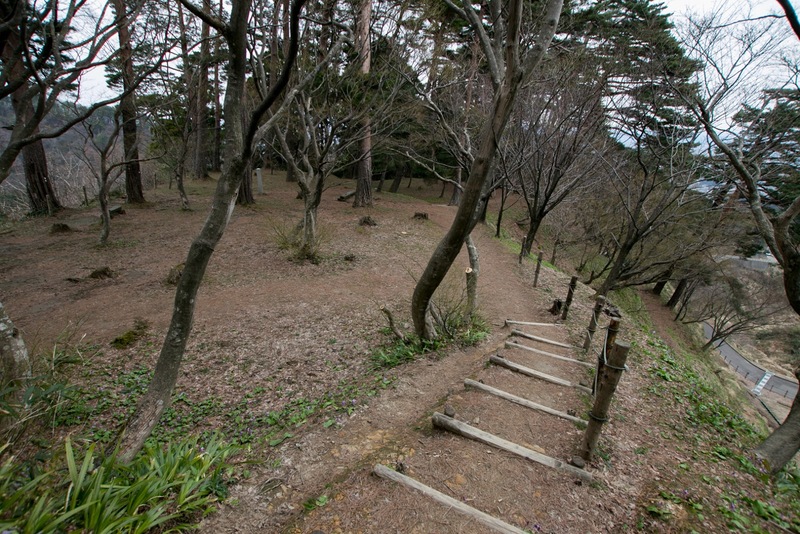 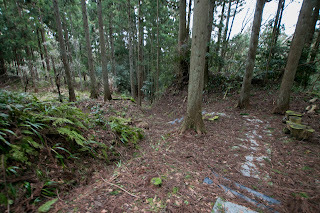 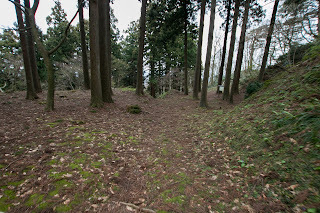 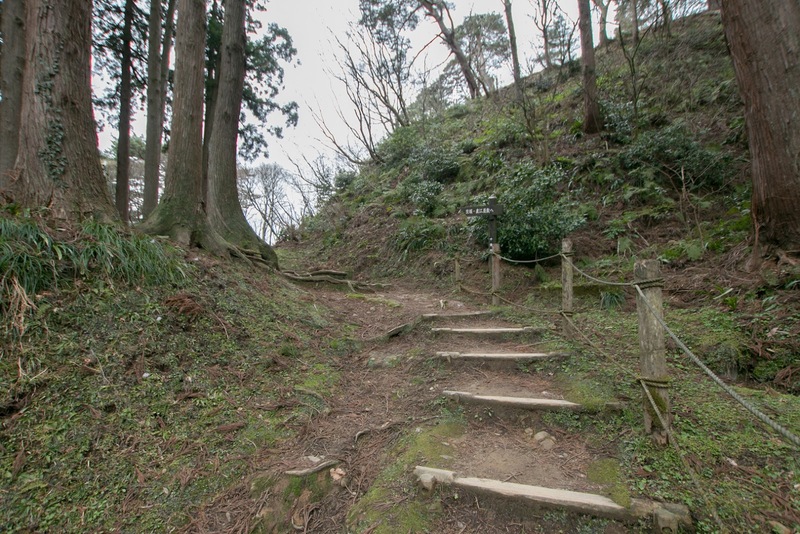 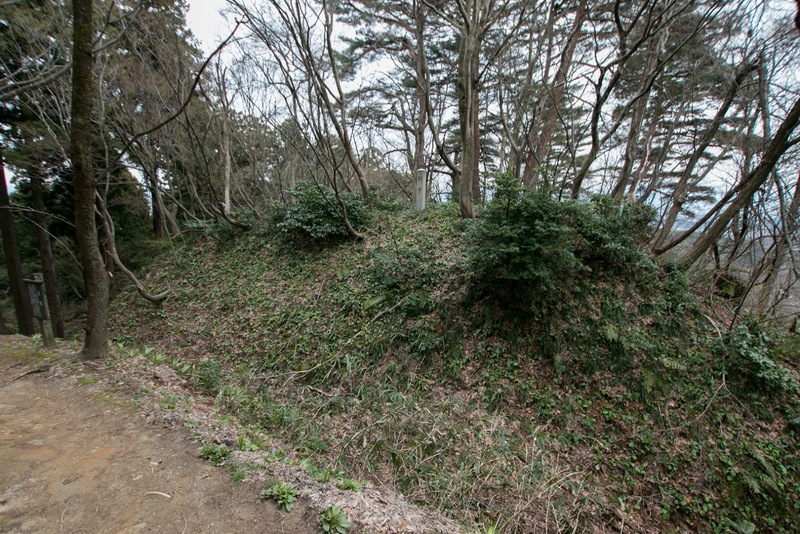 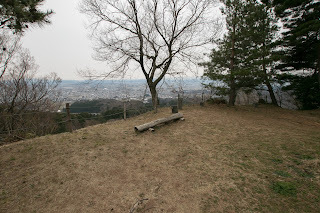 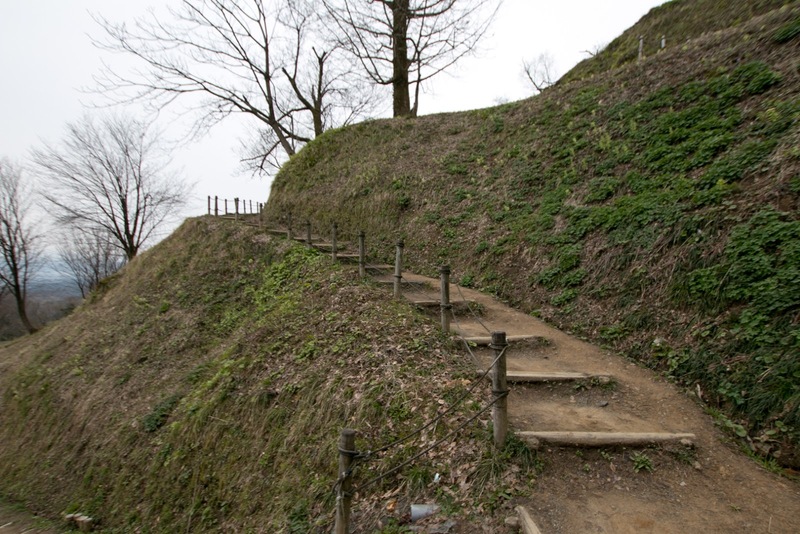 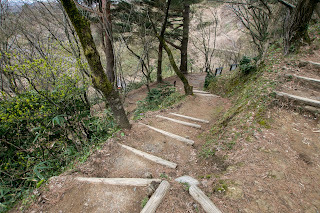 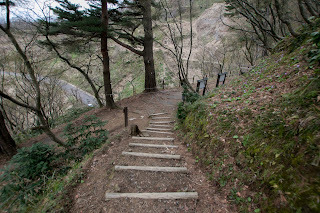 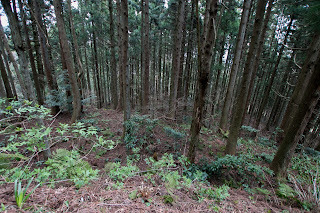 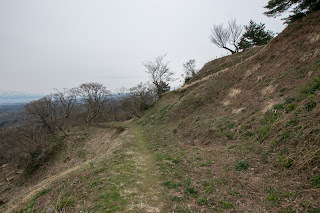 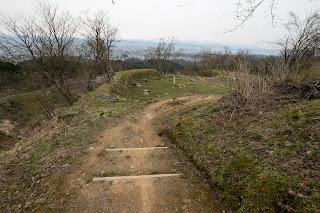 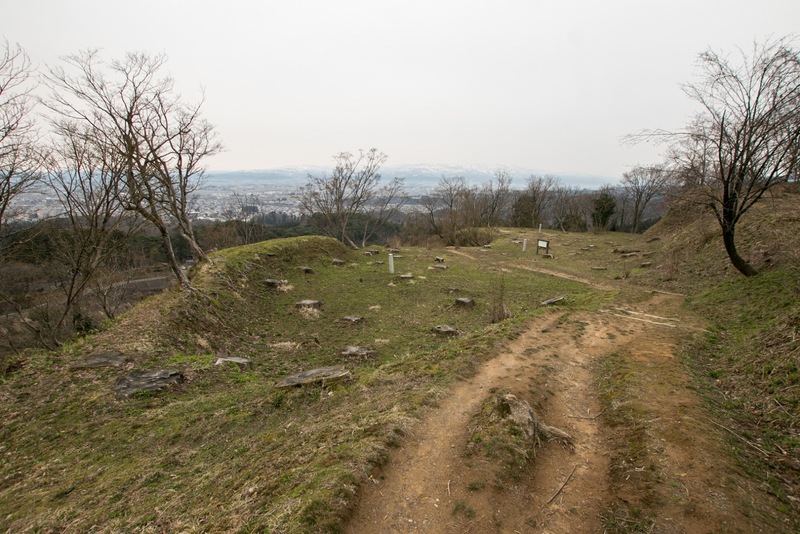 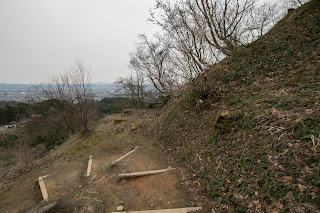 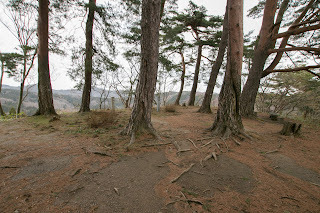 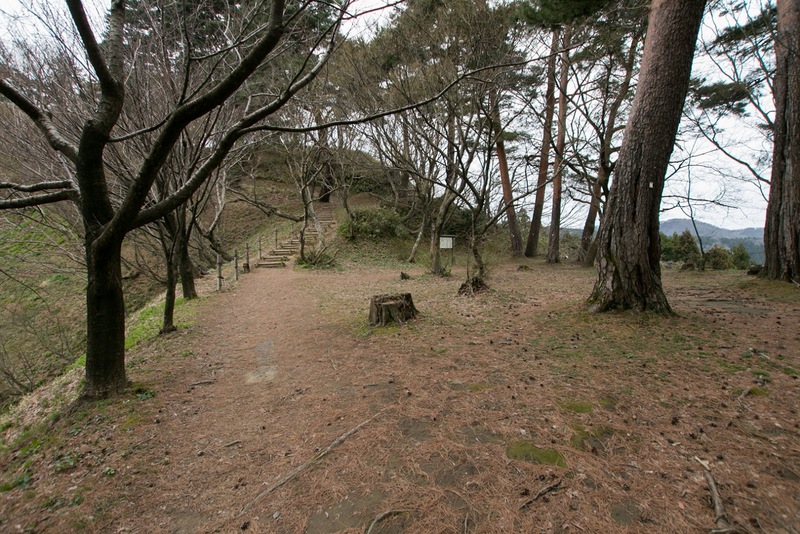 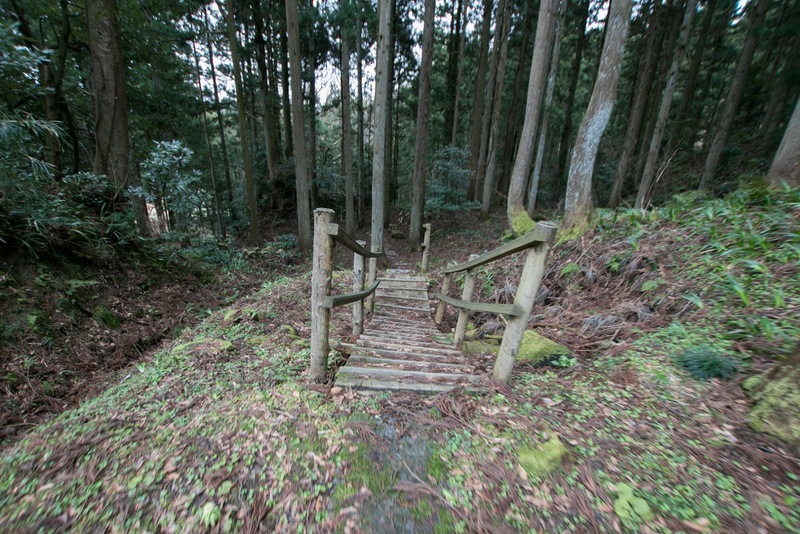 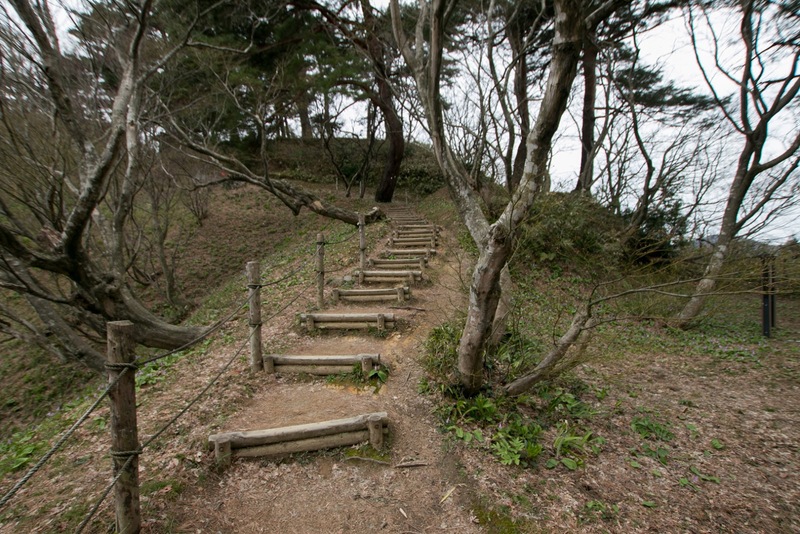 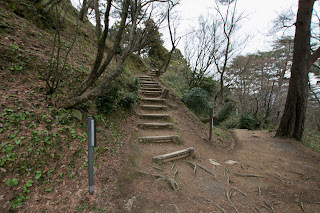 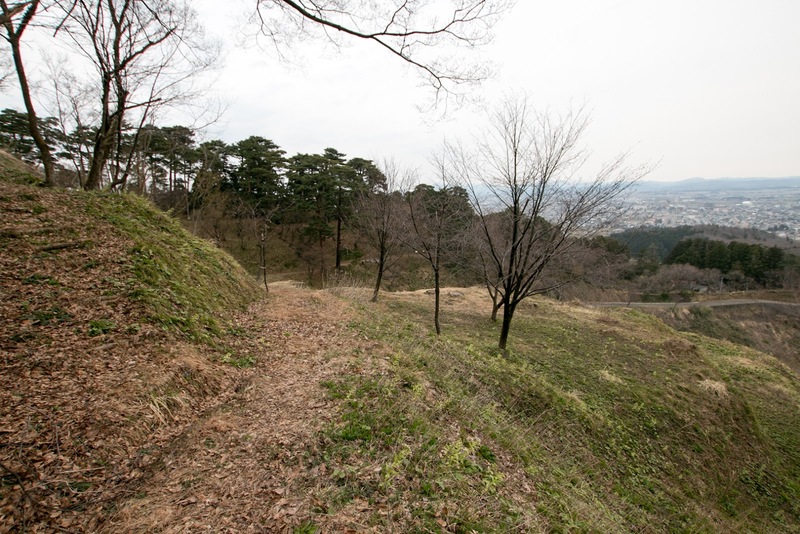 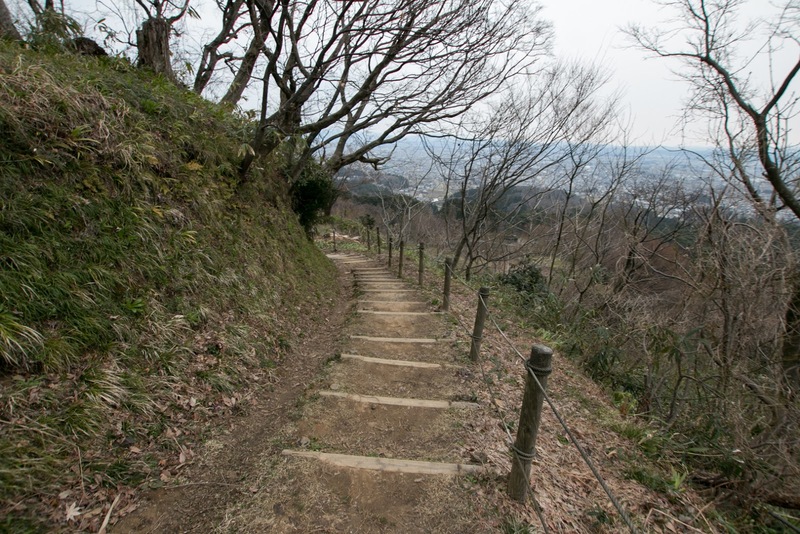 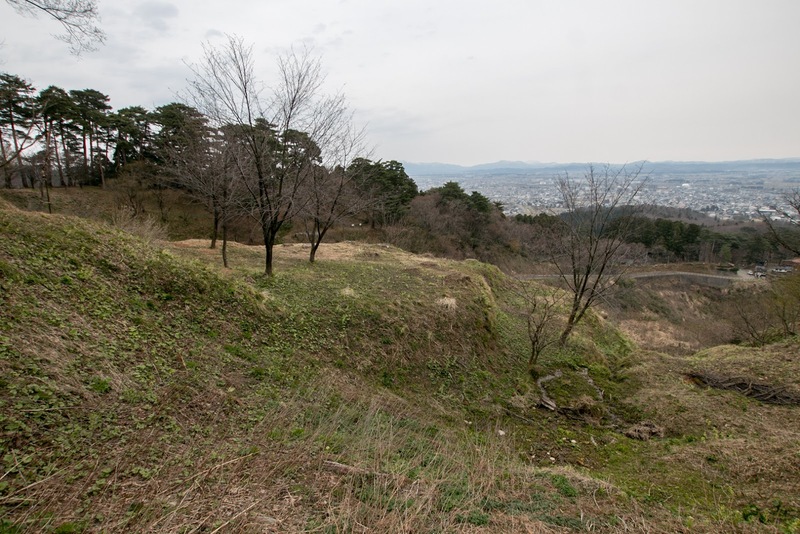 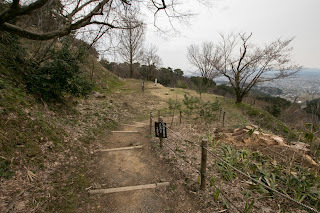 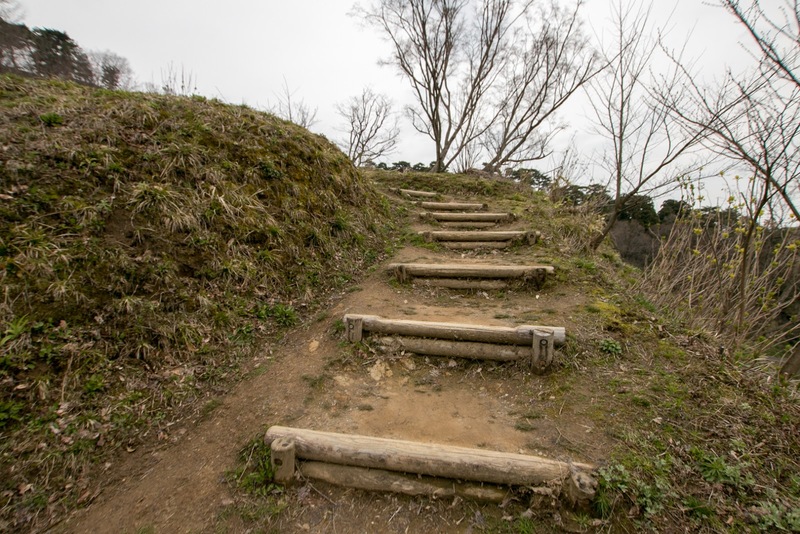 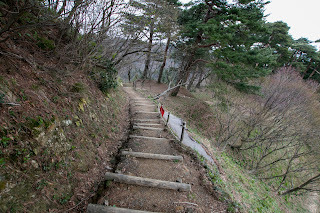 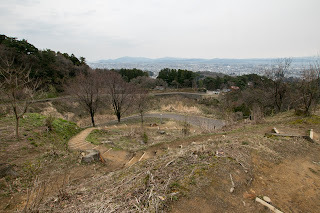 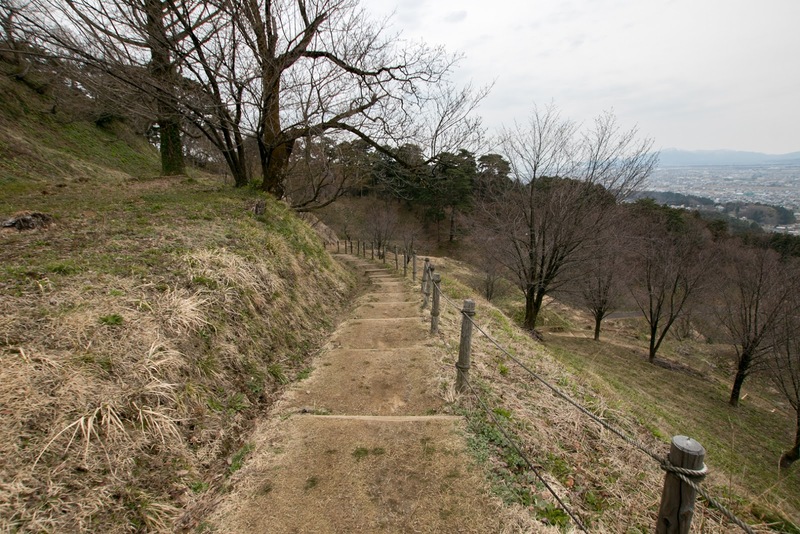 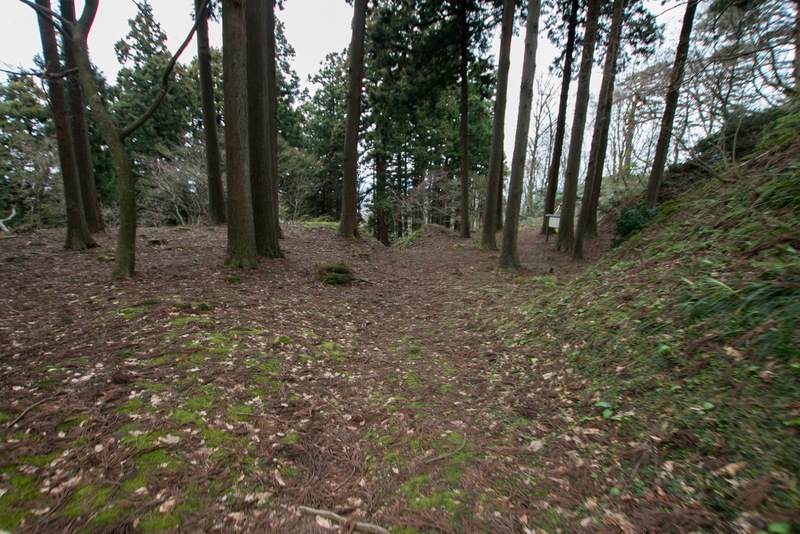 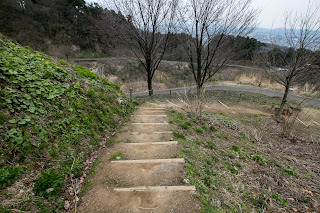 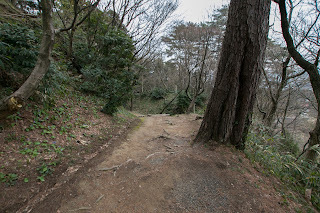 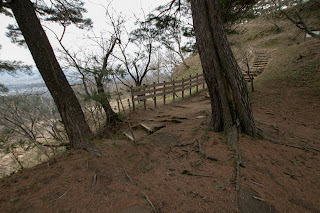 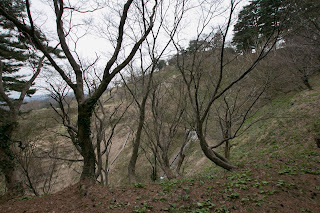 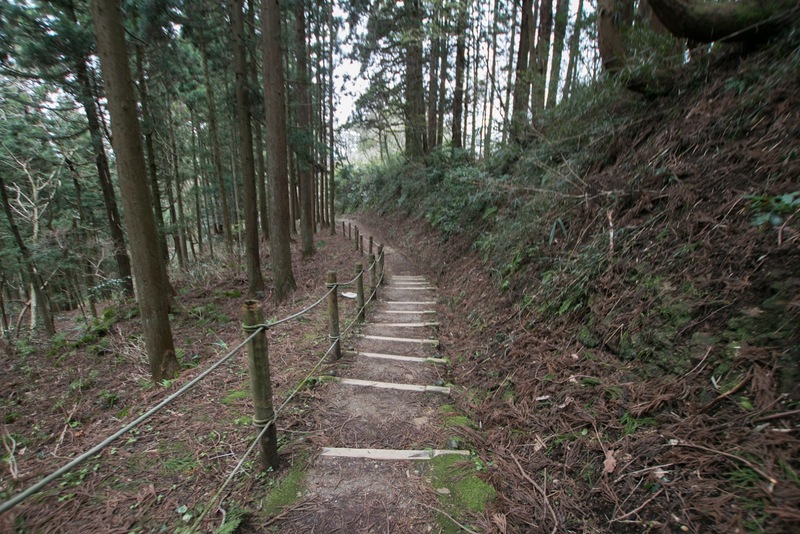 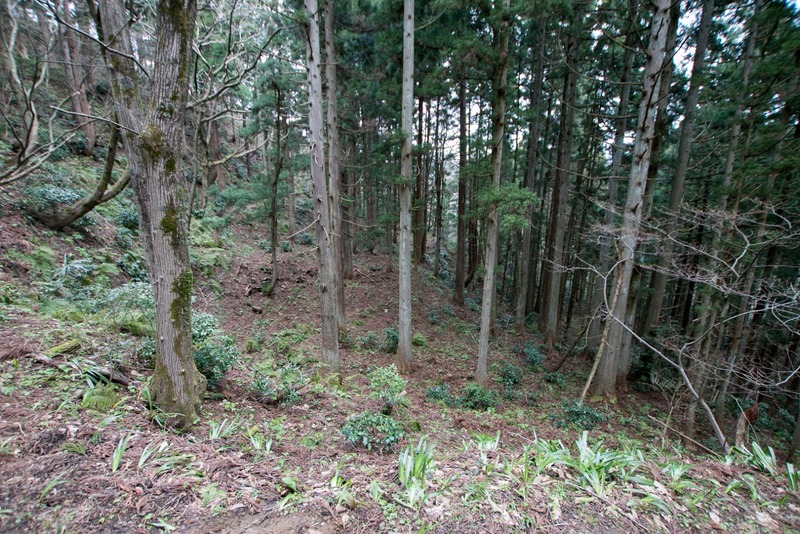 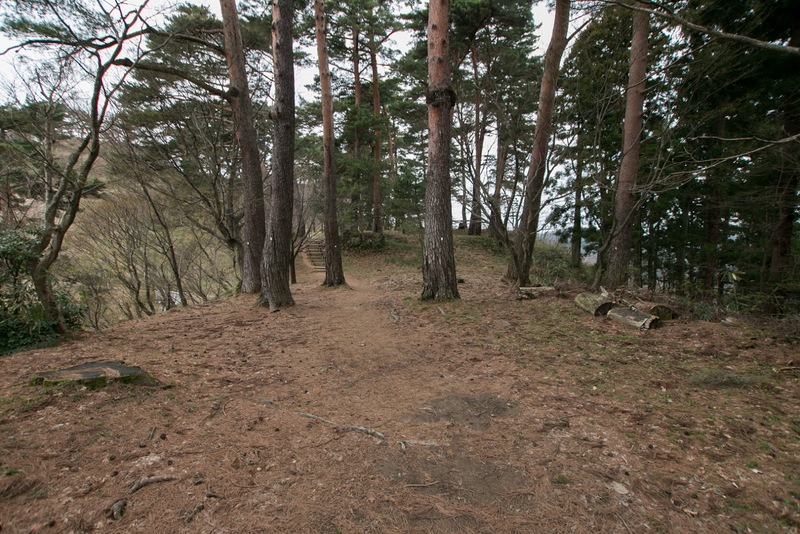 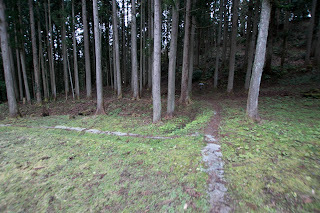 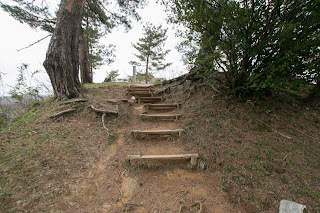 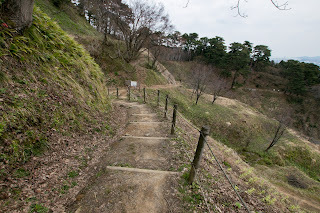 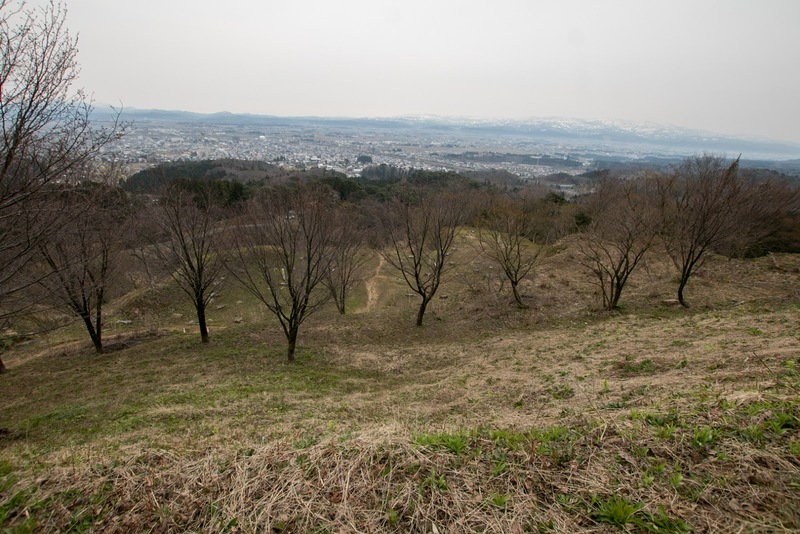 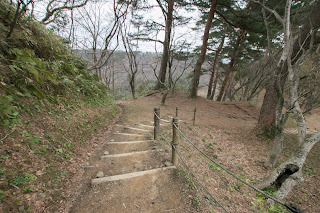 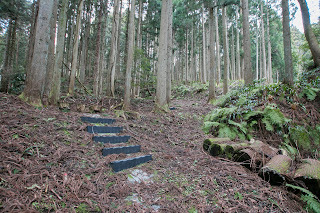 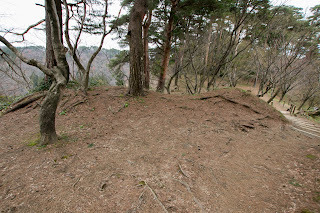 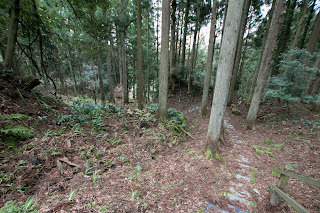 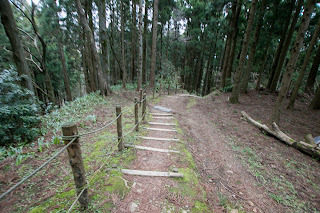 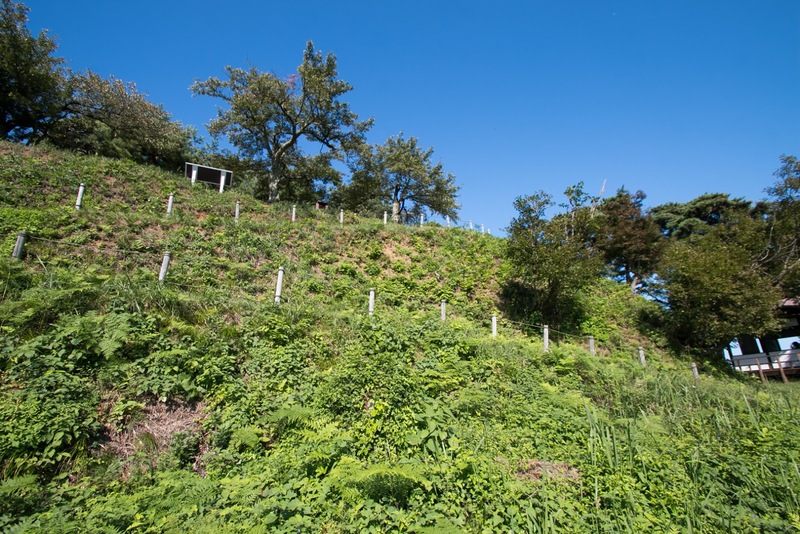 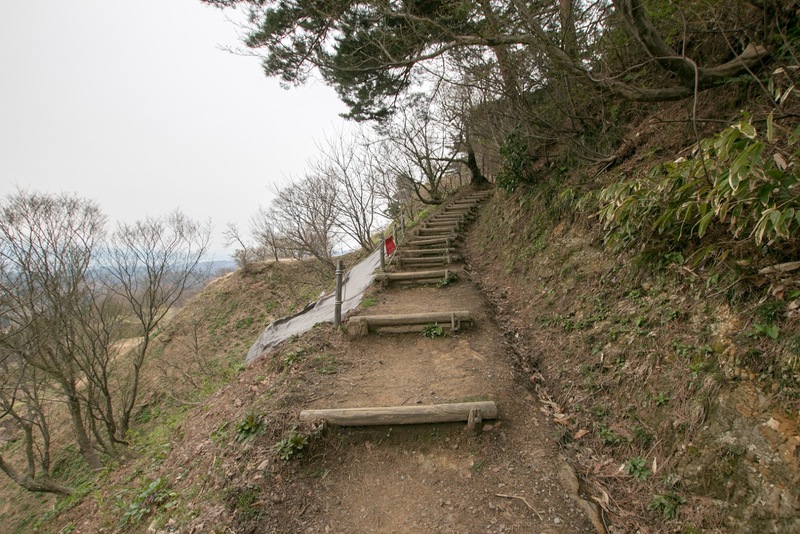 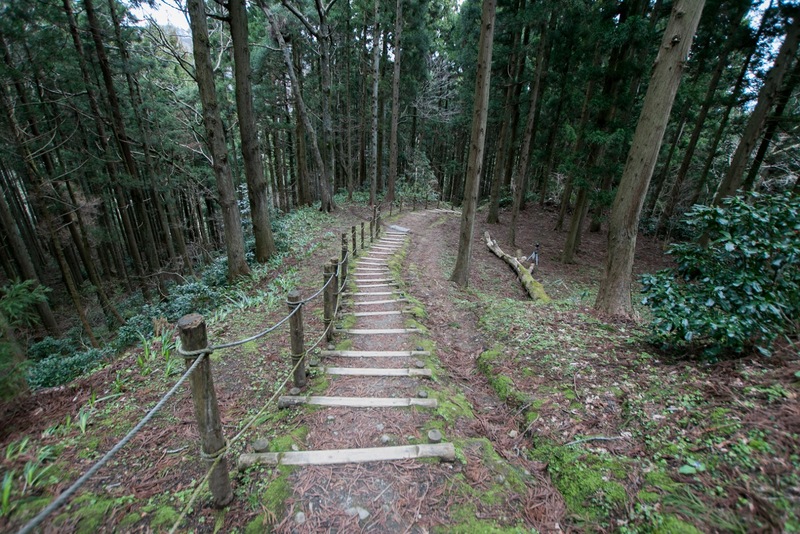 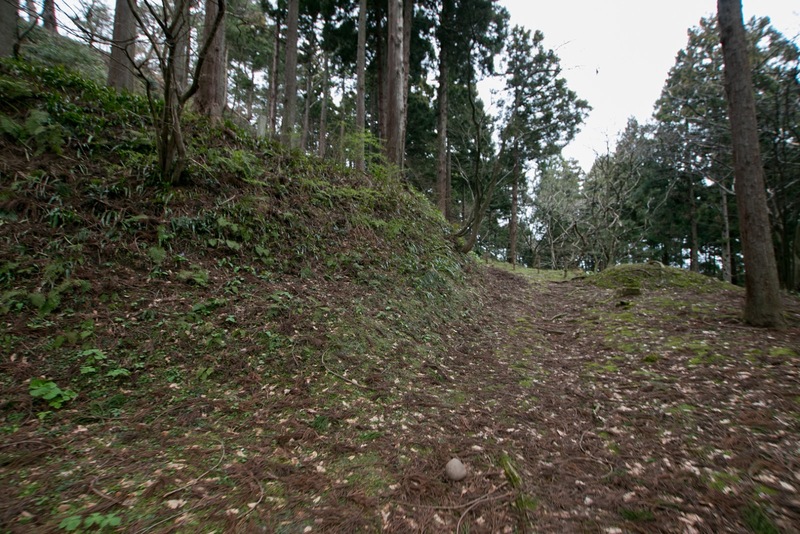 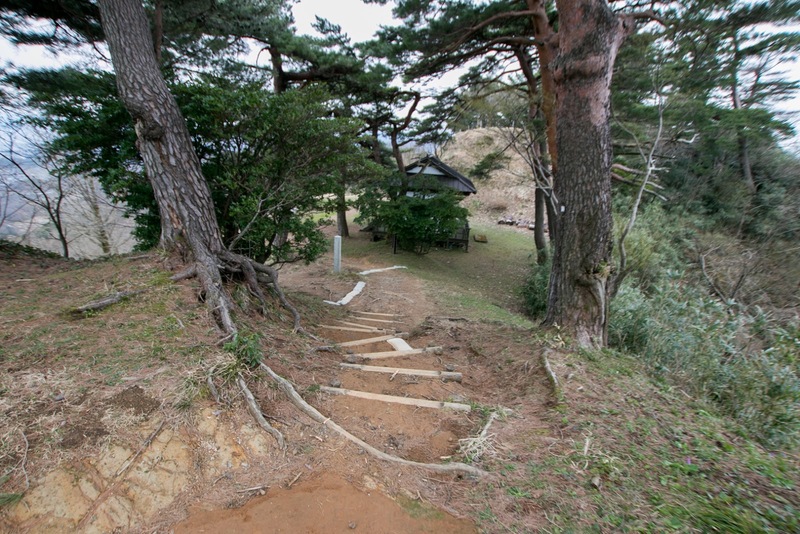 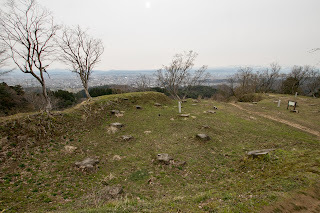 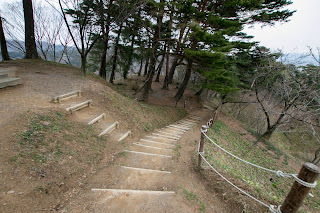 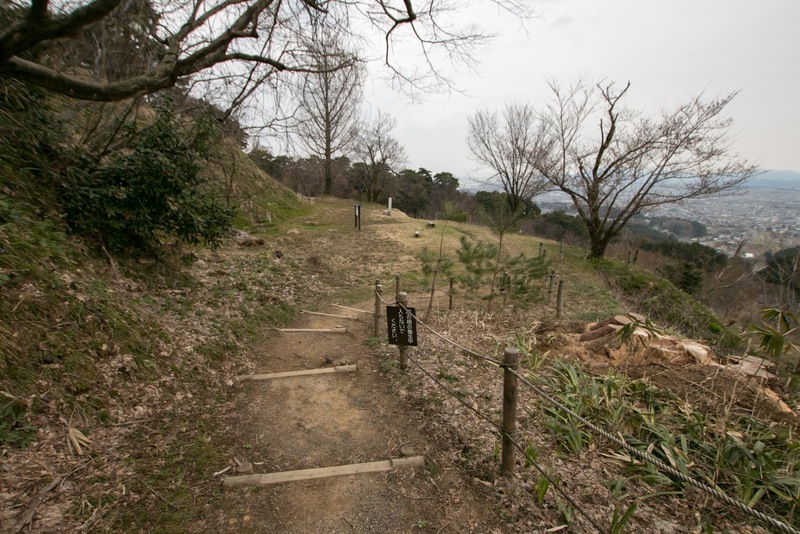 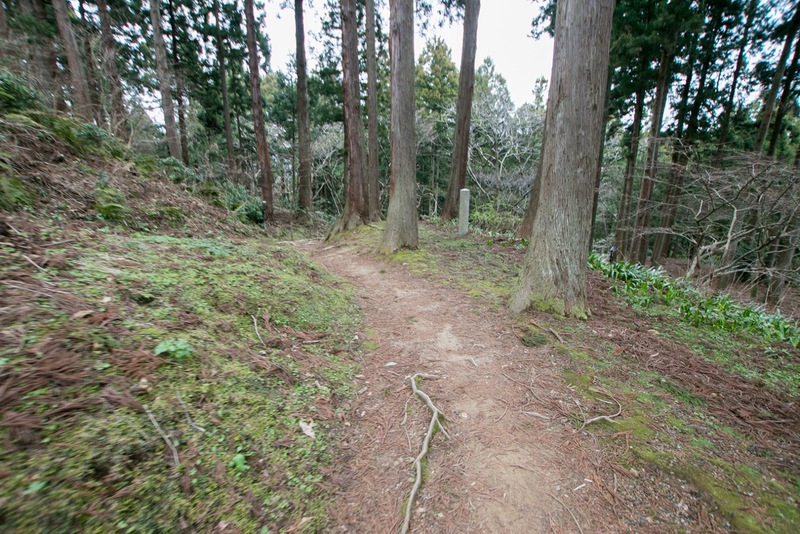 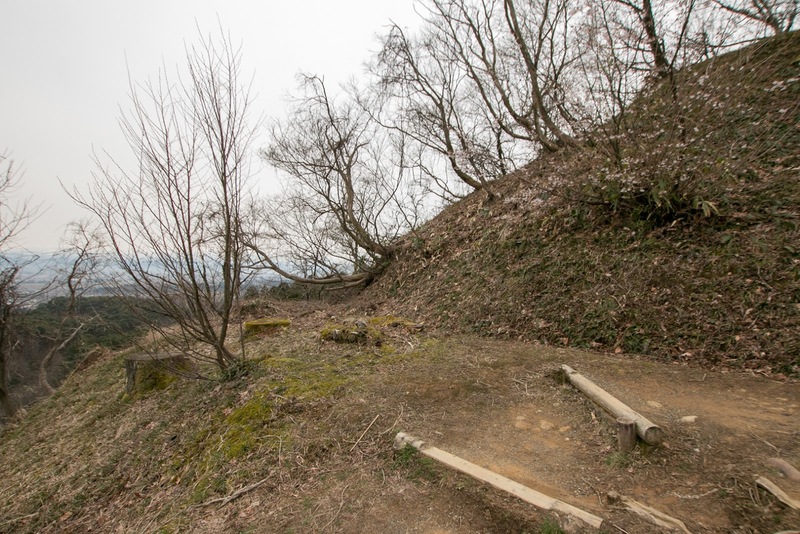 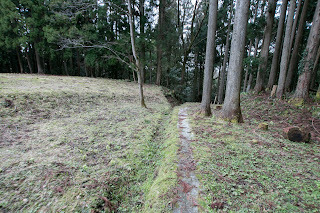 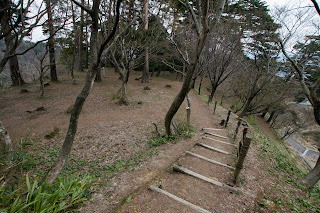 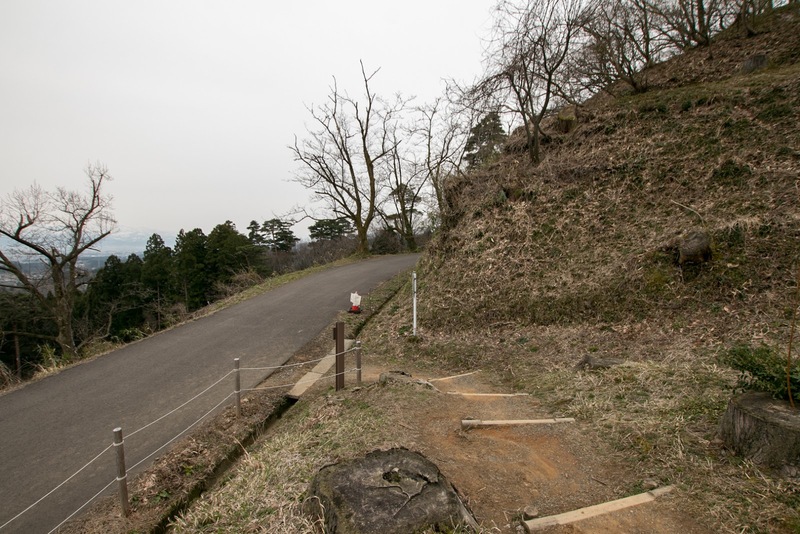 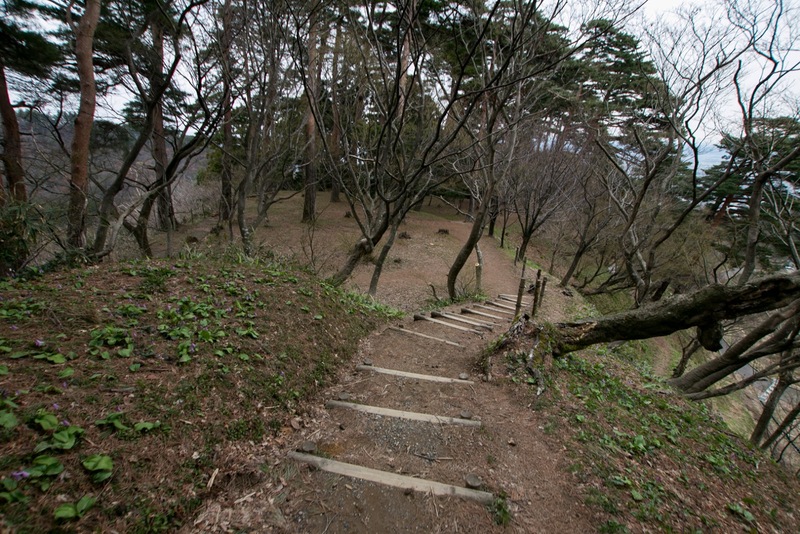 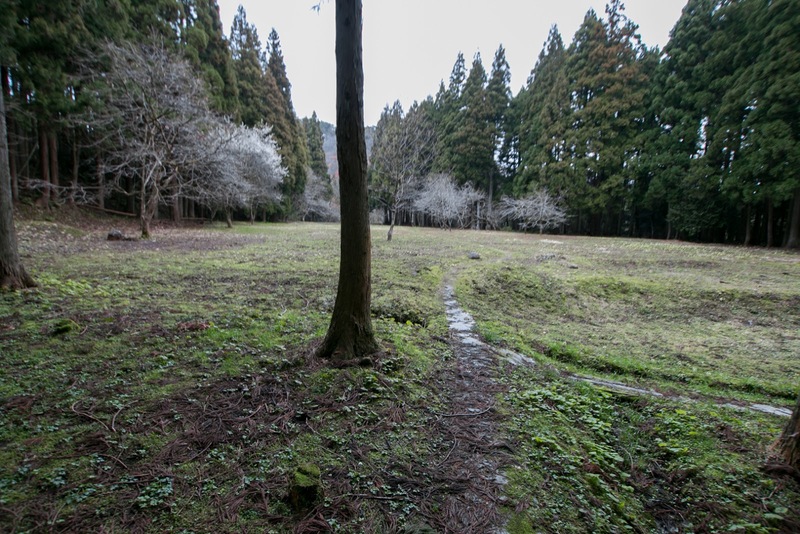 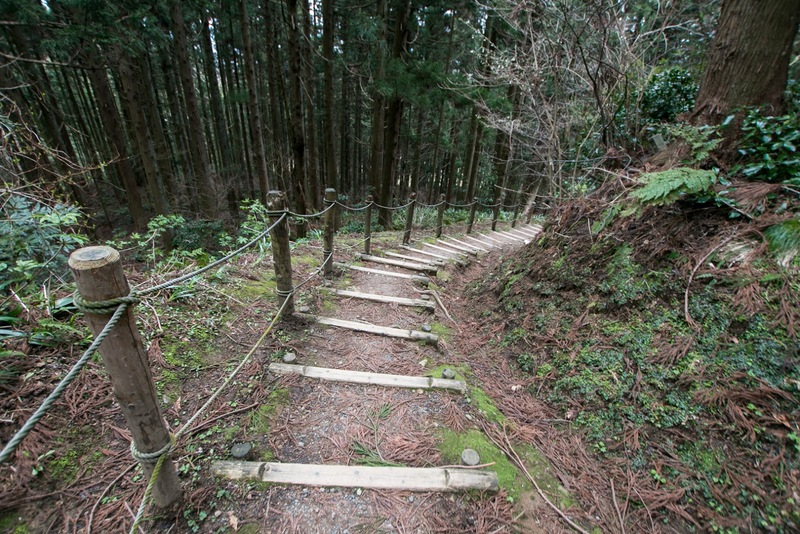 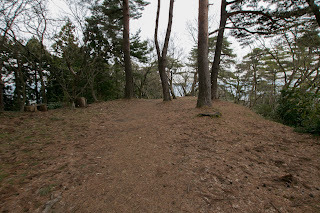 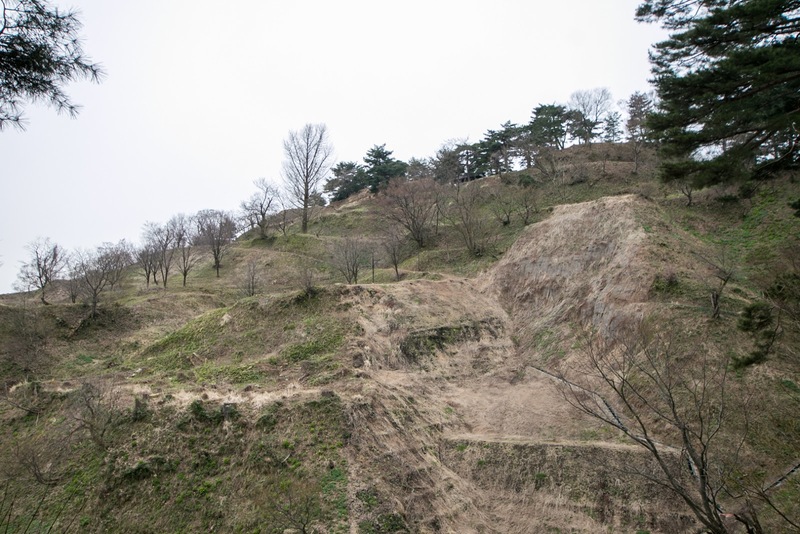 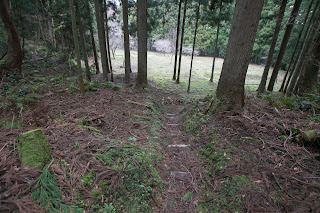 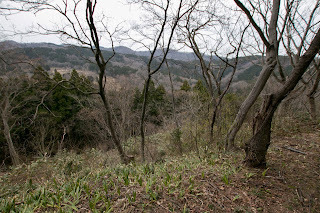 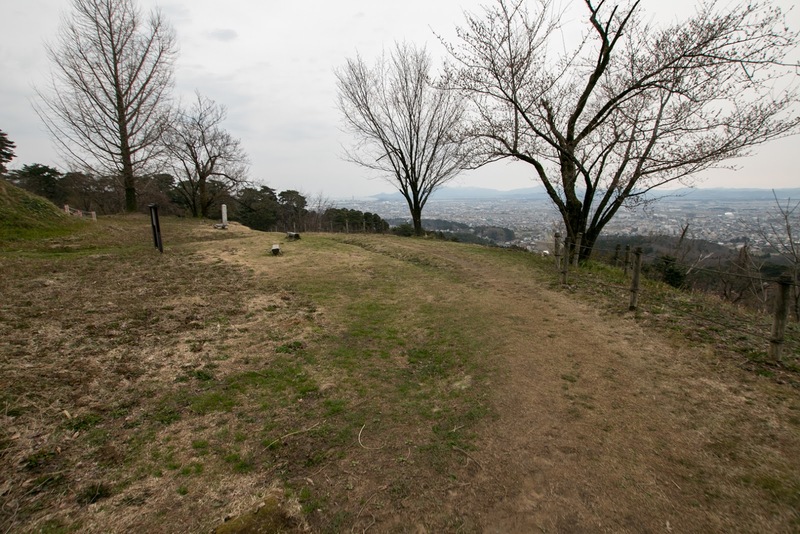 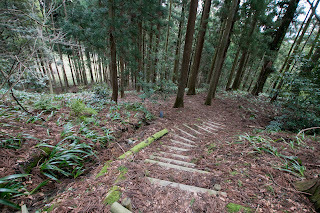 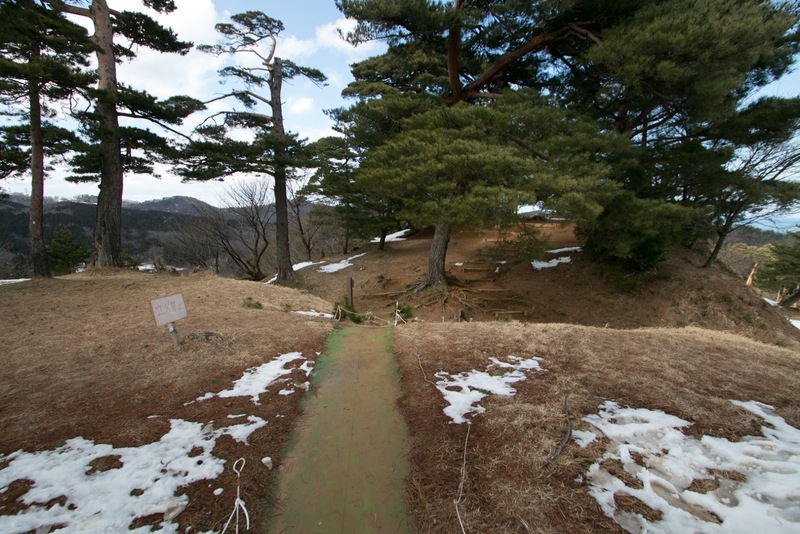 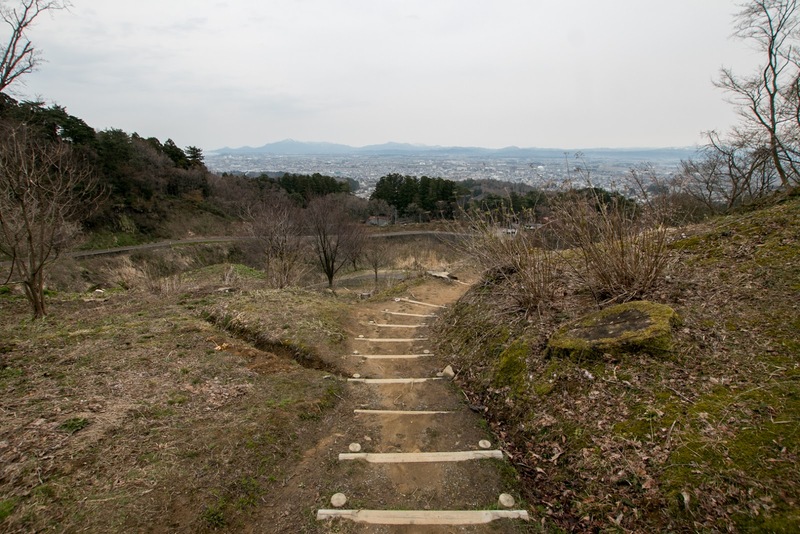 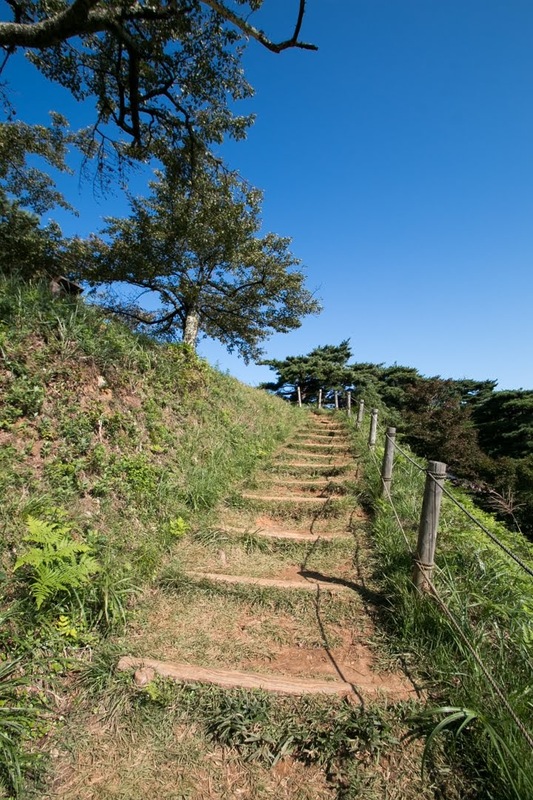 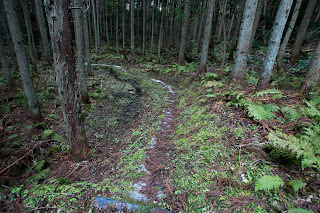 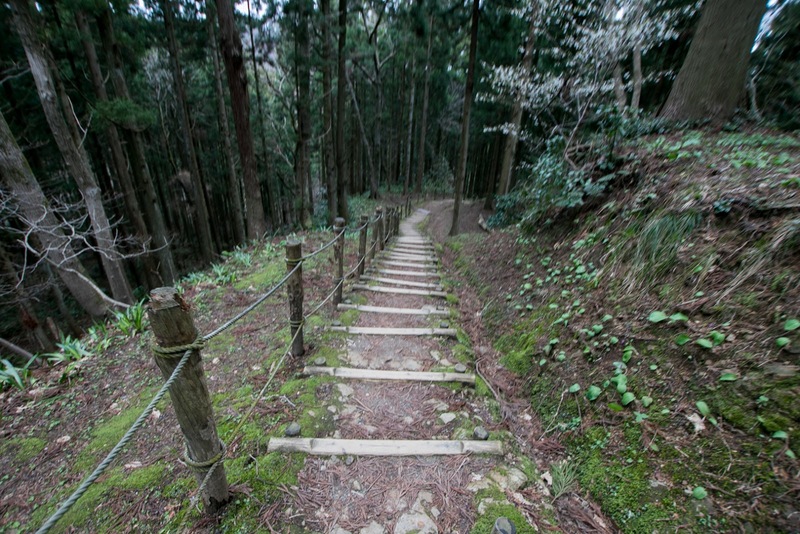 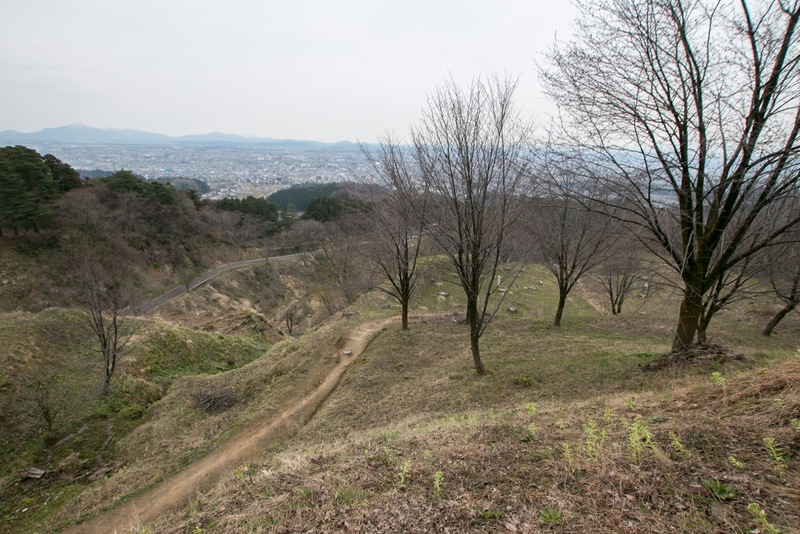 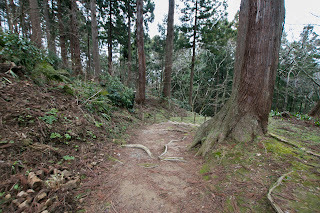 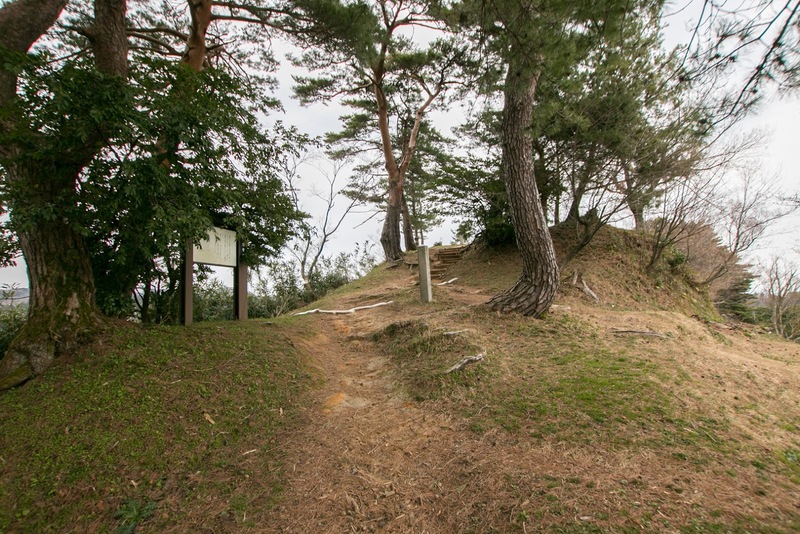 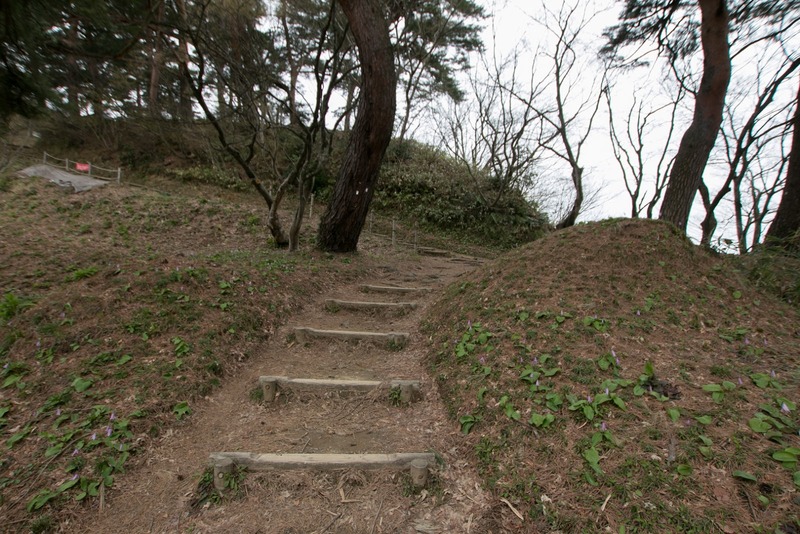 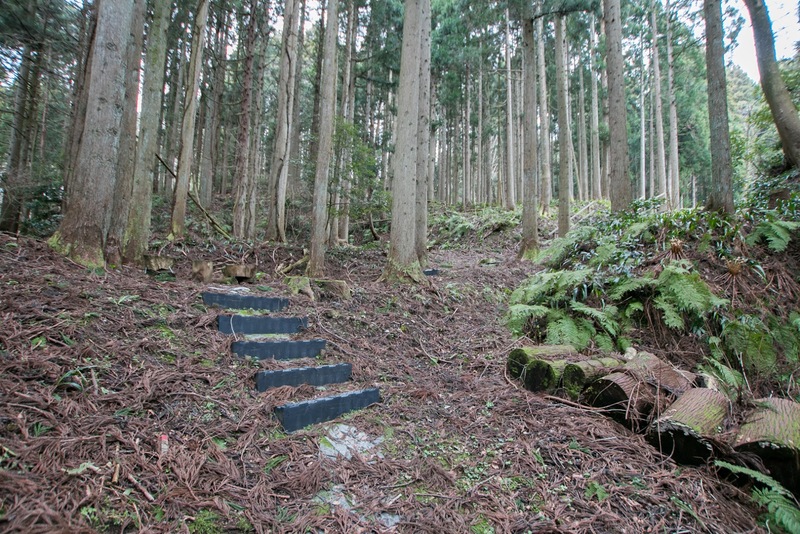 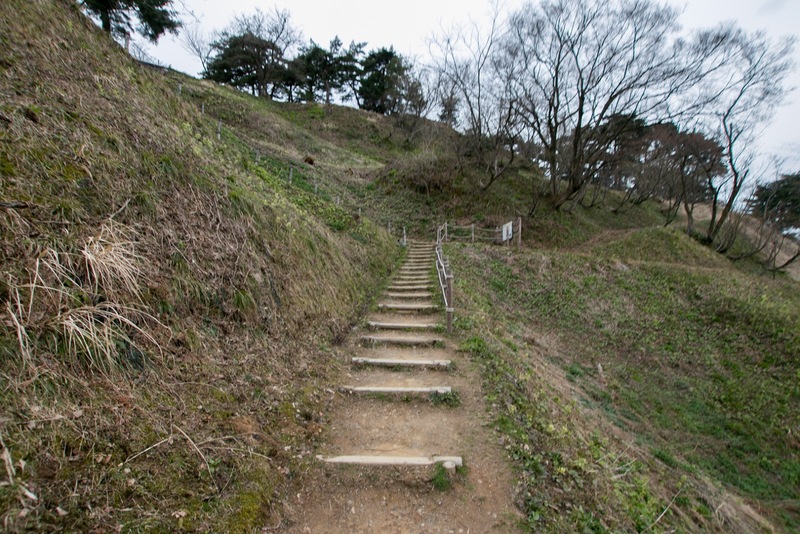 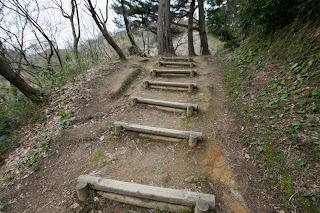 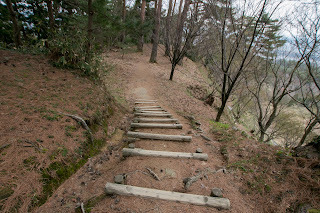 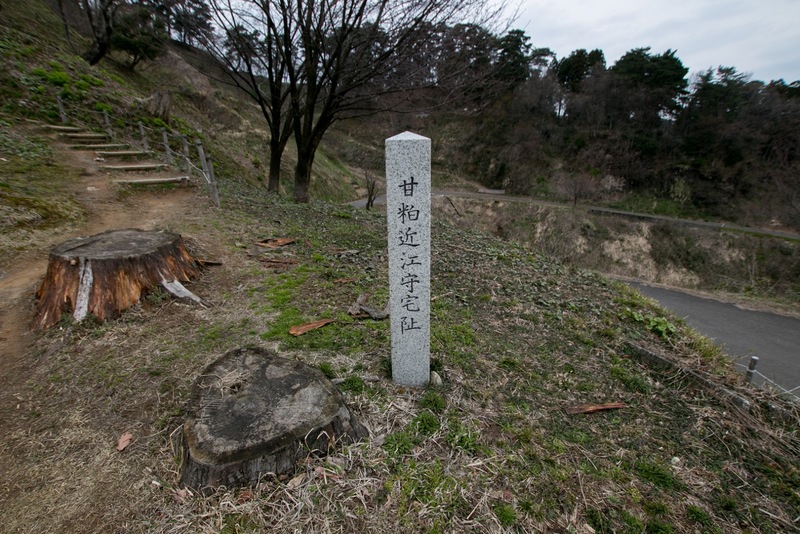 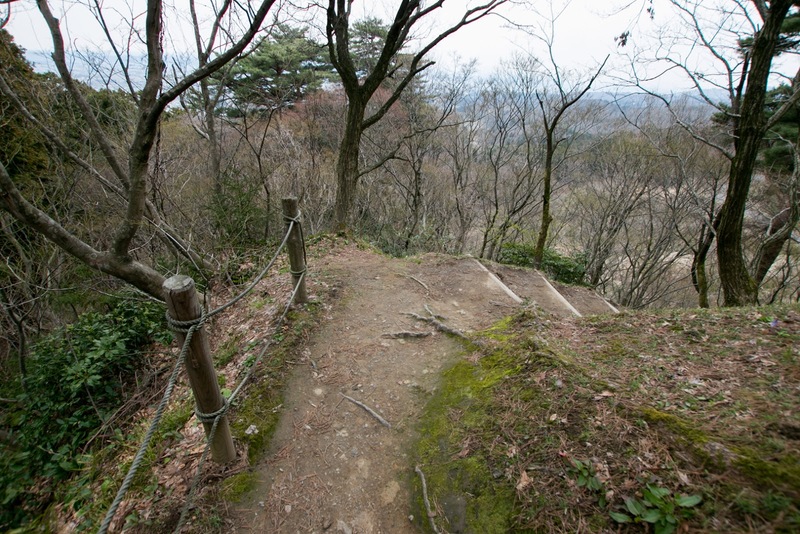 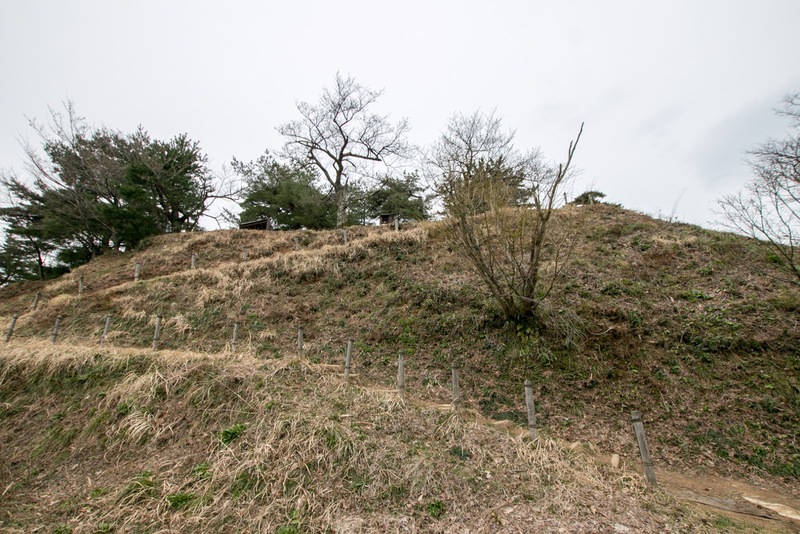 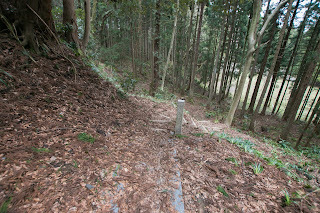 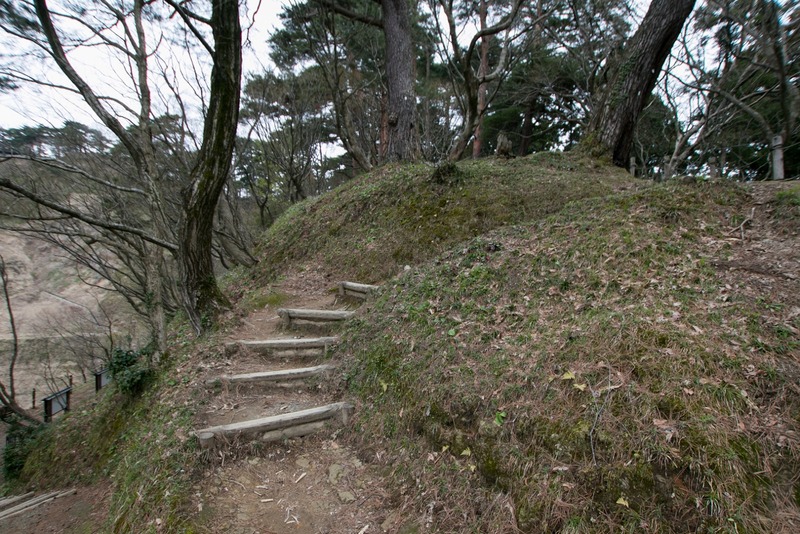 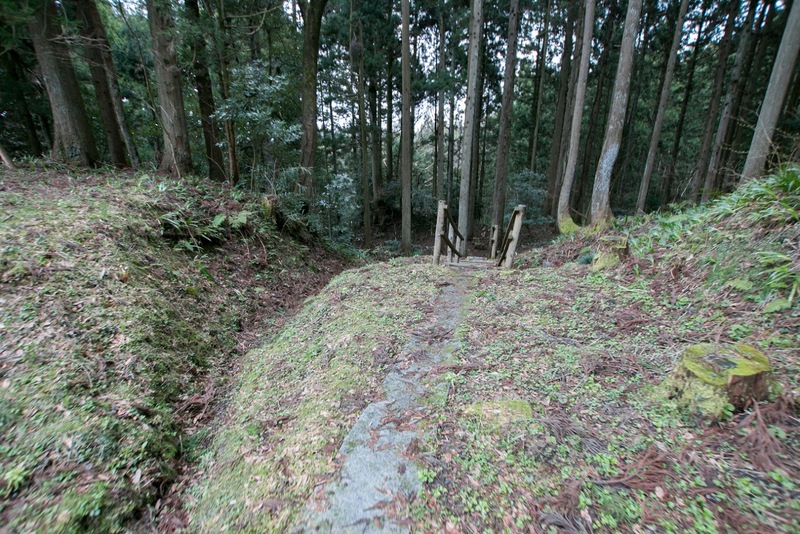 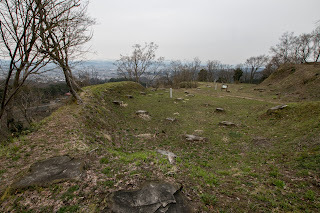 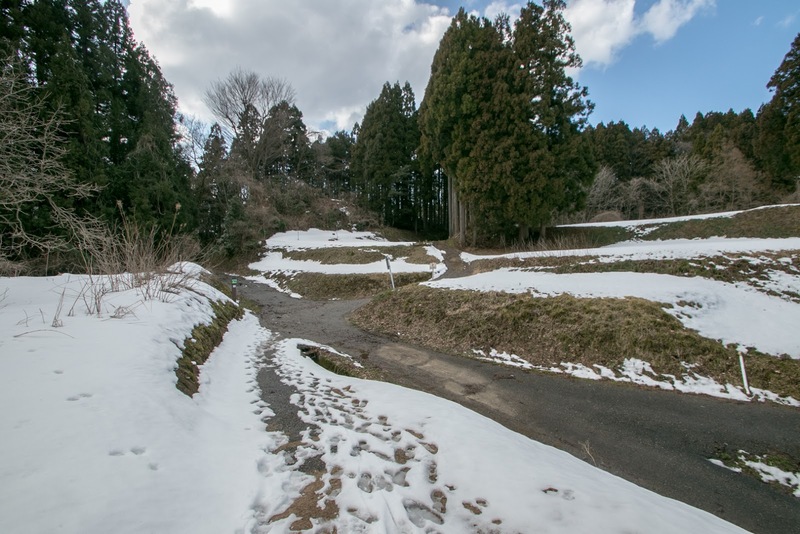 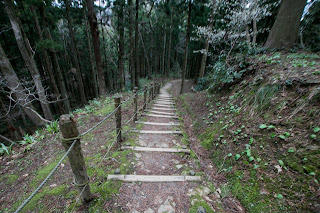 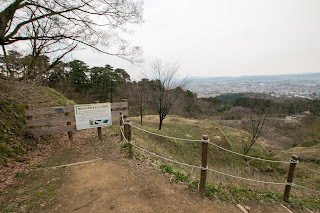 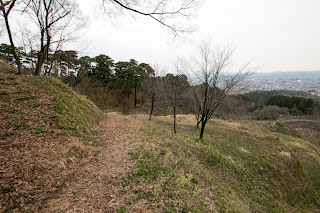 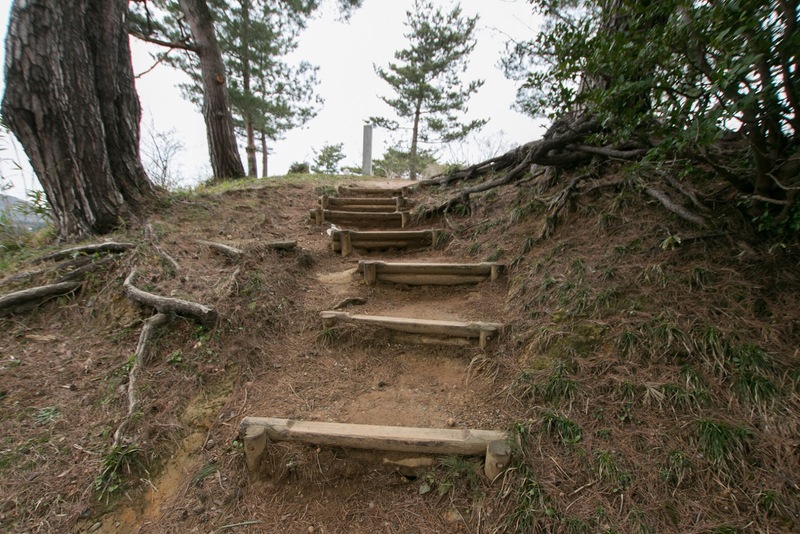 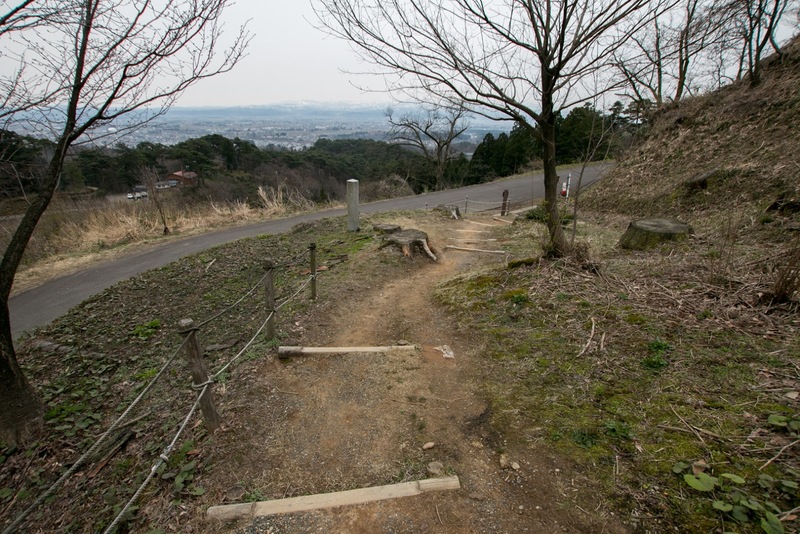 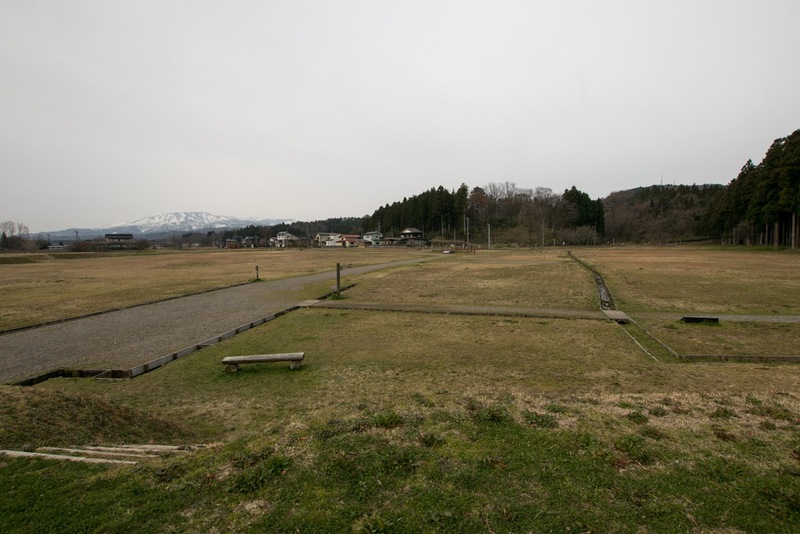 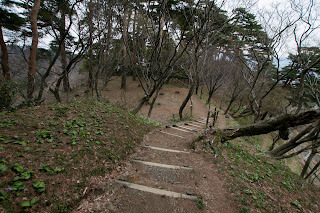 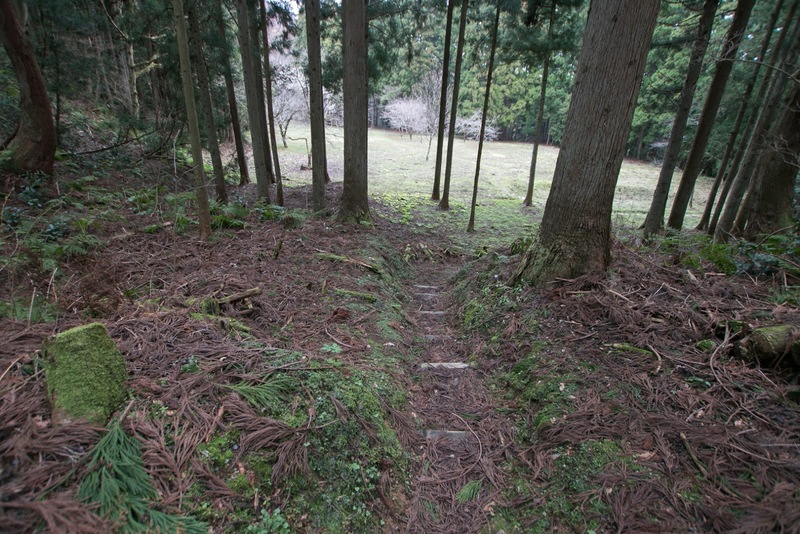 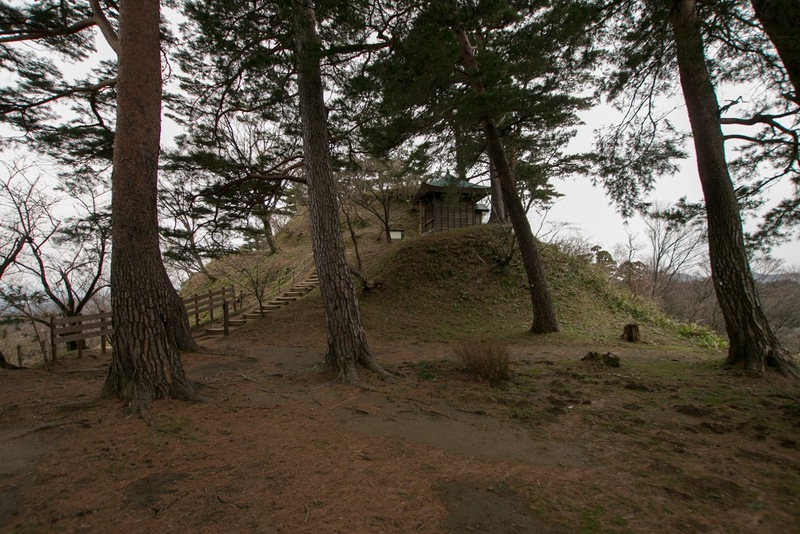 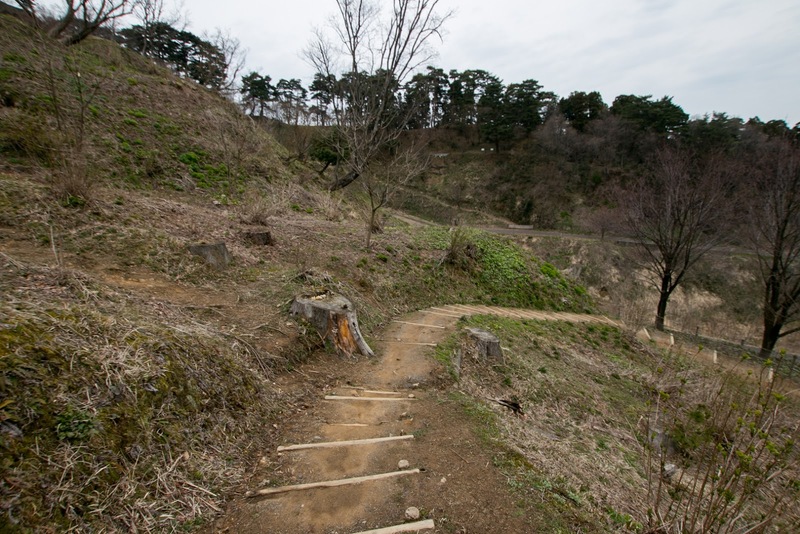 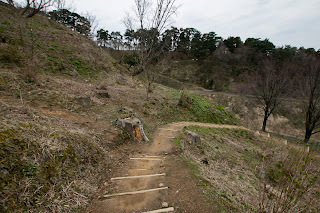 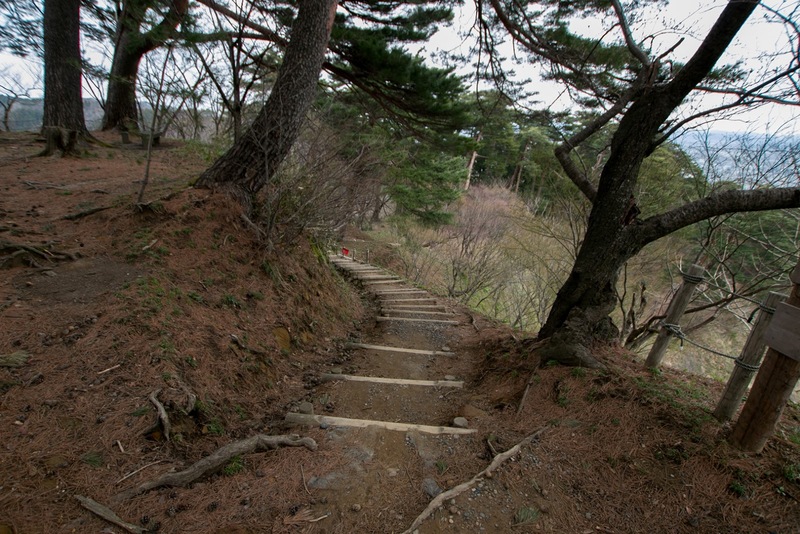 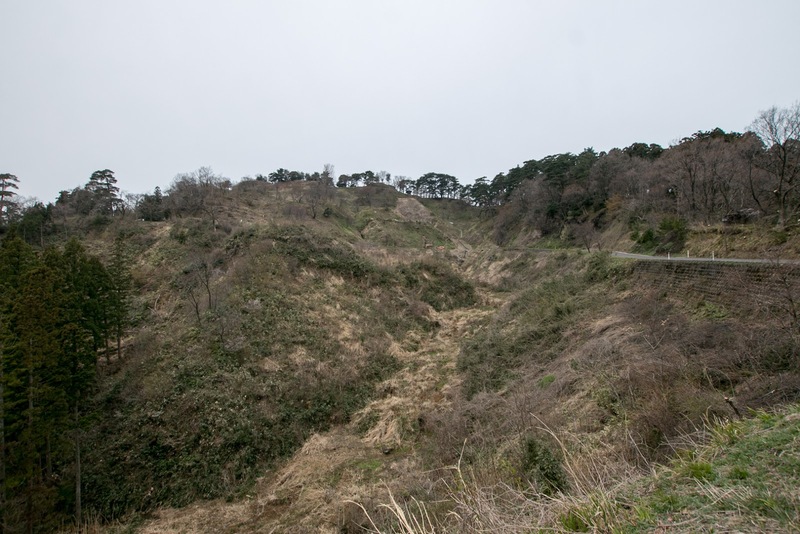 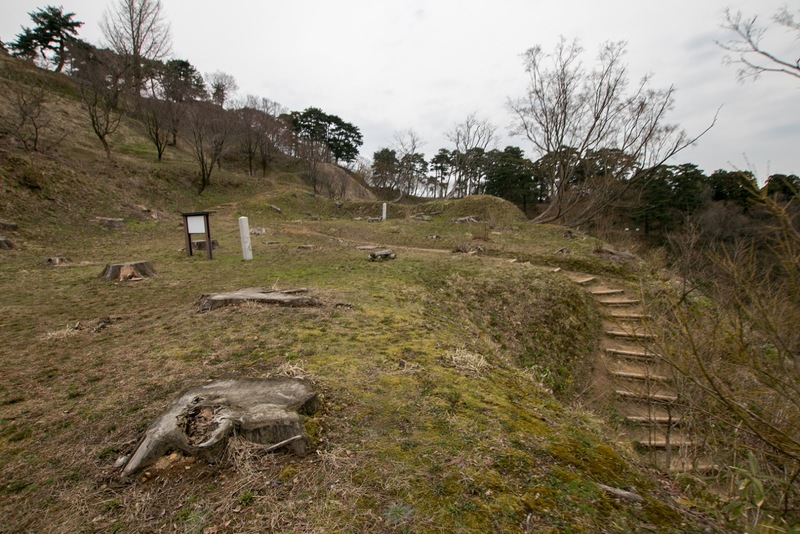 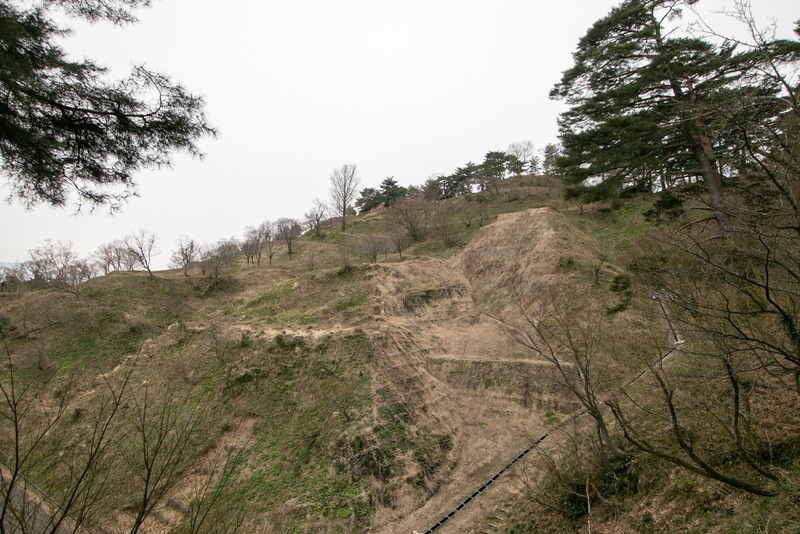 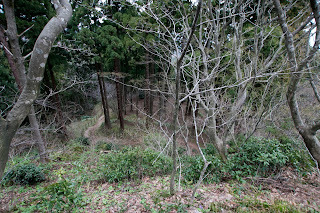 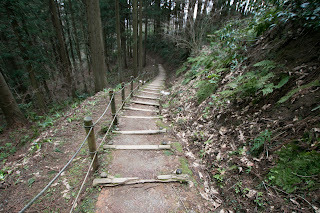 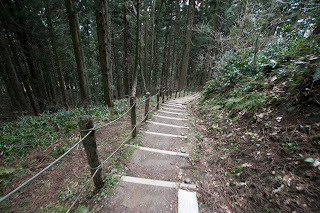 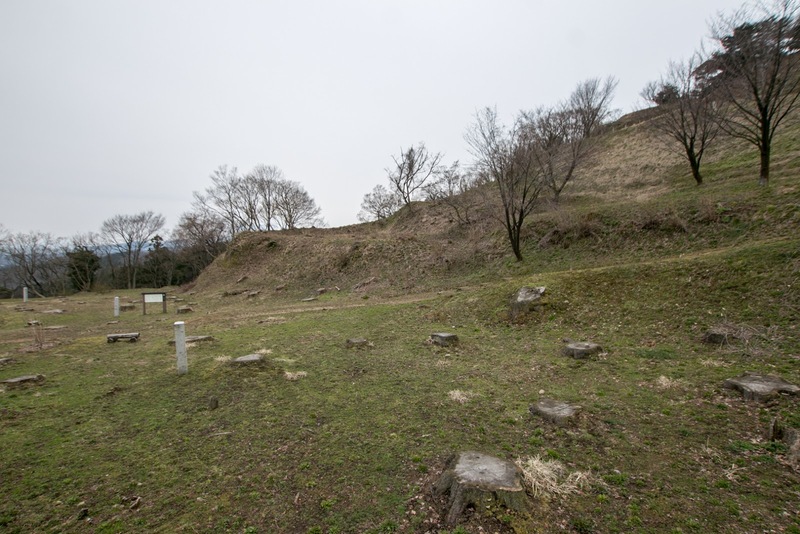 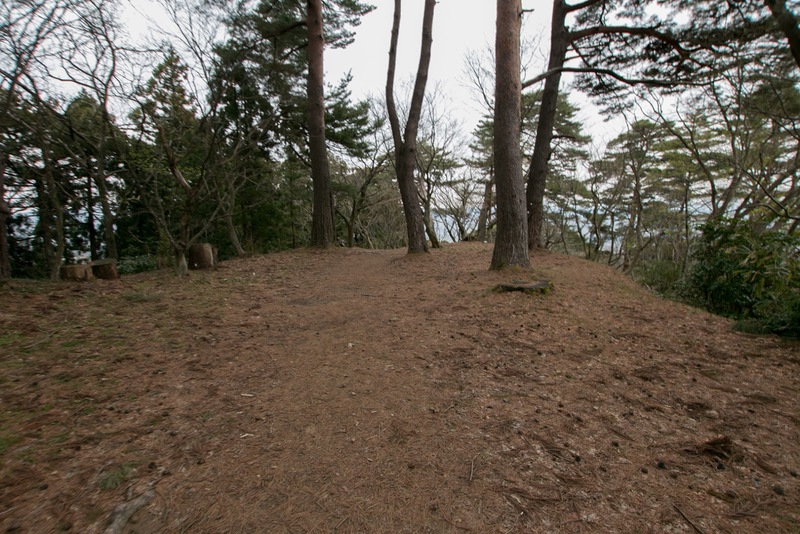 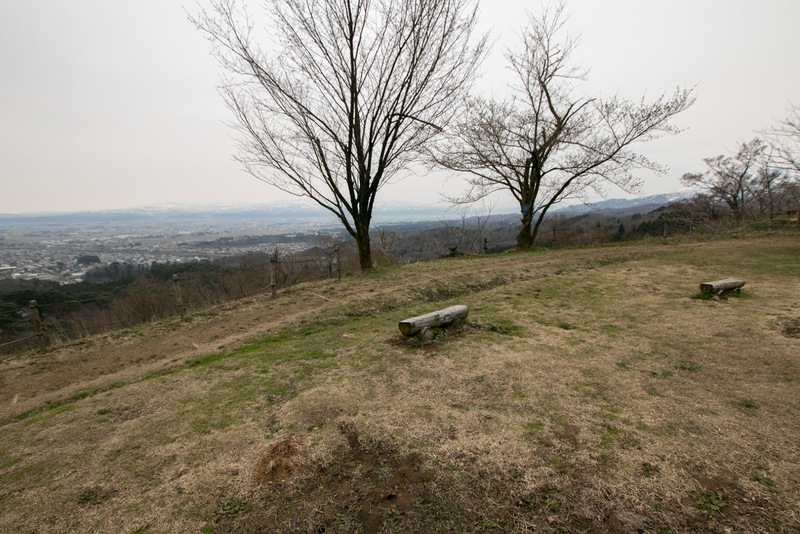 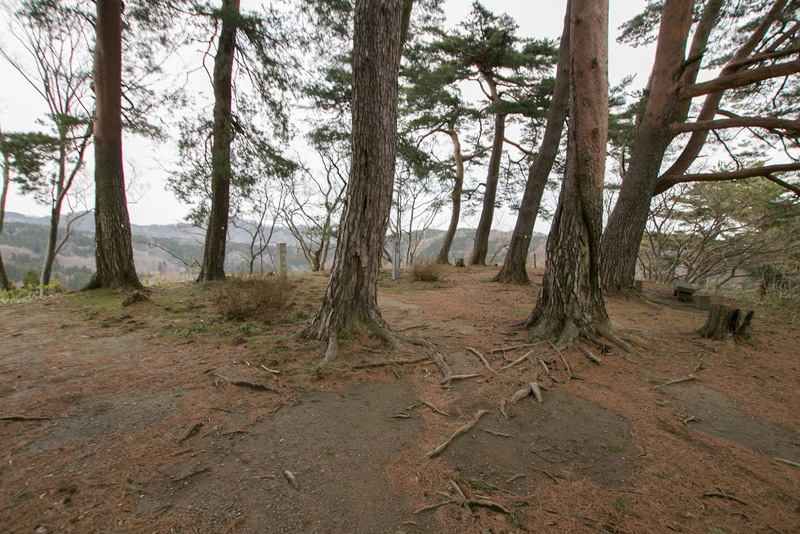 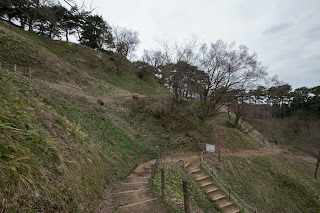 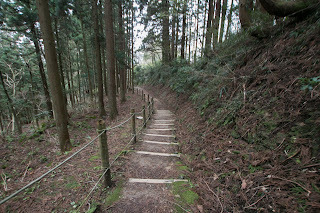 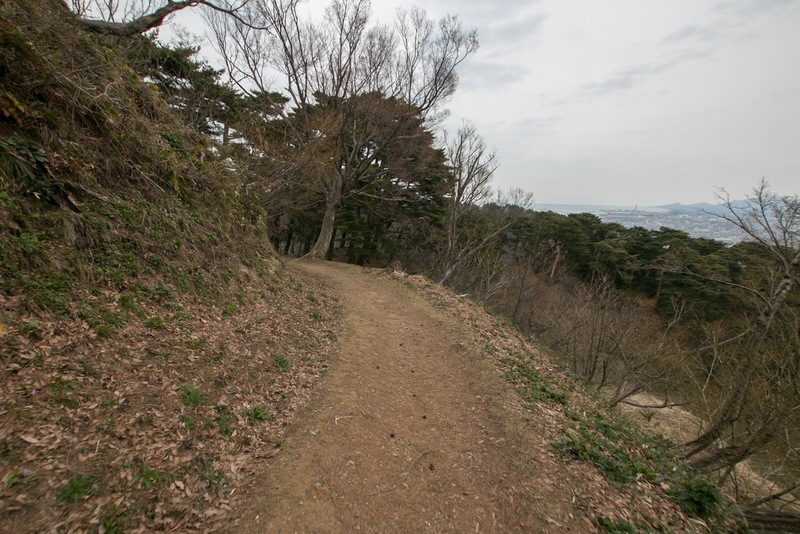 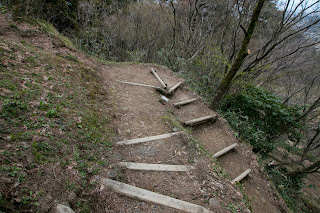 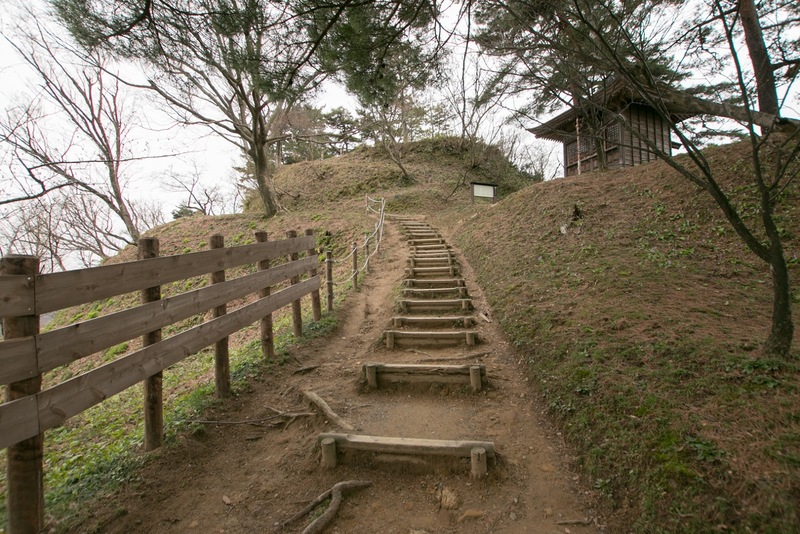 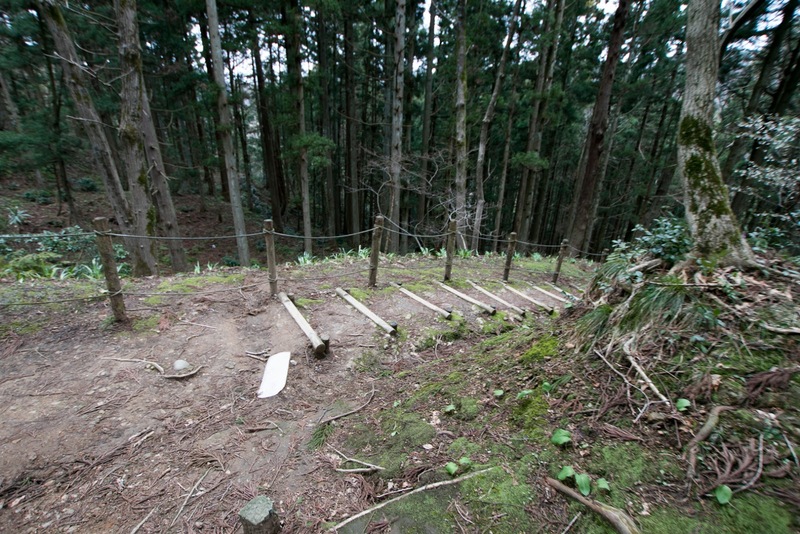 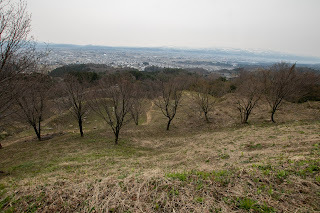 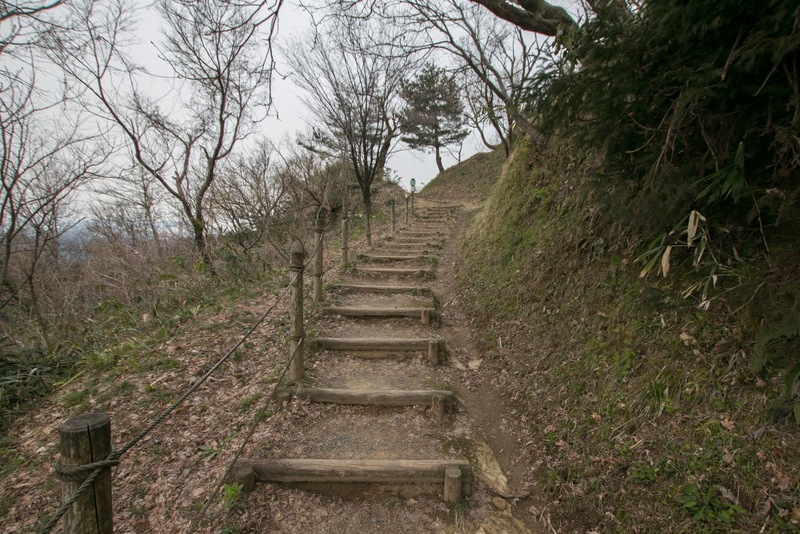 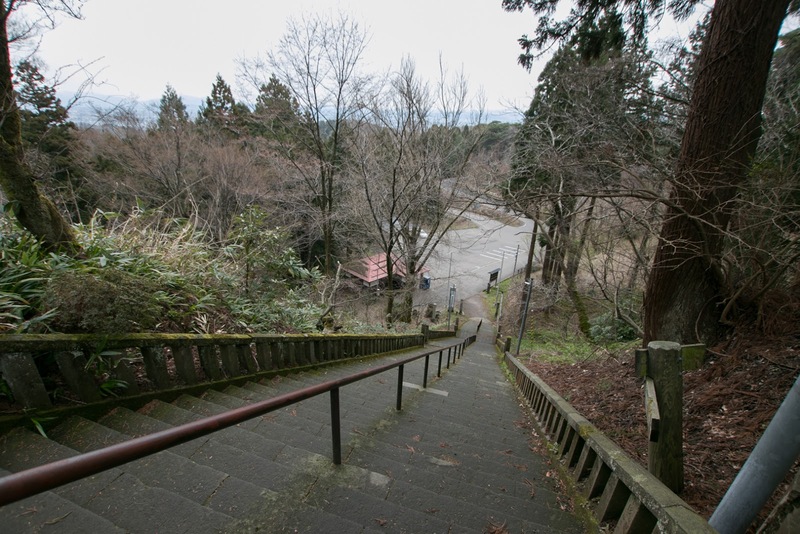 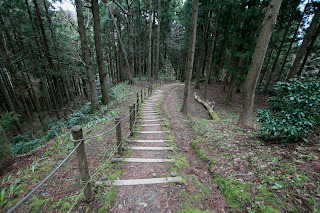 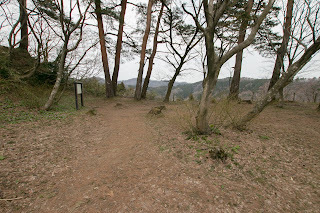 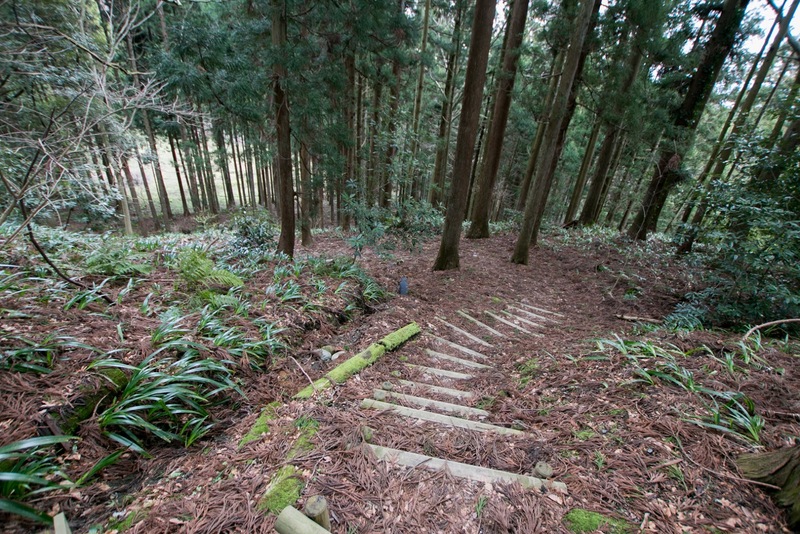 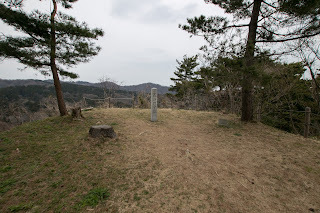 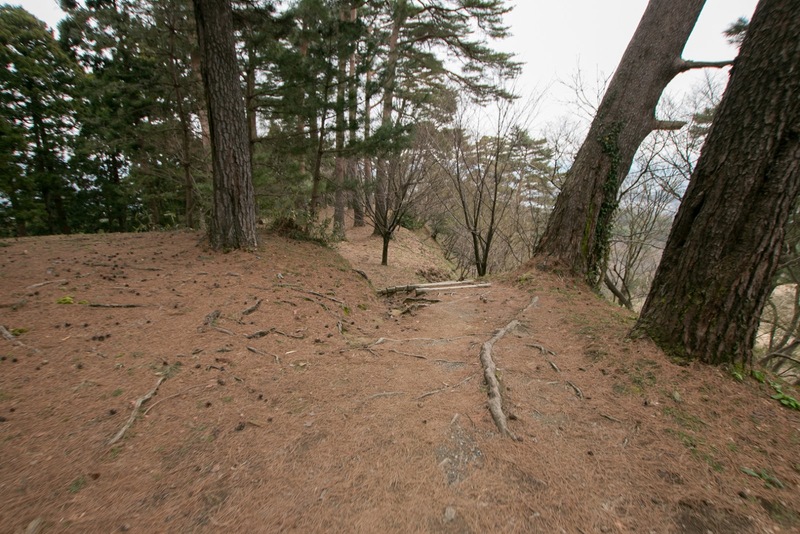 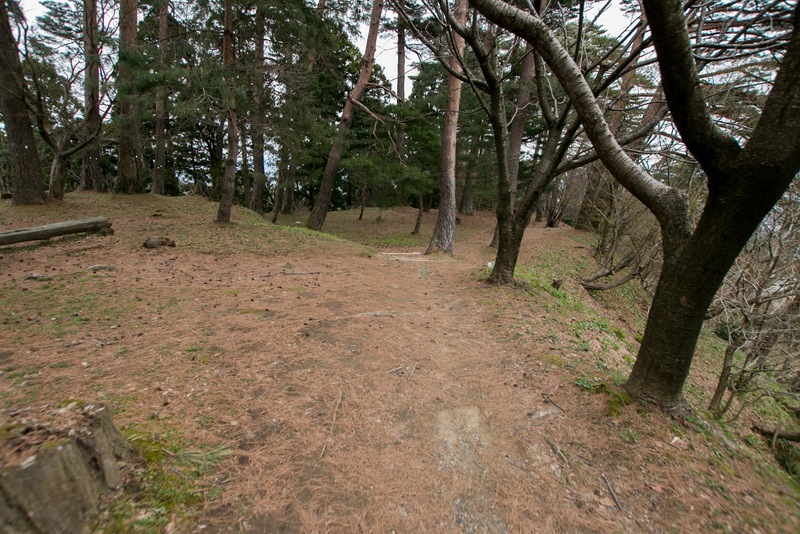 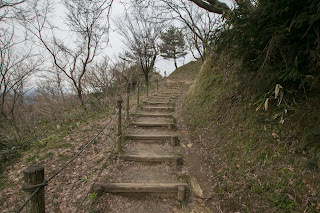 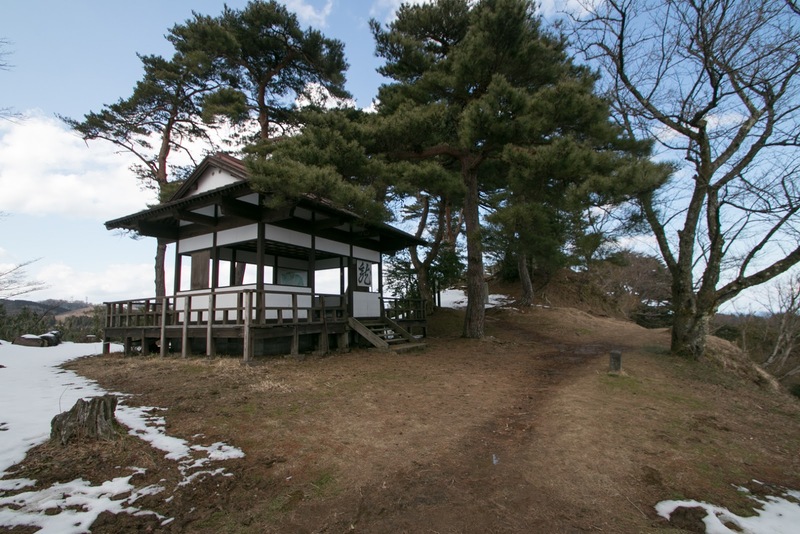 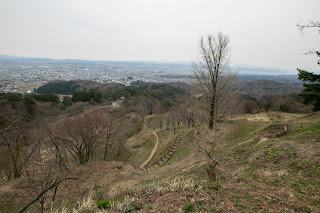 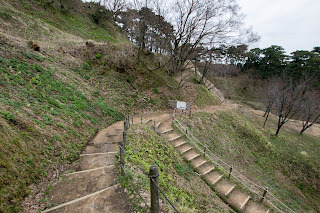 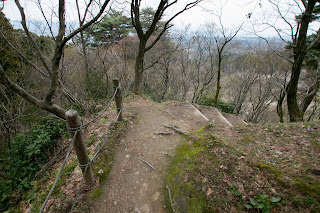 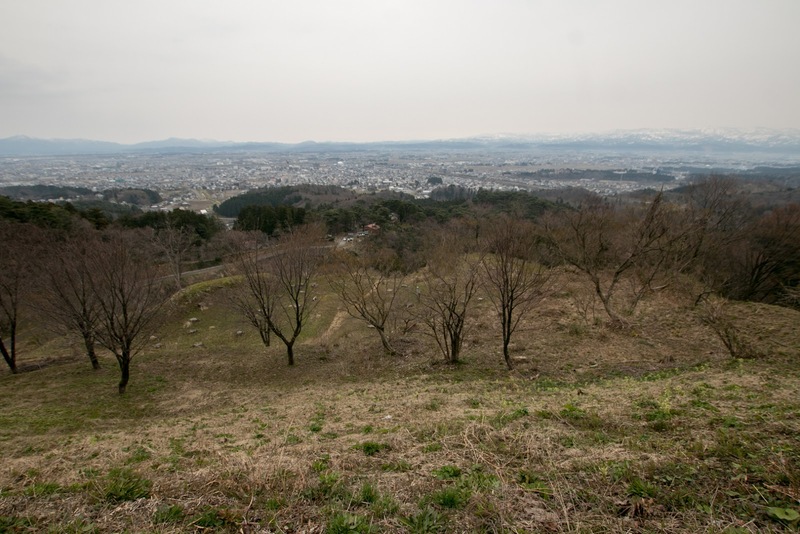 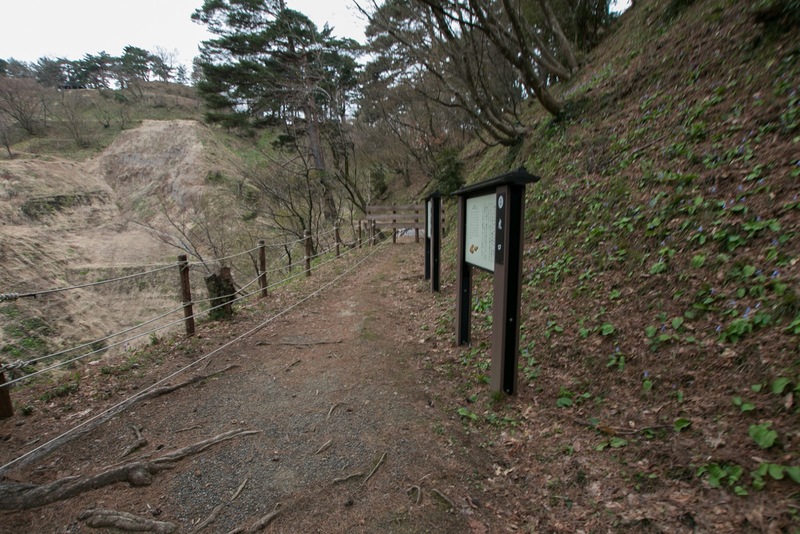 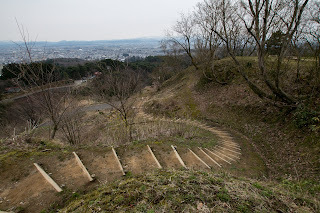 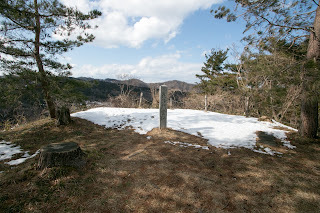 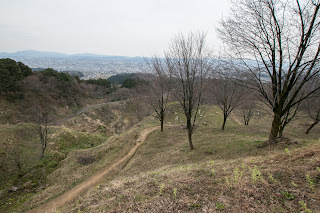 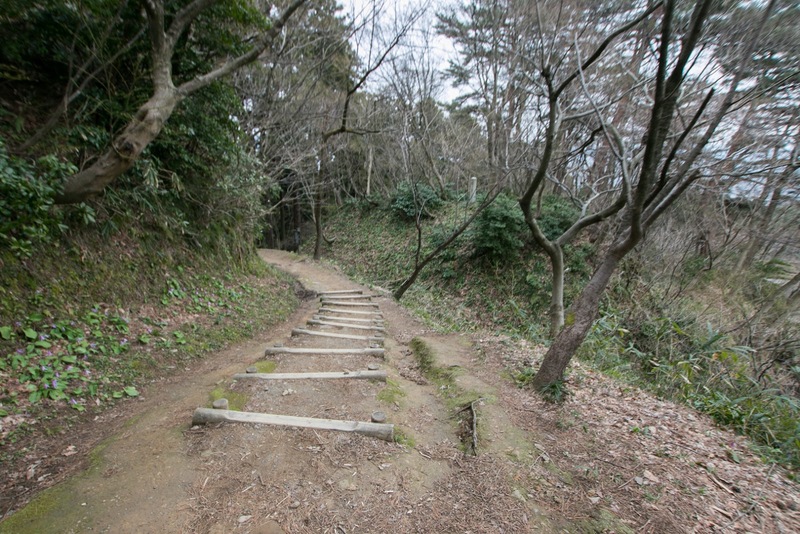 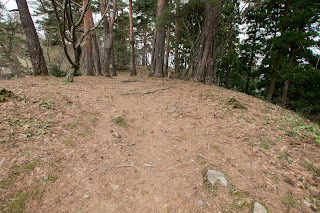 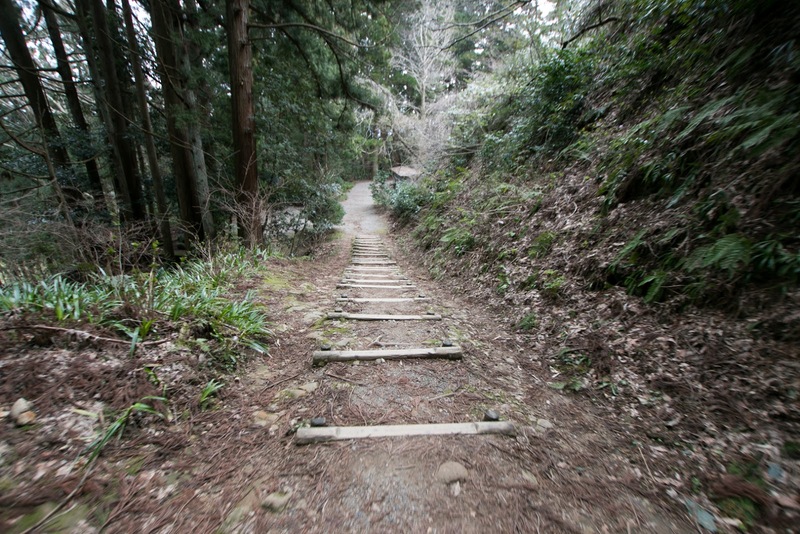 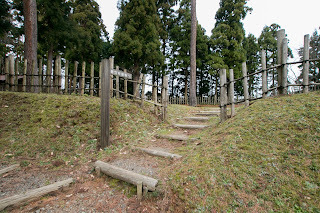 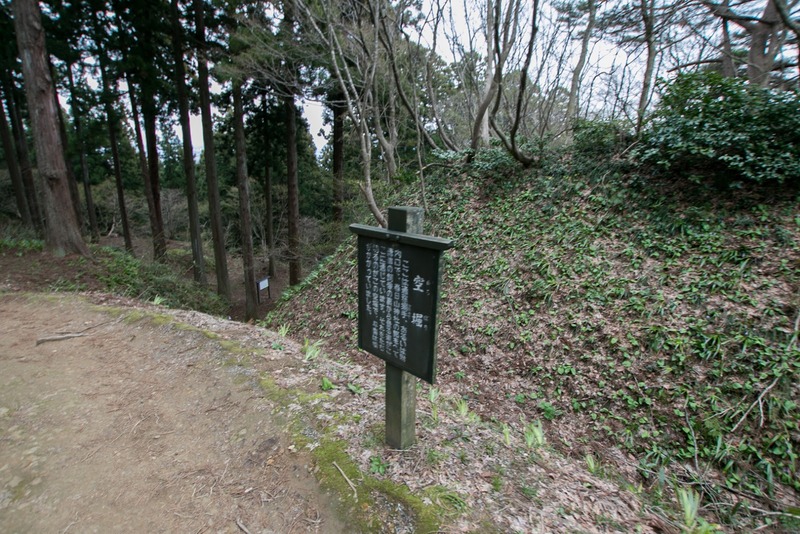 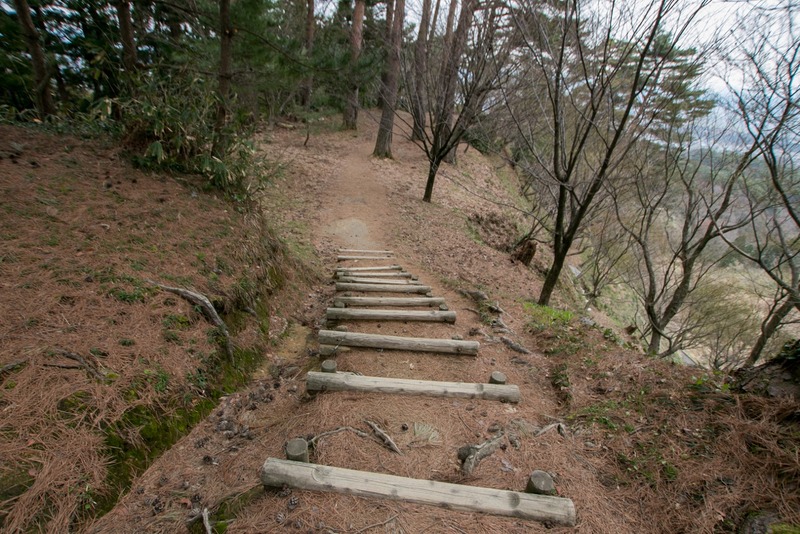 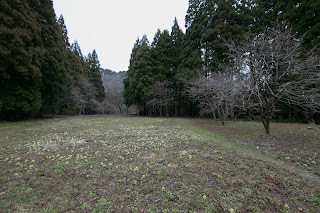 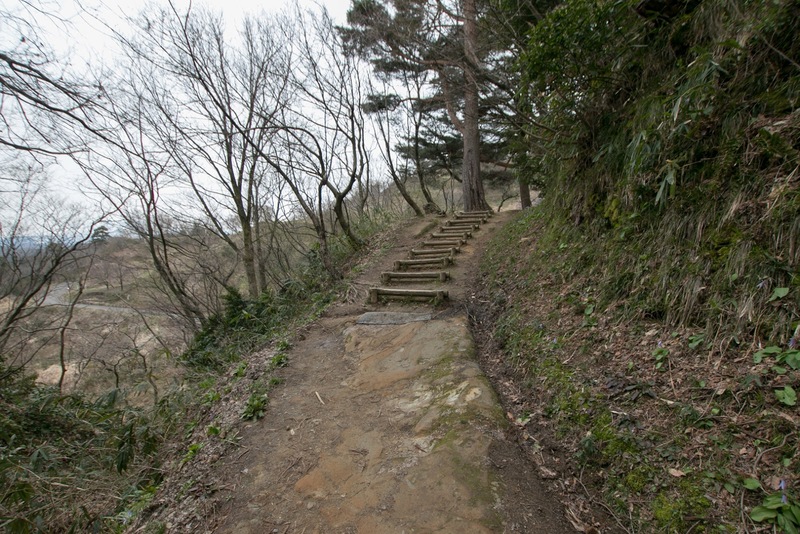 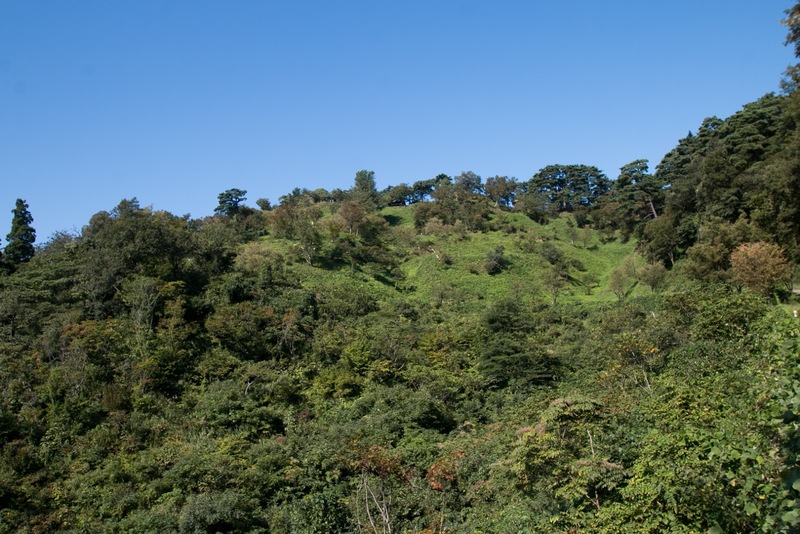 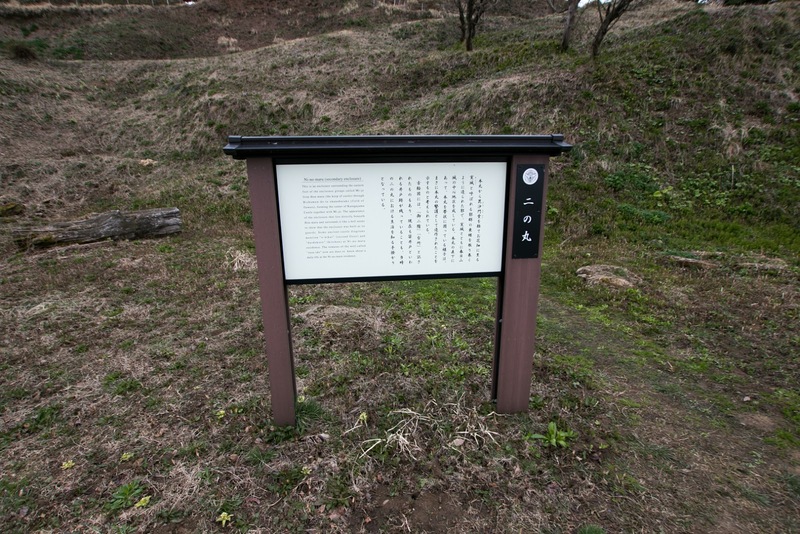 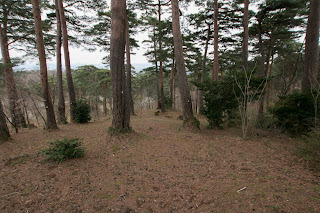 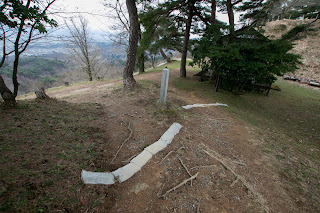 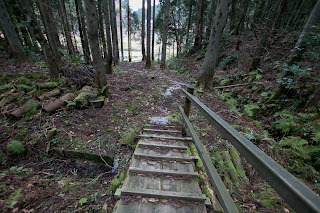 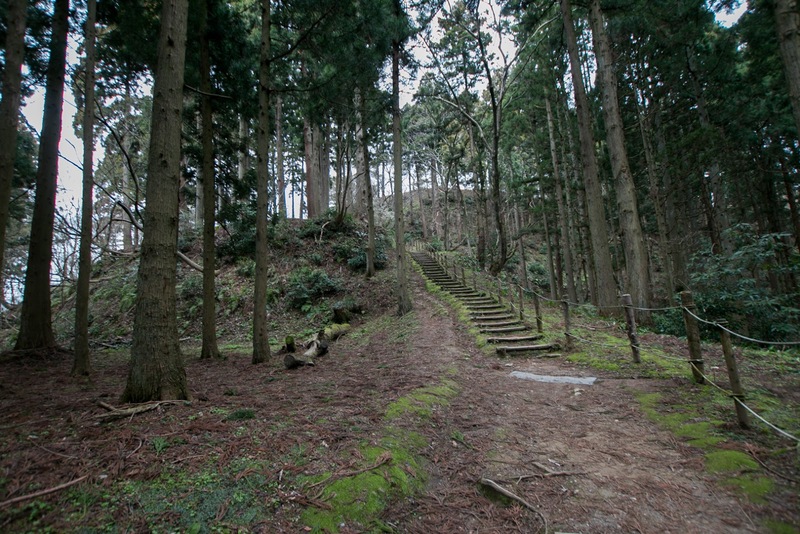 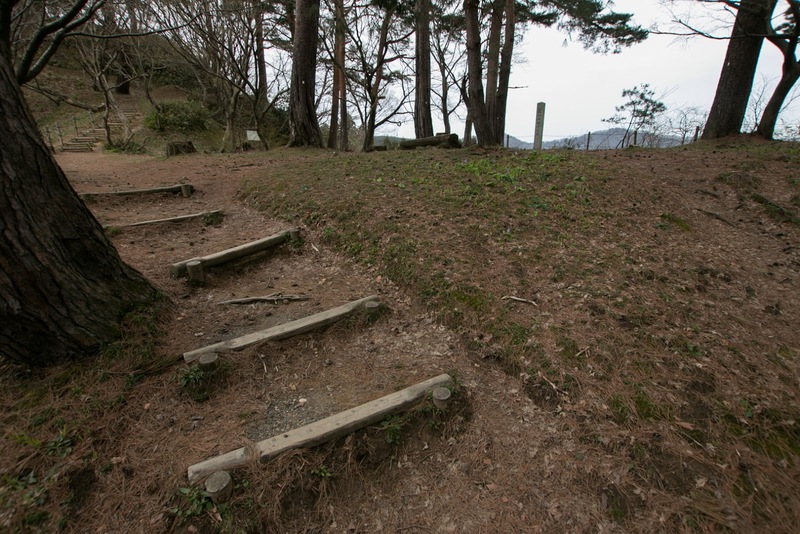 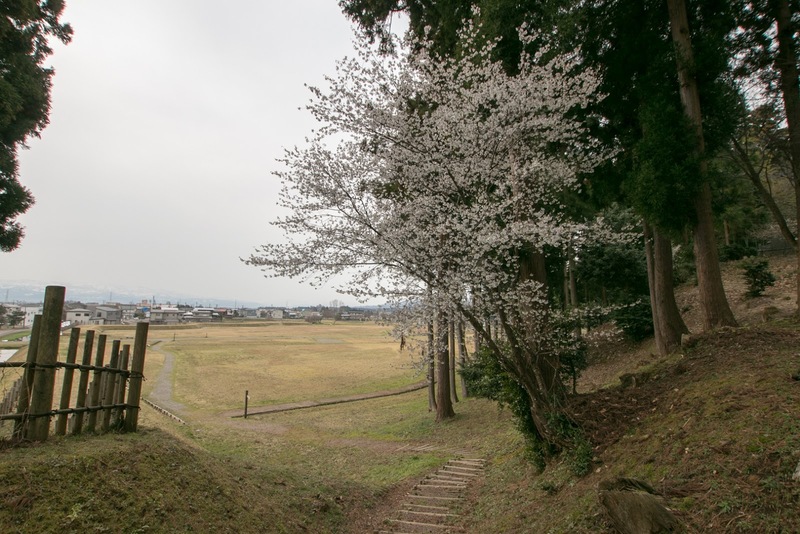 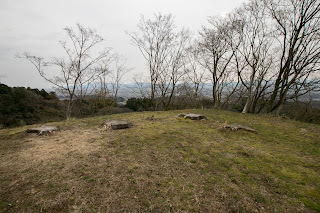 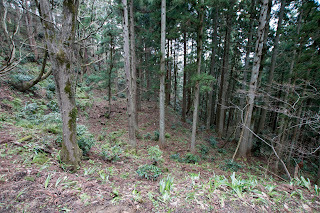 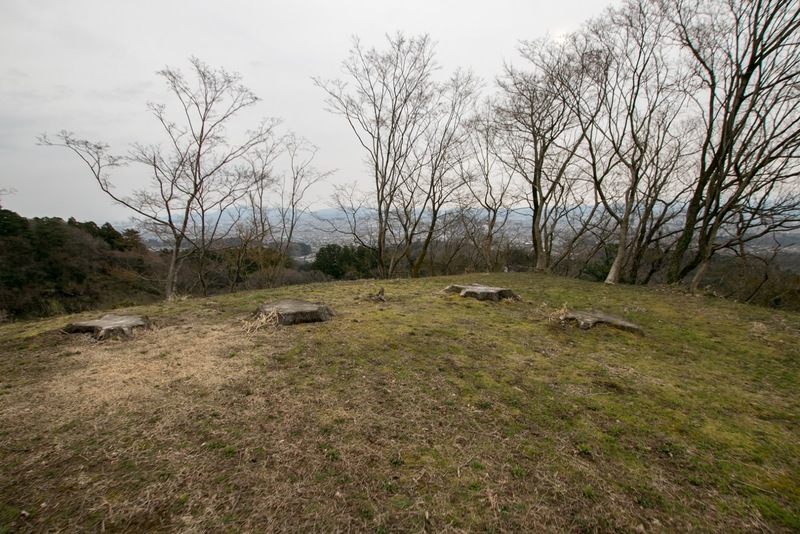 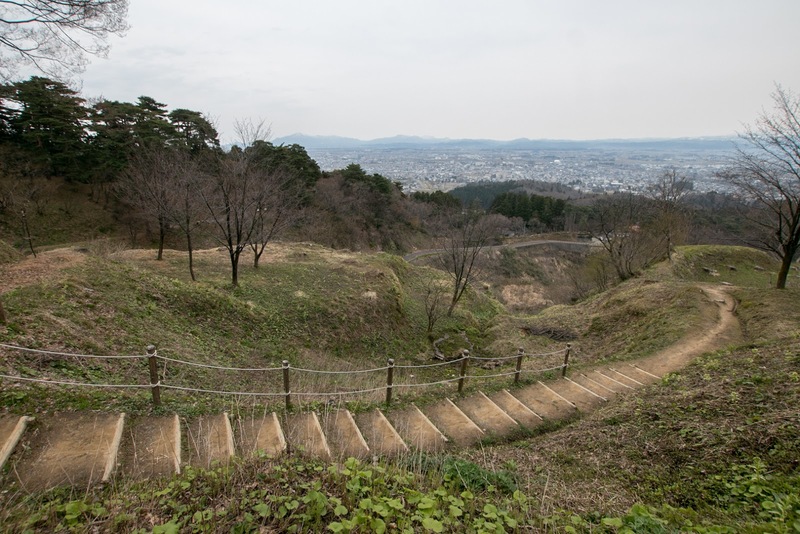 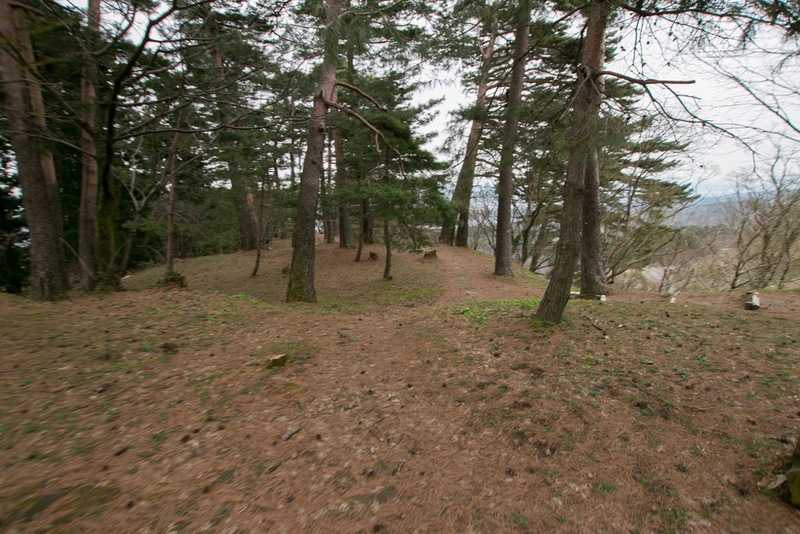 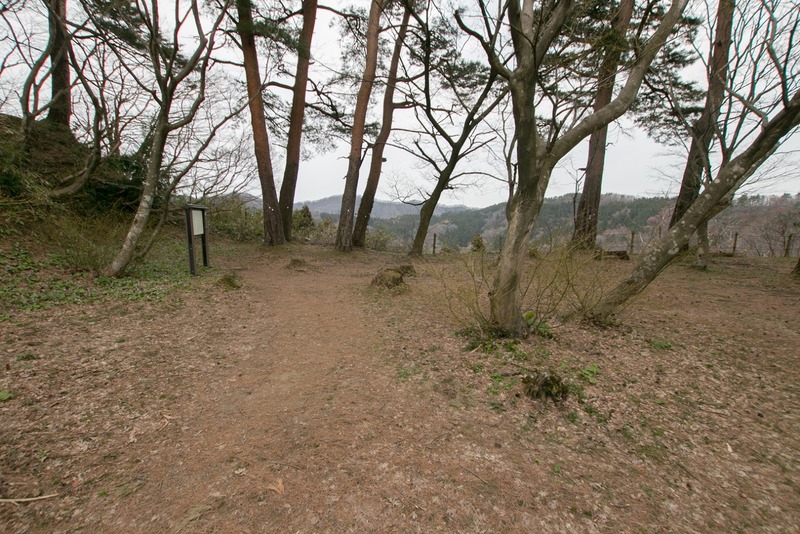 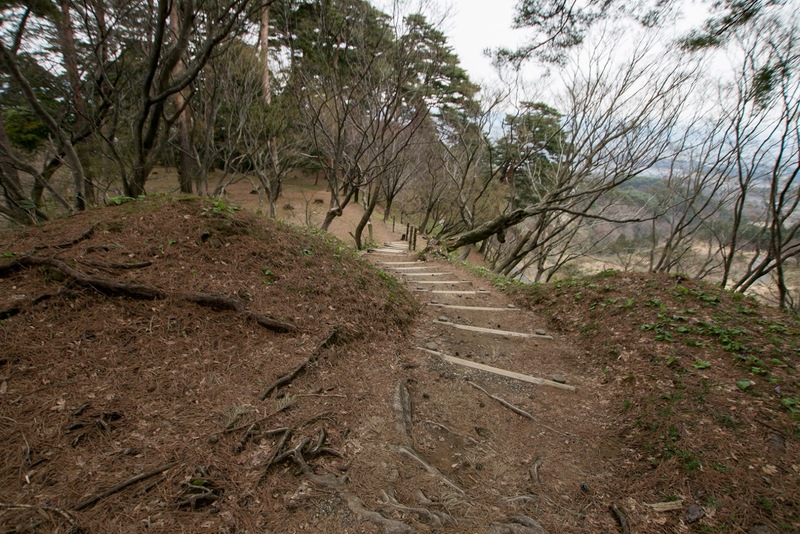 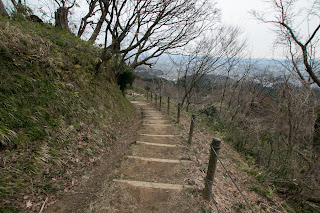 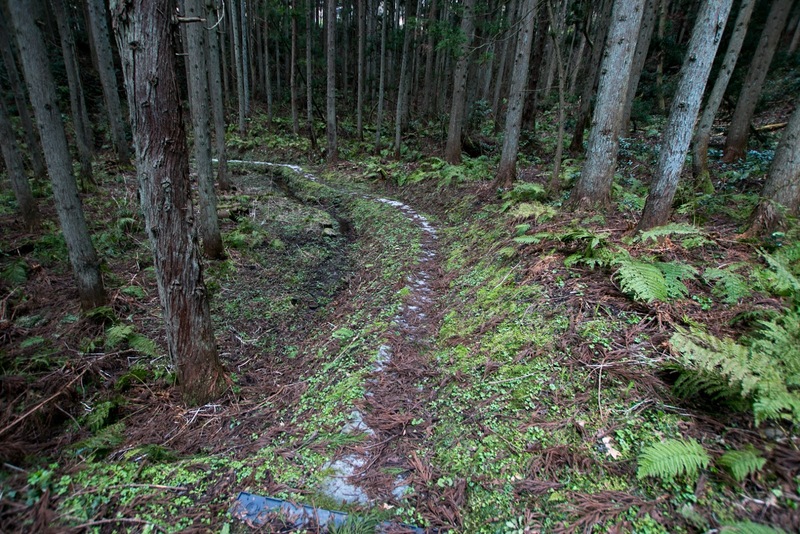 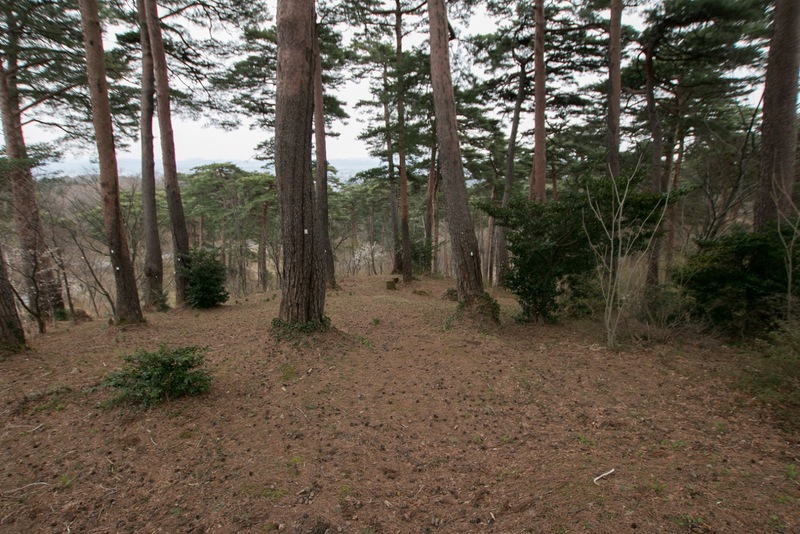 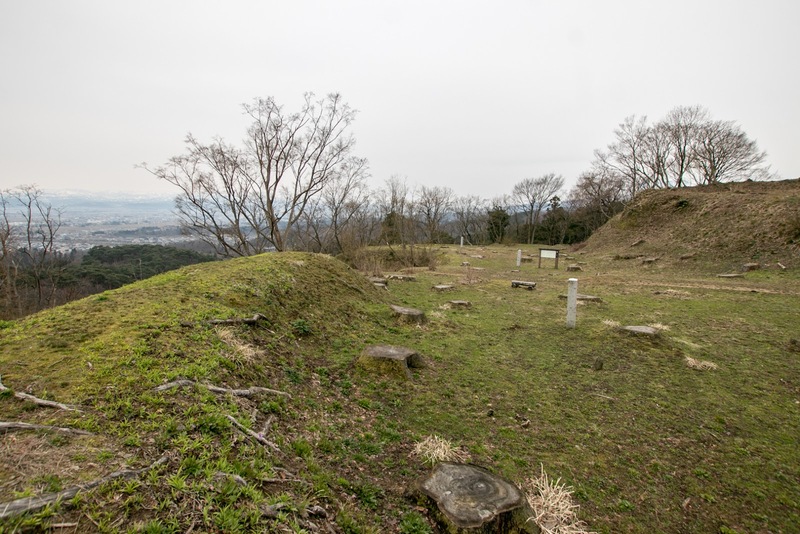 On the other hand, at the north ridge there are several terraces used by Kagetsuna Naoe (1554-1579). 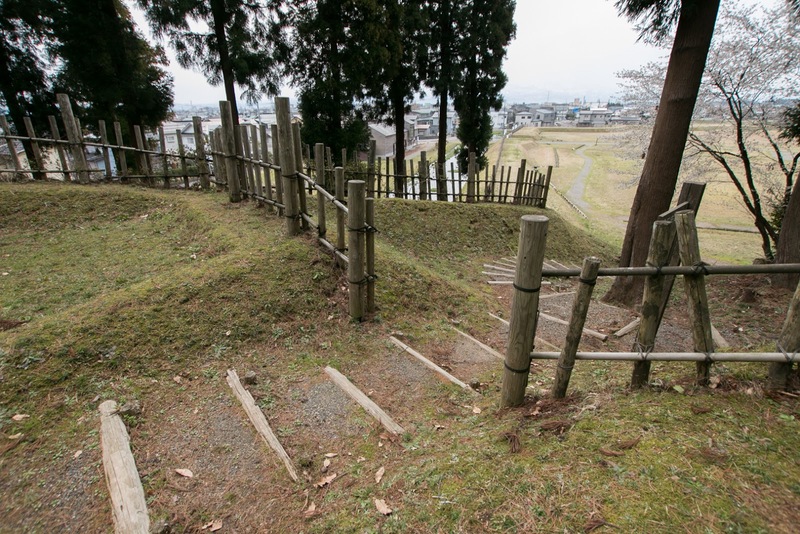 another important retainer of Kenshin. 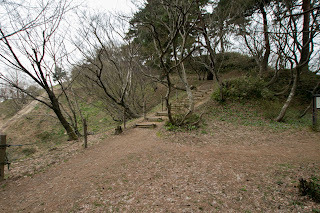 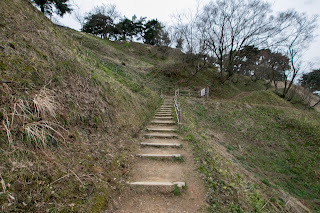 At the halfway of slope just below the central area, there were storage area and residence of Kagetora Uesugi (1513-1575), another adopted son of Kenshin. 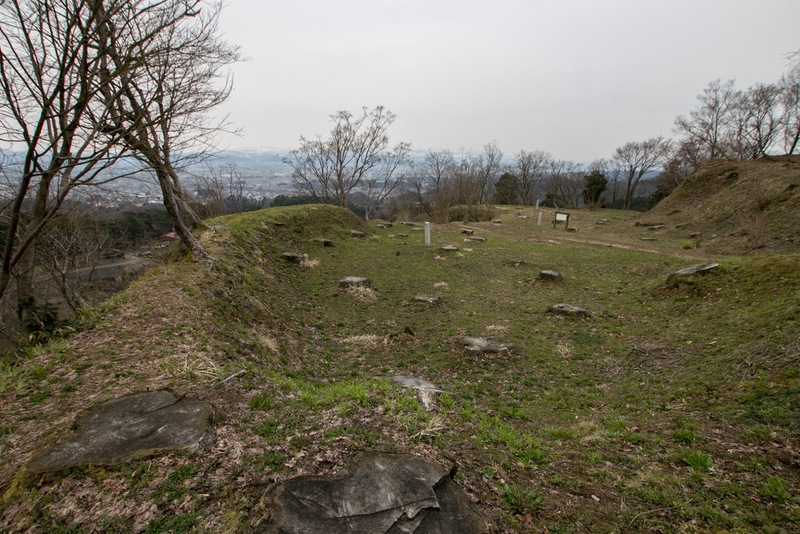 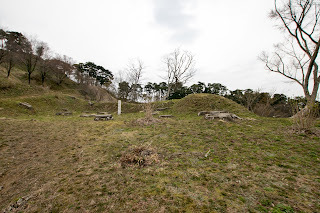 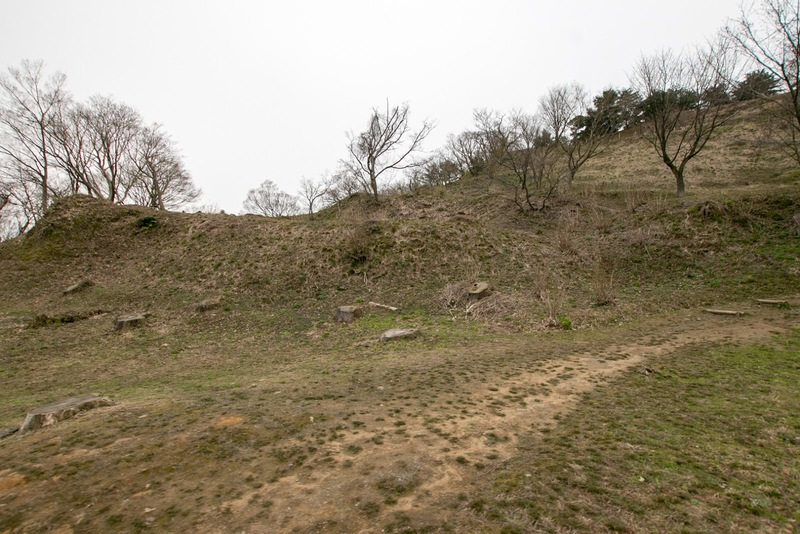 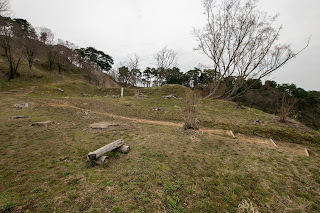 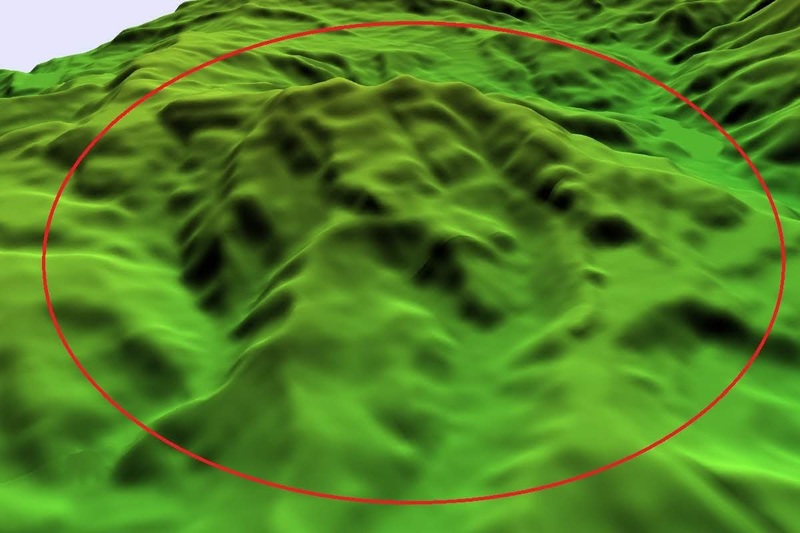 Other than these areas, numerous terraces covered from hilltop to hillside area, which were used for house of retainers and soldiers. 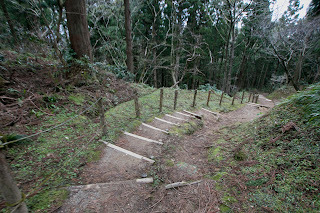 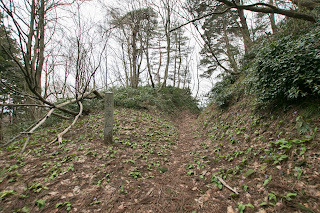 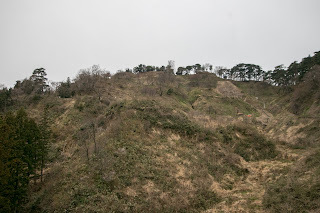 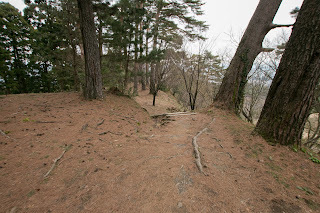 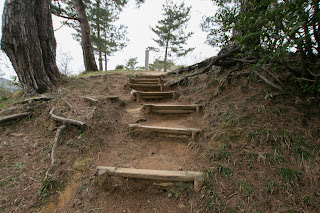 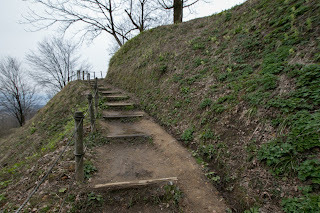 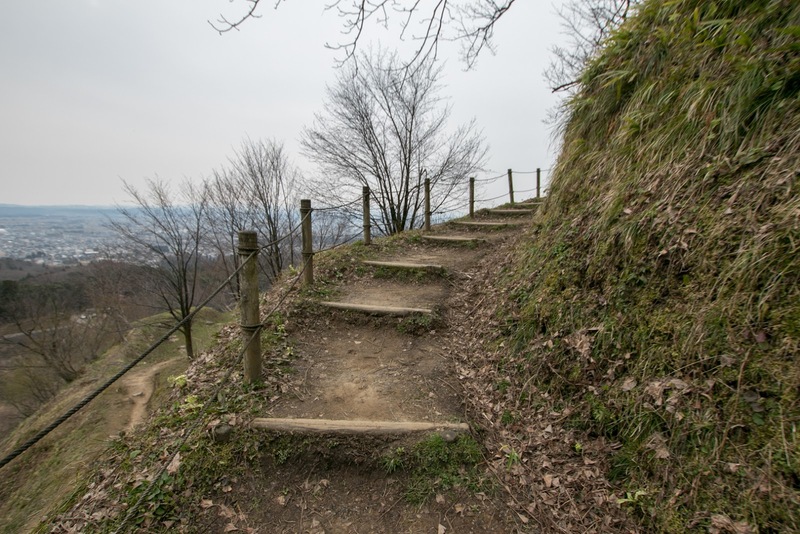 Main route of the castle was connected to south ridge of the mountain, and at the side of north ridge there were large residence of the lord. 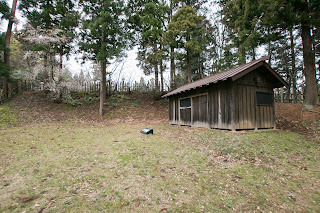 Next to this residence there was Rinsenji Temple where Kenshin grew up. 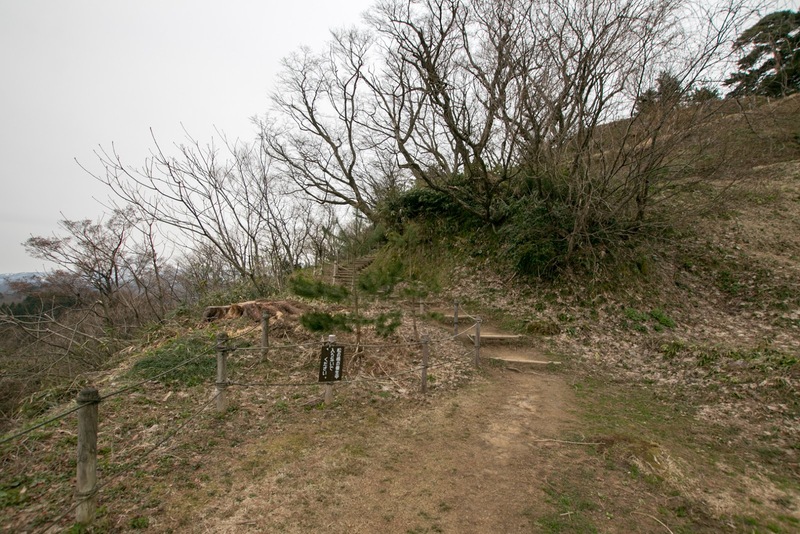 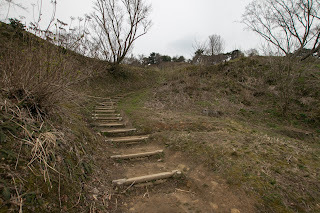 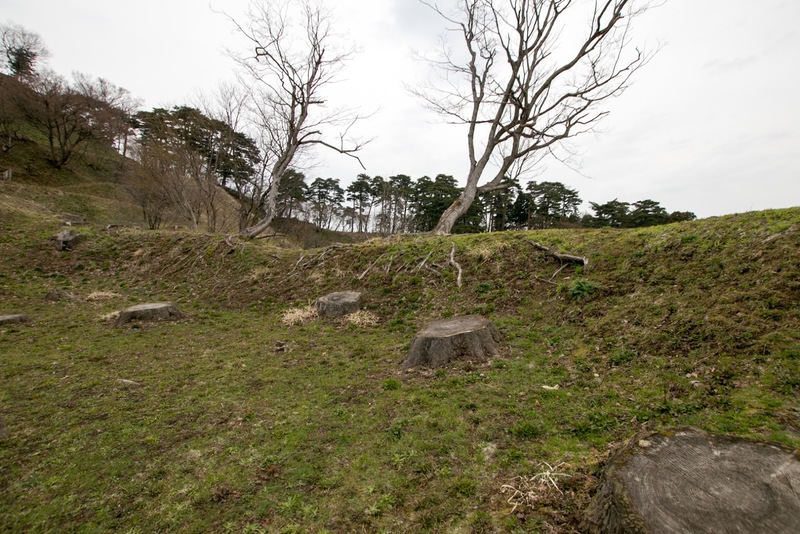 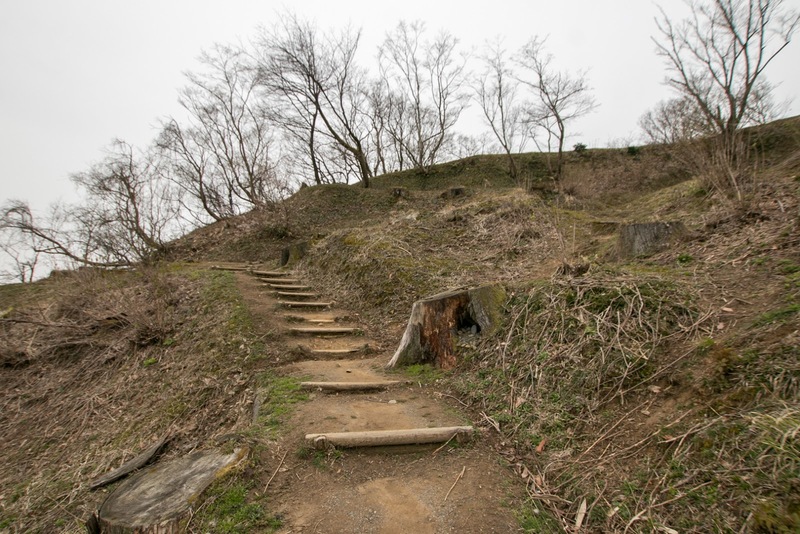 After the death of Kenshin in March 1578, an internal conflict for successor named “Otate no Ran” occured and Kasugayama castle became the place of the battle. As a enthusiastic Buddhist, Kenshin did not marry and had no actual son, then Kenshin adopted two sons for future successor. One of these two adopted son was Kagekatsu Uesugi, son of Masakage Nagao (1526-1564), former rival of Kenshin, and was applicable to nephew of Kenshin. Other one was Kagetora Uesugi , originally the son of Ujiyasu Hojyo (1515-1571), the warlord of Sagami country and who came to Echigo country when Uesugi clan and Hojyo clan made peace in 1569. 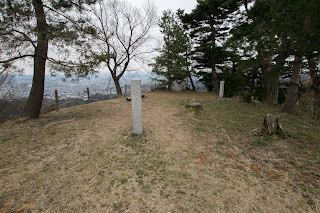 As Kenshin died without stating his successor, both party started the battle for successor just after the death of Kenshin. 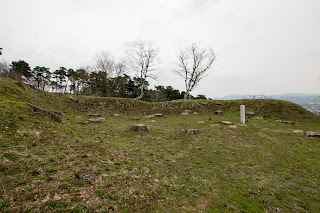 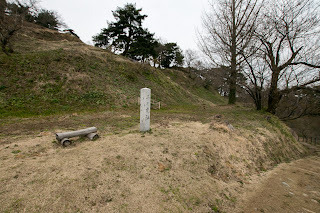 As Kagekatsu was close to the close retainers of Kenshin, Kagekatsu seized main part of Kasugayama castle promptly and grasped the government and fund. 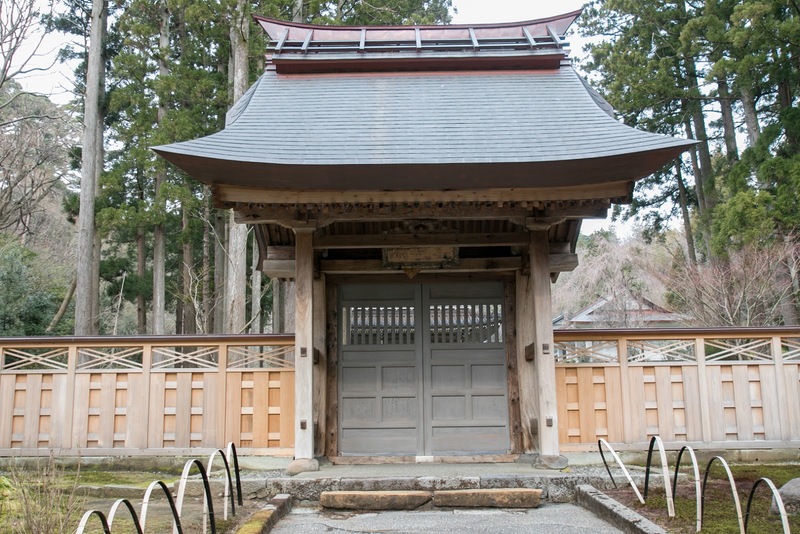 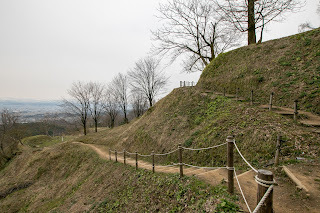 Contrary to this, delayed Kagetora left Kasugayama castle and besieged at Otate residence, the residence of Norimasa Uesugi who was the former Kanto Kanrei, and waited for the reinforcement from his parental home Hojyo clan and other large lords who supported Kagetora. 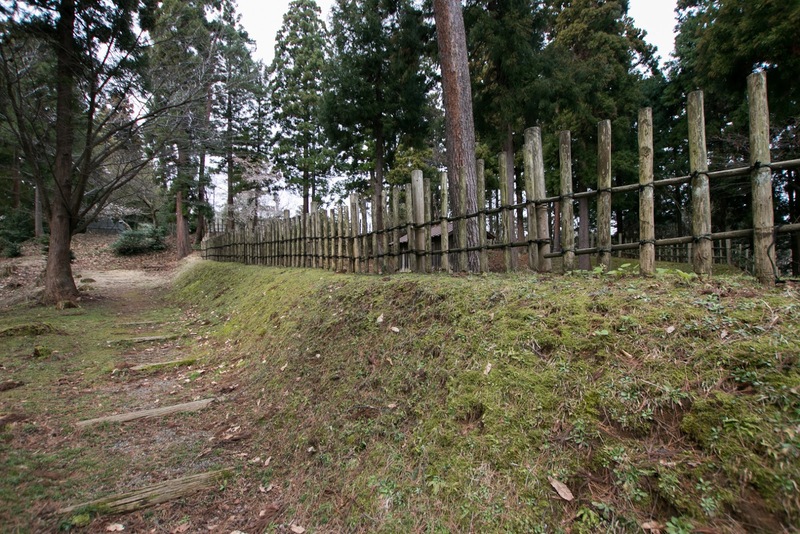 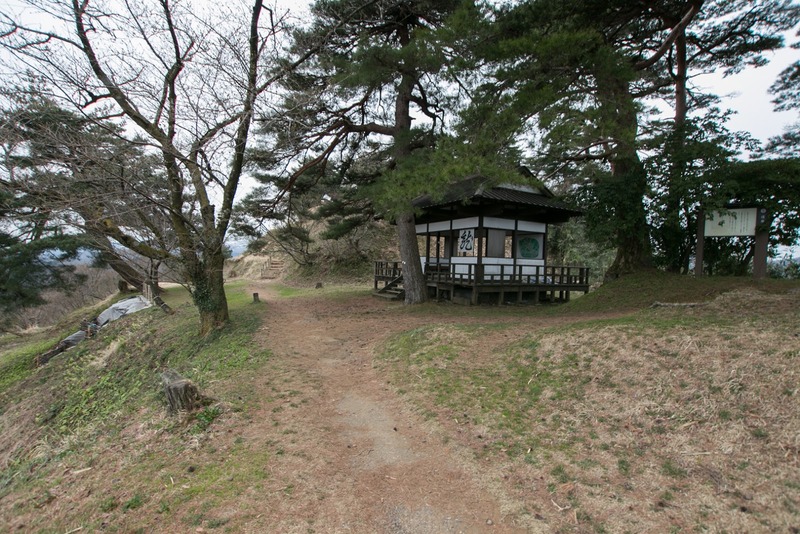 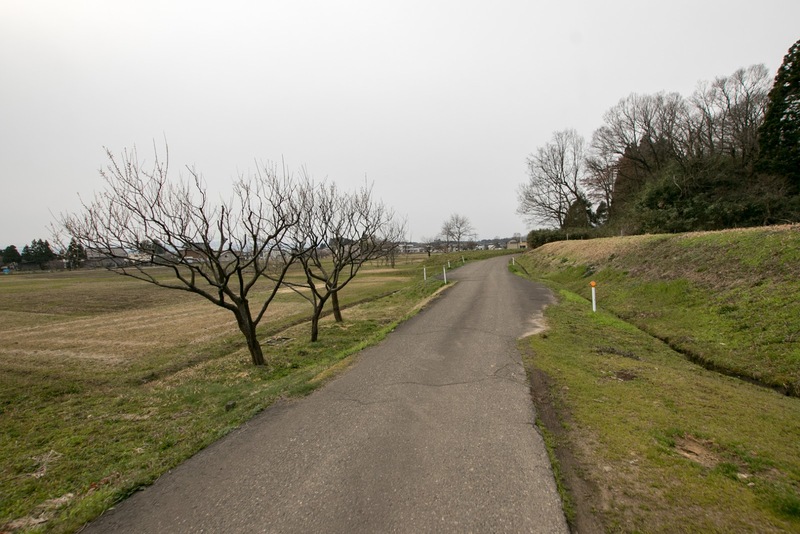 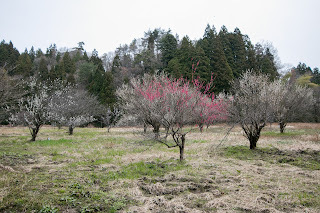 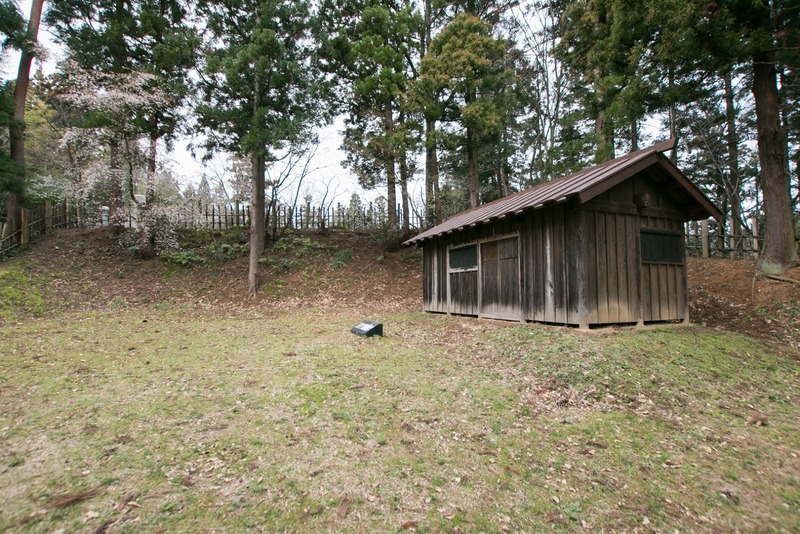 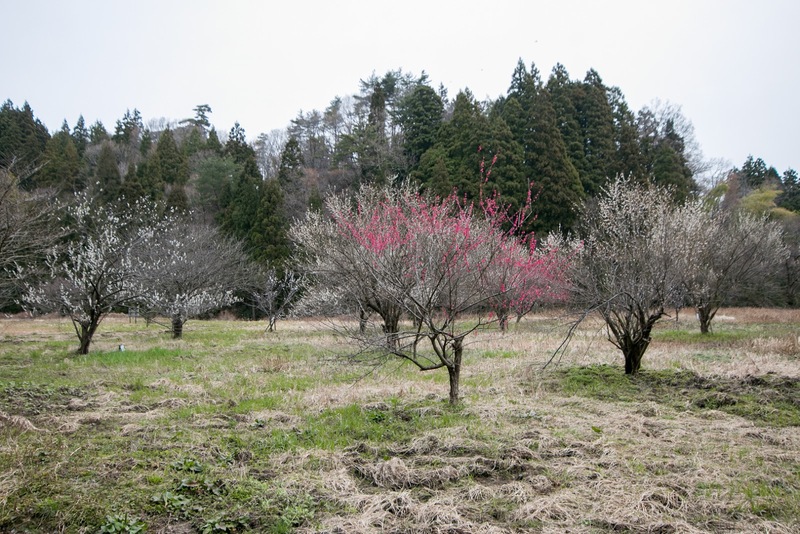 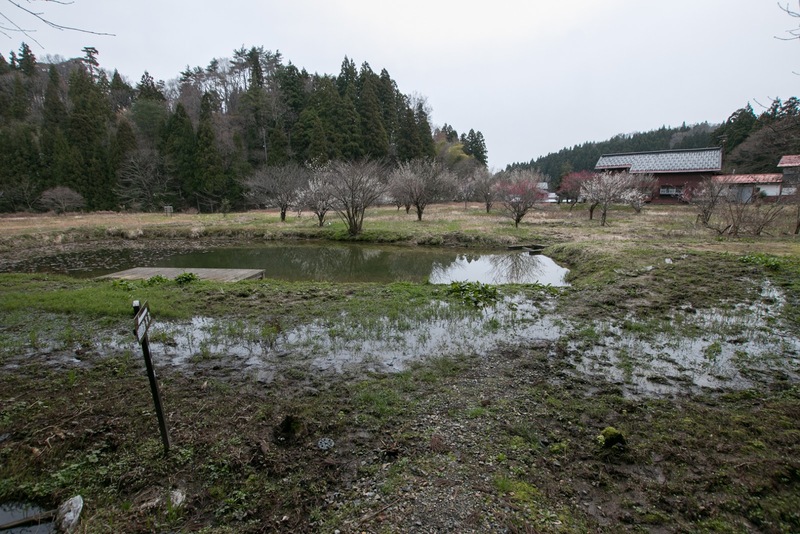 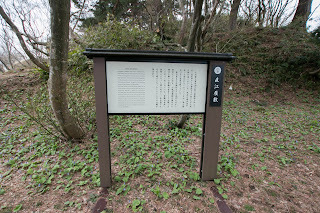 As Kagekatsu seized neighbor area of Kasugayama castle, Kagetora was isolated at Otate residence. But being supported by two large warlords Hojyo clan and its ally Takeda clan, once these powers interfered the incident the situation could be easily reversed. 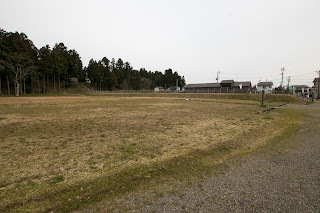 But facing this sitation, under tough negotiation Kagekatsu won Takeda clan to his side, and firmly guarded the advance of Hojyo clan at Uonuma arae, his main territory. 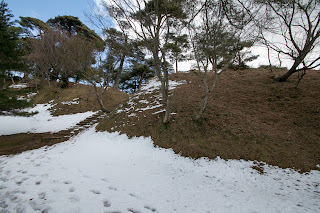 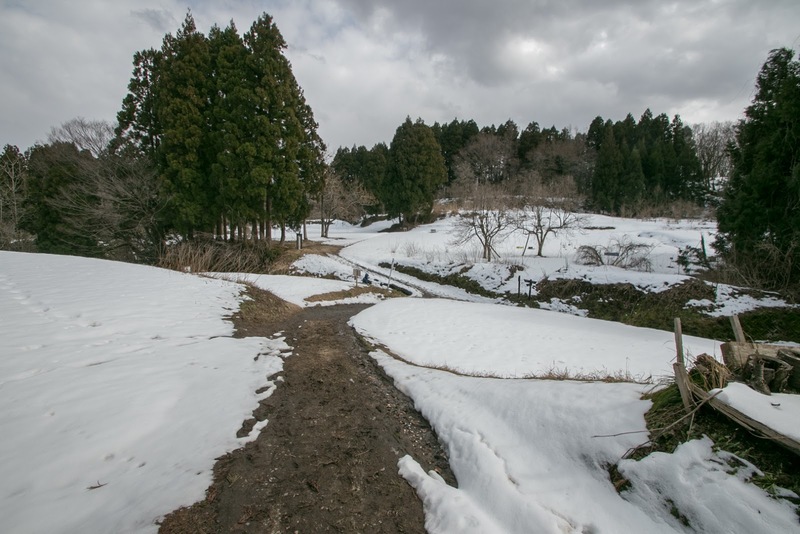 Obstructed by strong guard of Kagekatsu and heavy snow, Hojyo army could not rescue Kagetora and had to return to their country. 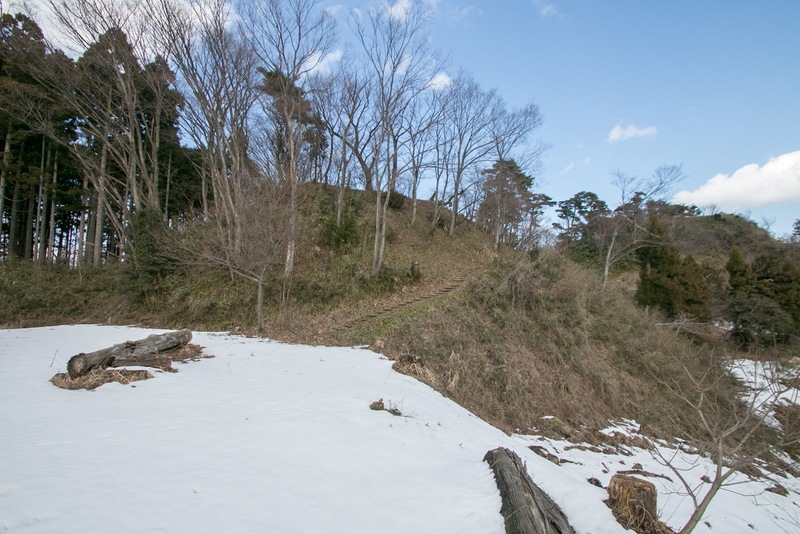 Kagekatsu endured the invasion of Hojyo clan tried to settle the situation during the winter and made fierce attack to Kagetora side. During the winter between 1578 and 1579, Kagetora lost major generals and lost their supply. 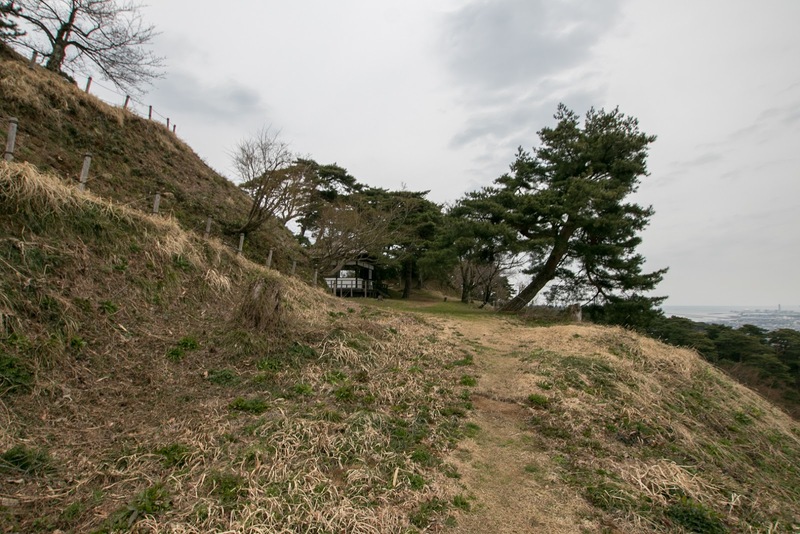 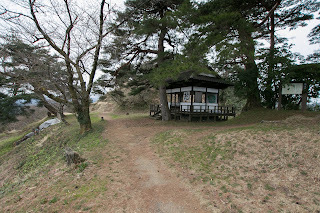 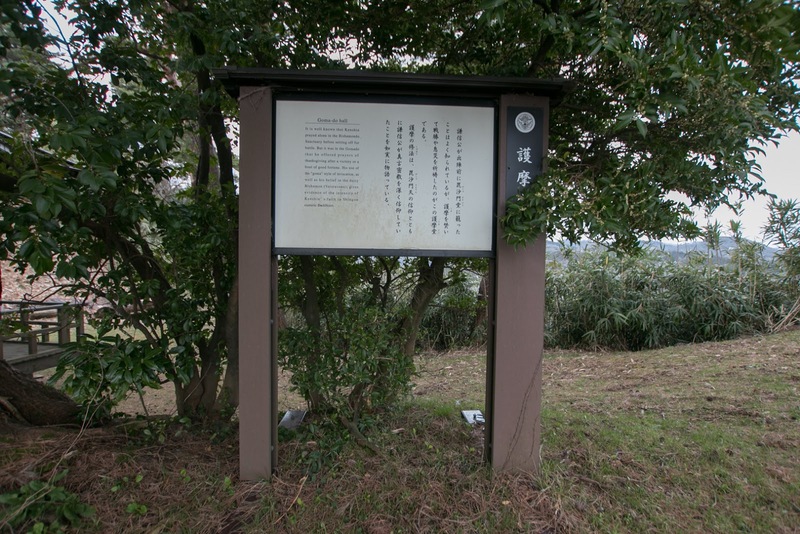 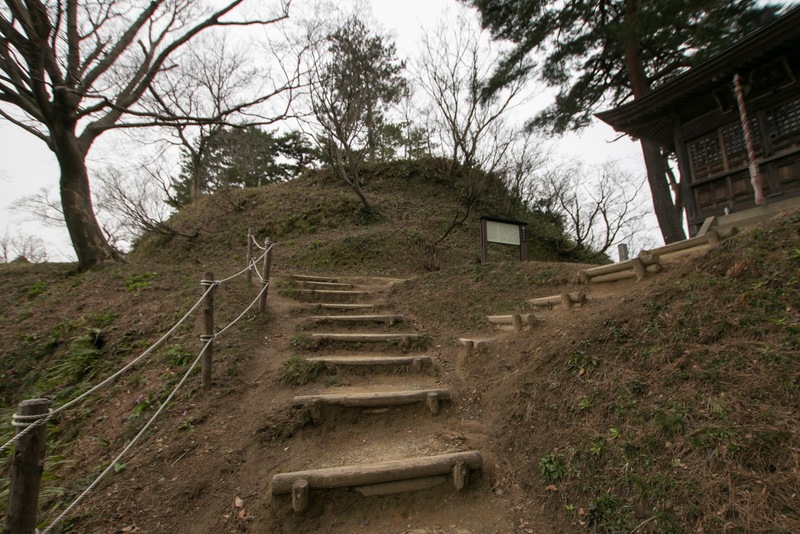 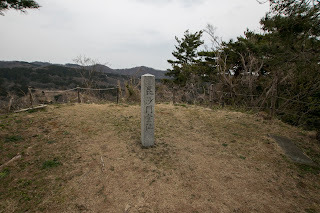 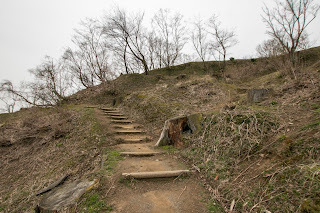 In March 1579 Kagetora left Otate residence and moved to Samegao castle at the border to Shinano country, but facing betrayal of commander Kagetora killed himself there. Now the gruesome internal conflict had finished and Kagekatsu became the successor of Kenshin. 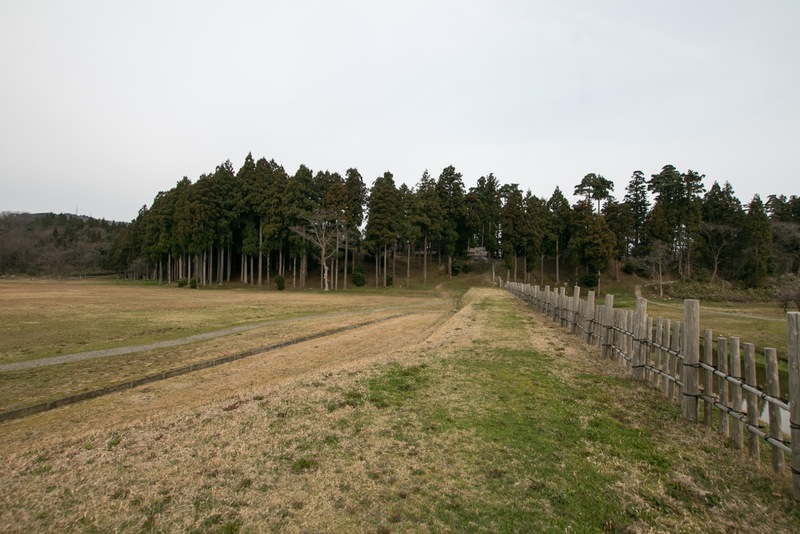 Although Kagekatsu reunited Echigo country, during the internal conflict Uesugi clan significantly lost their power. 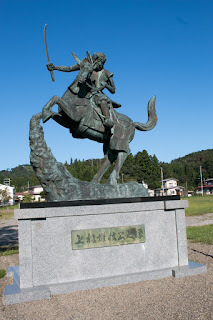 During the conflict, Katsuie Shibata (1522-1583), regional commander of Hokuriku region under central ruler Nobunaga Oda (1534-1582), gradually expand their territory and captured Noto country (Noto peninsula) and western half of Ecchu country (Toyama prefecture). Internally, Shigeie Shibata (1547-1587), a brave general at Shibota castle who supported Kagekatsu at the conflict, revolted supported by Nobunaga due to the shortage of reward. In 1582, the situation became worse for Uesugi clan. 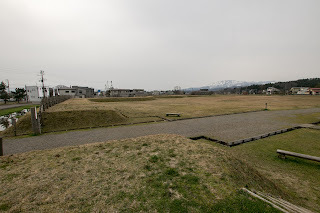 In March, Katsuyori Takeda (1546-1582), an ally of Kagekatsu, was easily extinguished by Nobunaga Oda, and Shinano country just 50 kilometer apart from Kasugayama castle was seized by Oda clan. 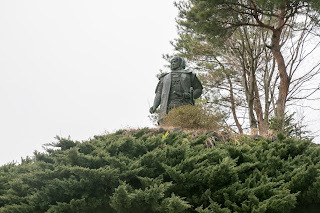 Nagayoshi Mori (1558-1584), commander of Shinano country, suppressed Uesugi clan from southward. 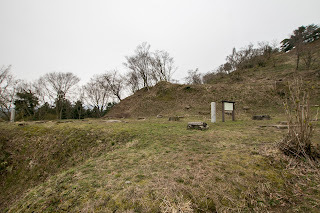 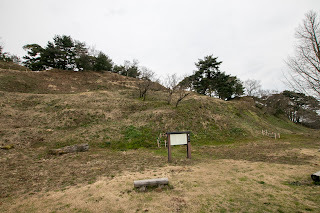 On the other hand, in Ecchu country, Uozu castle (Uozu city) which was the last base of Uesugi clan in Ecchu country was under close siege of Katsuie Shibata. 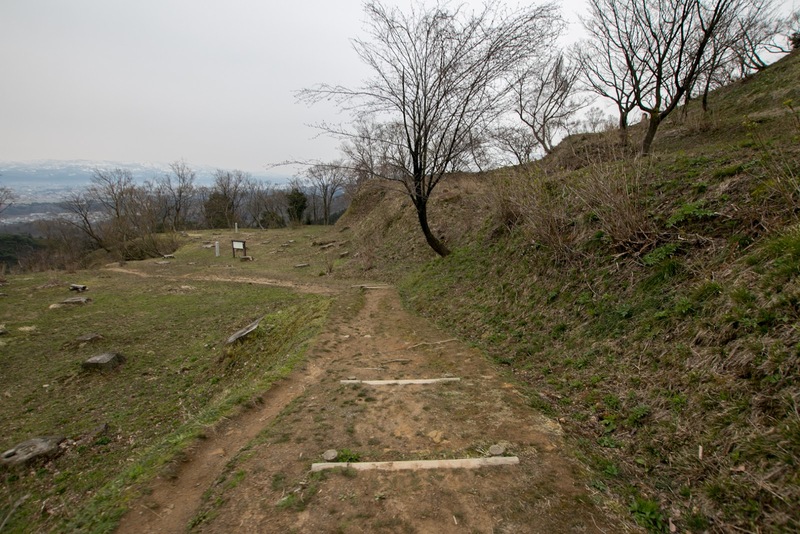 As having enemy in two directions Kakegatsu could not rescue Uozu castle, and in June Uozu castle fell with the life of generals. Adding resistance of Shigeie Shibota, Kagekatsu and Uesugi clan was forced to the corner of downfall this time. 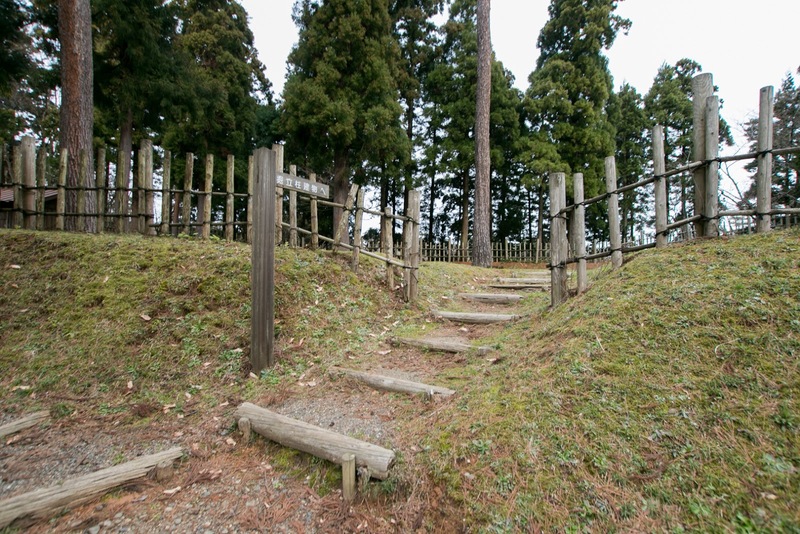 Kagekatsu stated in the letter to Satake clan that it is a prestige at next world to fight with all over Japan only by one Echigo country. But at the same day of the fall of Uozu castle. 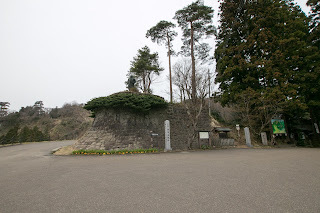 Nobunaga died at the incident of Honnoji, a coup d’etat made by his general Mitsuhide Akechi (1528-1582). To cope with Mitsuhide and revel of people, Katsuie gave up further attack to Uesugi clan and returned to his territory. Further in 1583, Katsuie fought with Hideyoshi Toyotomi (1537-1598), another commander of Nobunaga and who made revenge to Mitsuhide at the battle of Yamazaki, aiming at the successor of Nobunaga. This time Katsuie was asked by Hideyoshi to restraint Katsuie from backside and coped with that. 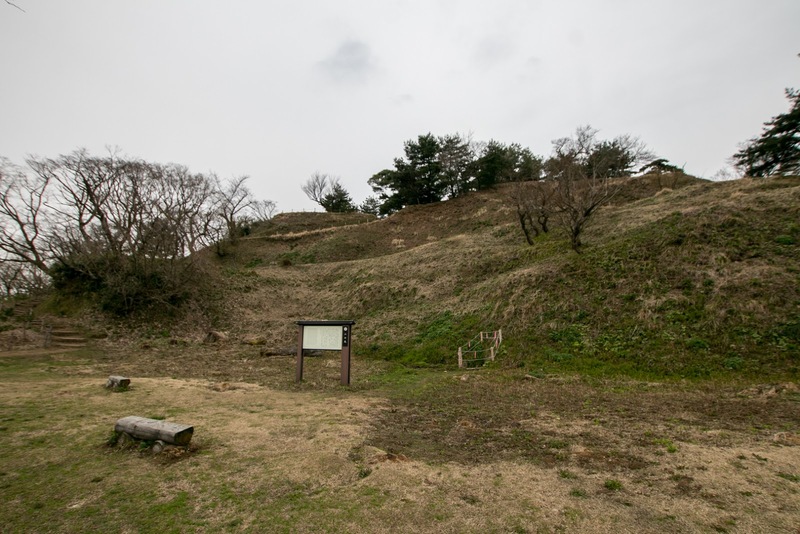 Two years later, Kagekatsu assisted Hideyoshi again at the attack to Narimasa Sasa (1536-1588), a former Oda general at Toyama castle. 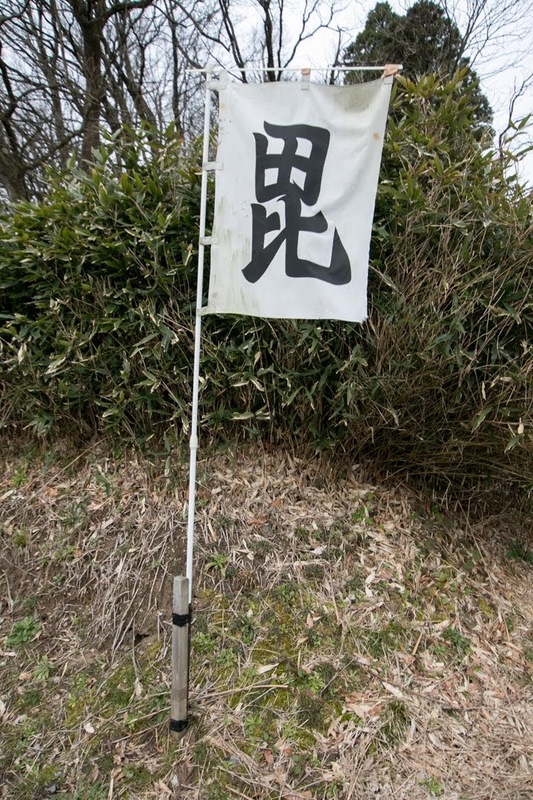 Through these movements, Uesugi clan became close to Toyotomi government. 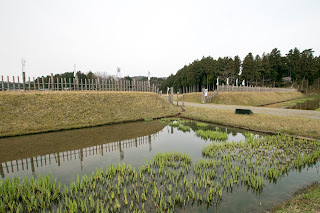 Especially Kanetsugu Naoe (1560-1619), a general minister of Uesugi clan, became acquinted with Mitsunari Ishida (1560-1600), the chief administrative staff of Toyotomi government. 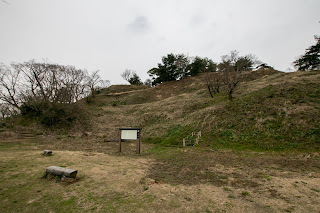 Under acknowledgment of Hideyoshi, Kagekatsu suppressed the revolt of Shigeie Shibata after seven year from occurrence, and occupied Sado island which had good gold mine. 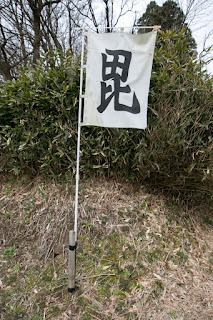 Now Uesugi clan left the crisis and became the one of the strong lords under Toyotomi government. 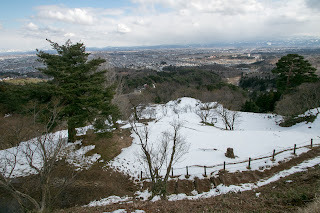 In 1598, after the death of Ujisato Gamo, Kagekatsu was transferred to Aizu area and became the lord of Aizu Wakamatsu castle with large territory. 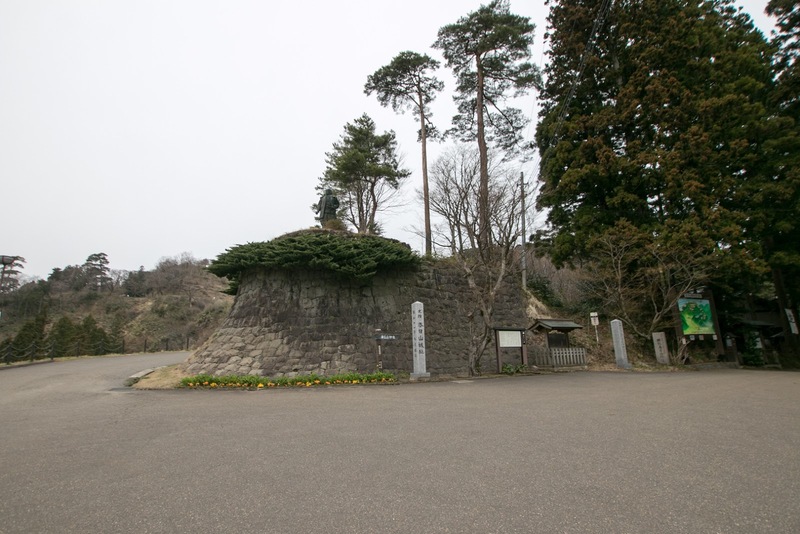 Hideyoshi intended Kagekatsu as a restraint against Ieyasu Tokugawa (1543-1616), the largest lord under Toyotomi government which held Kanto region. Kagekatsu also became one of the five grand ministers of Toyotomi government. 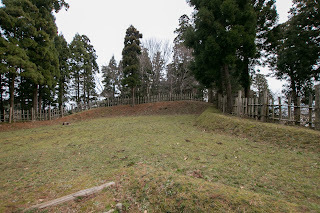 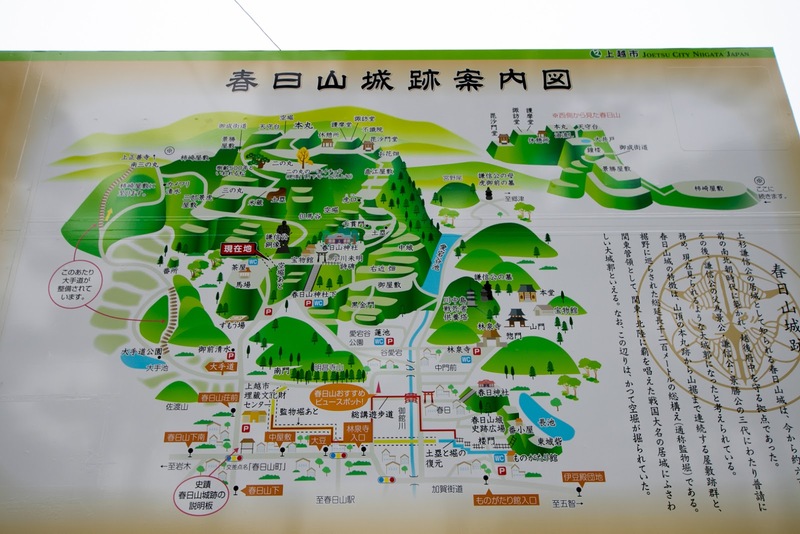 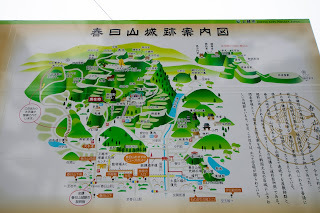 This time Kanetsugu was specially alloted Yonezawa castle (Yamagata prefecture) by Hideyoshi. 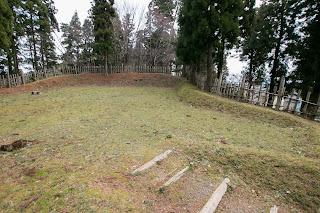 But at that year Hideyoshi left the world in ill. Ieyasu started to aim at next hegemony and made political plots to other lords. 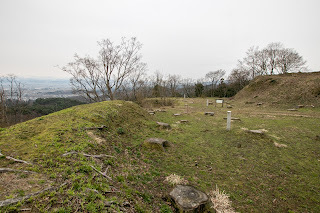 In response to this, as a chief administrative staff of Toyotomi government, Mitsunari Ishida tried to protect Toyotomi government, and Kanetsugu cooperated with Mitsunari. 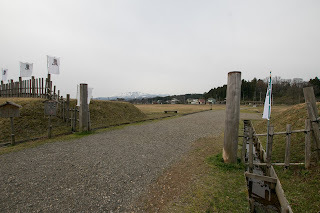 In 1599, Kagekatsu returned to Aizu region and started to prepare for the war. 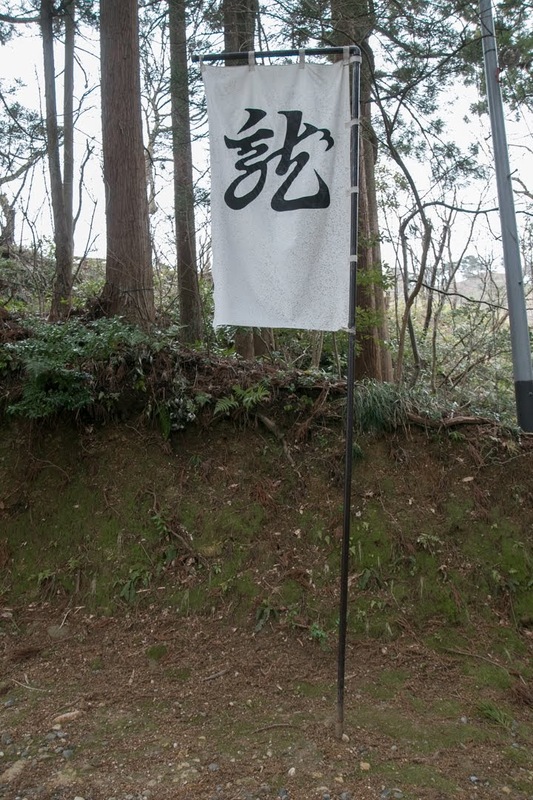 Ieyasu accused this movement as a rebellion, but Kanetsugu contrarily sent a letter of impeachment against Ieyasu. 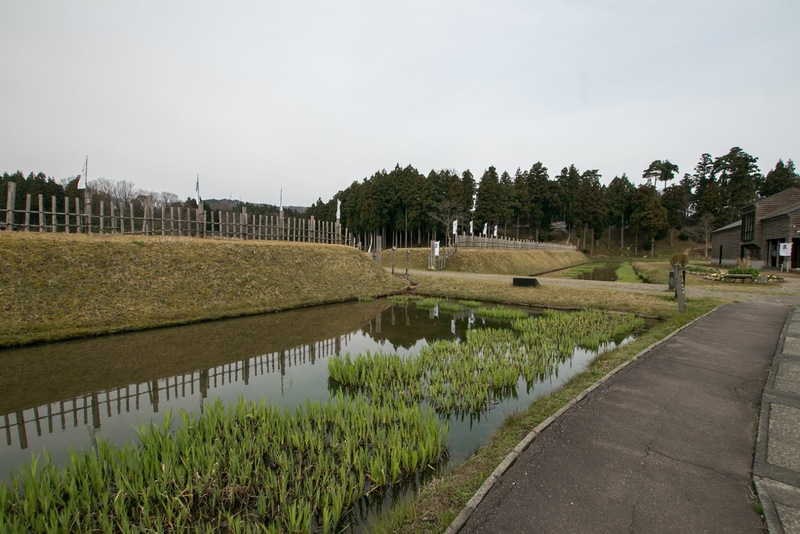 Now as a minister of Toyotomi government, Ieyasu decided to subjugate Uesugi clan, and dispatched troops toward Aizu region in 1600. 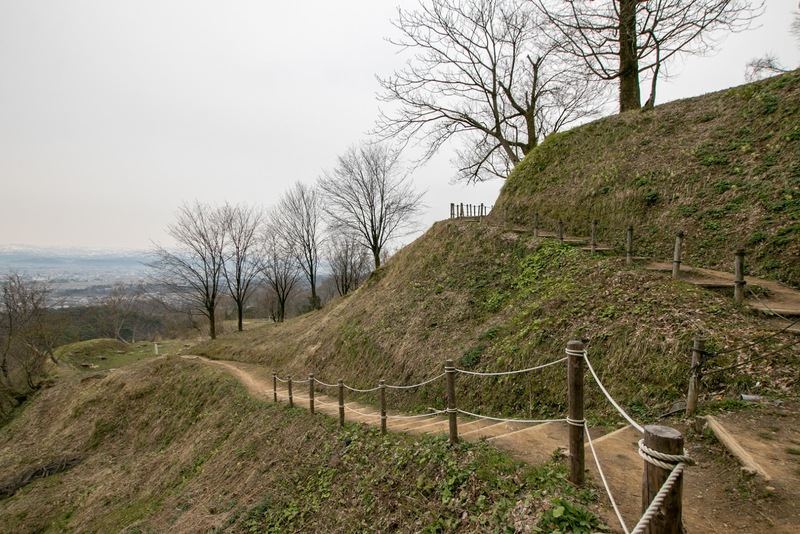 Utilizing this military vacuum, Mitsunari raised his army along with other lords such as Mouri clan or Ukita clan against Ieyasu. 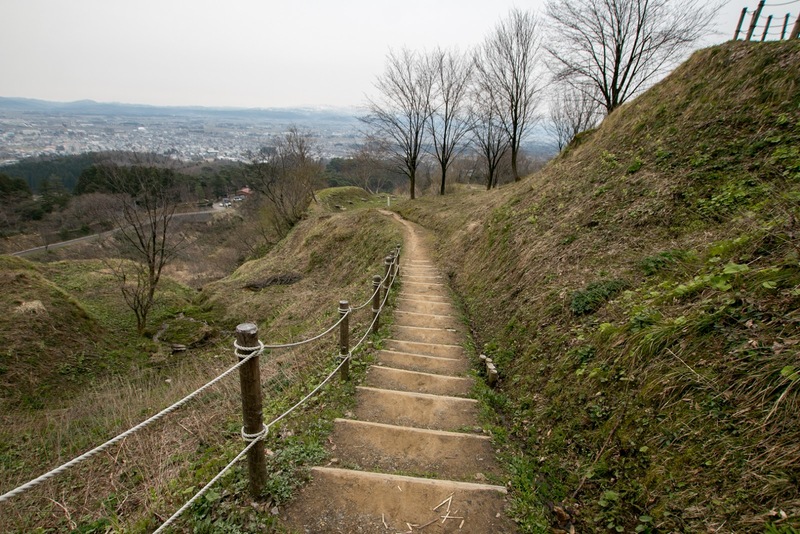 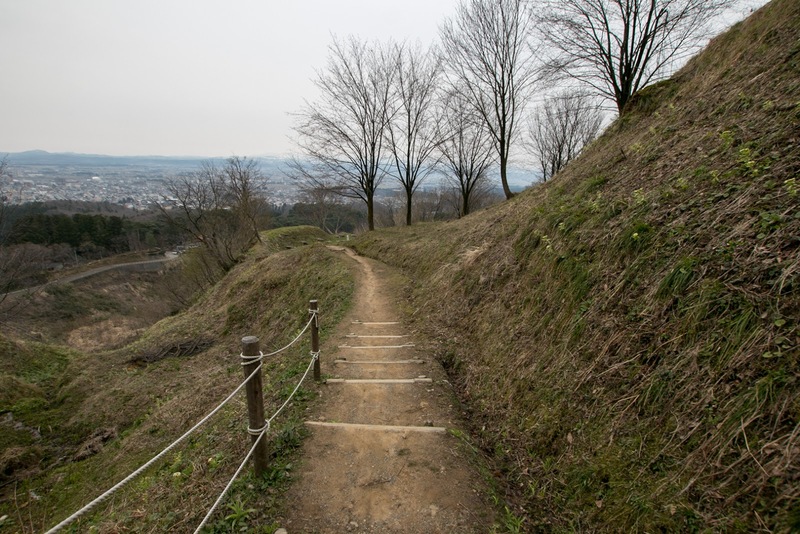 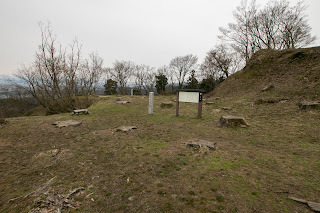 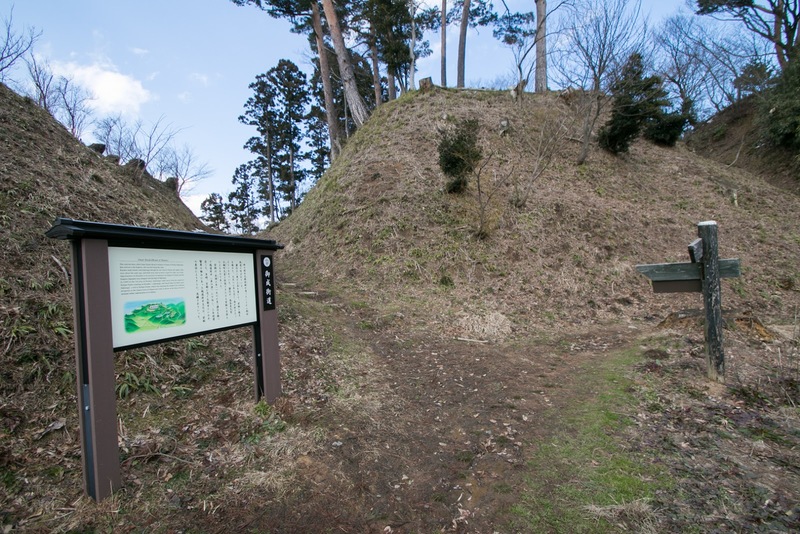 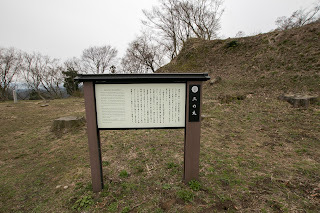 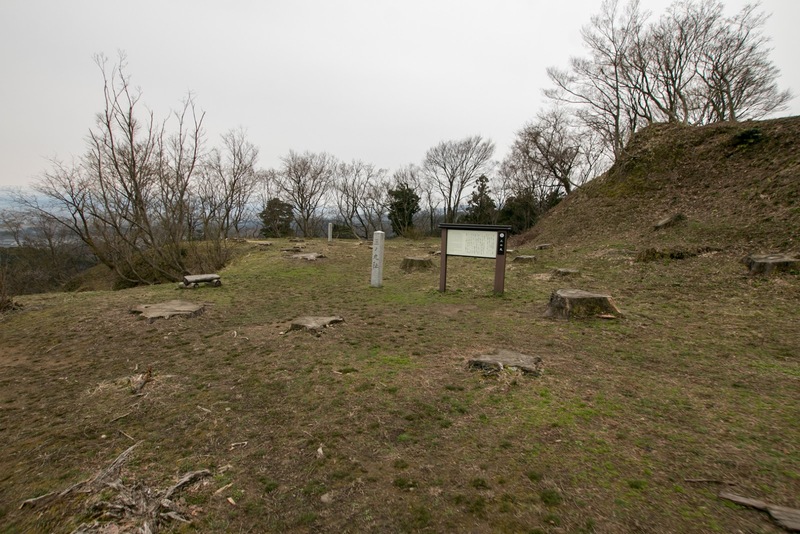 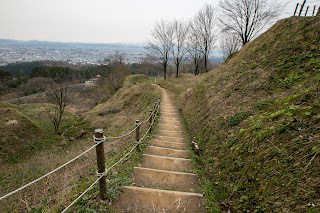 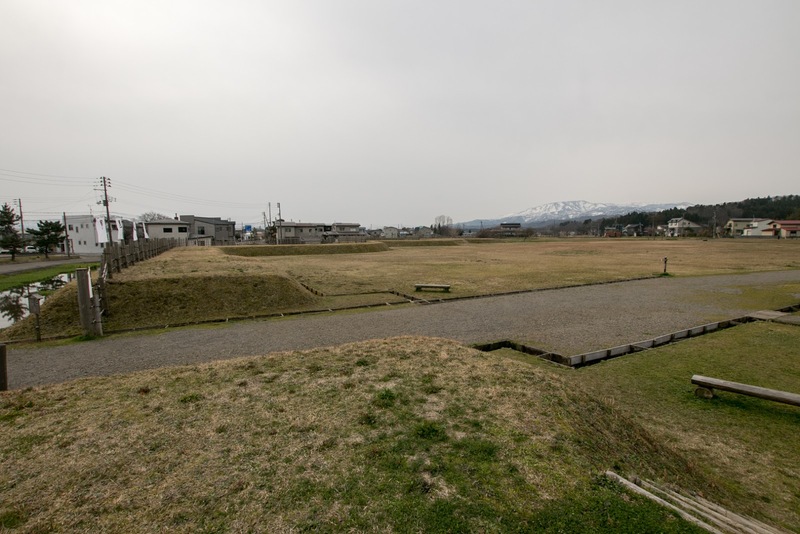 Mitsunari side captured Fushimi castle (Kyoto prefecture), and hearing that news Ieyasu stopped his army at Oyama caslte (Tochigi prefecture) to have a meeting with accompanying lords to decide the policy. As a result, Ieyasu returned his army to central area and chose to fight against Mitsunari. 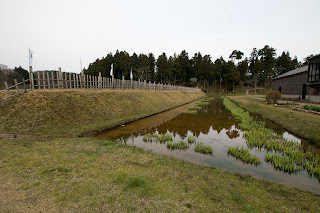 Kagekatsu might be able to assault Ieyasu from backside, but Kagekatsu did not do so and fought with surrounding Tokugawa side lords such as Masamune Date (1567-1636), the warlord of Miyagi area, or Yoshiaki Mogami, one of Dewa country (Yamagata prefecture) to expand his territory. It is said that Kagekatsu thought to be an independent power at Eastern counties rather tnan inteferring to the conflict in central area. 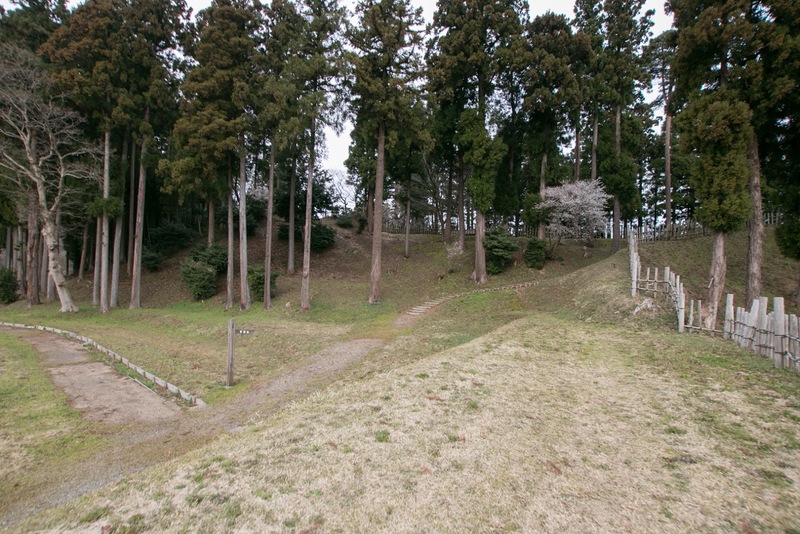 Katekatsu overawed Masamune by its troop then turned to his army to Dewa country to attack Mogami clan. 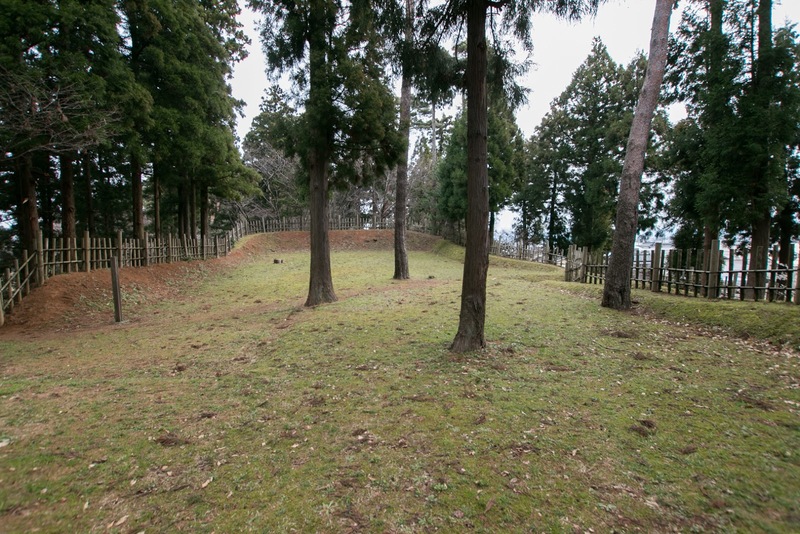 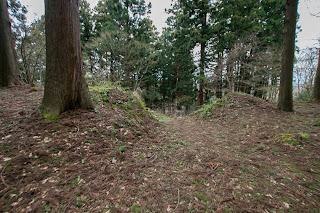 Uesugi army lead by Kanetsugu captured several castles of Mogami clan and approached to Yamagata castle, the main residence of Mogami clan. However, Mitsunari was defeated at decisive the battle of Sekigahara against Ieyasu in only one day, and his army completely collapsed. Now Ieyasu was expected to move to Aizu region, then Uesugi clan had to guard their territory at first. 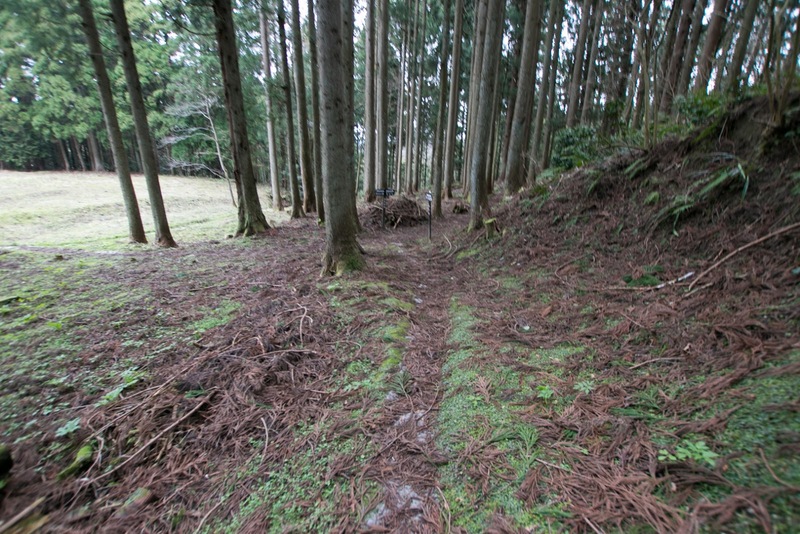 Kanetsugu retreated from Dewa country coping with hard chase of Mogami clan and returned to Aizu region. 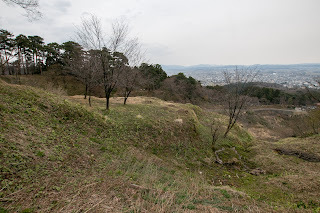 Kagekatsu prepared for the final battle but also processed peace negotiations with Ieyasu nearly one year. 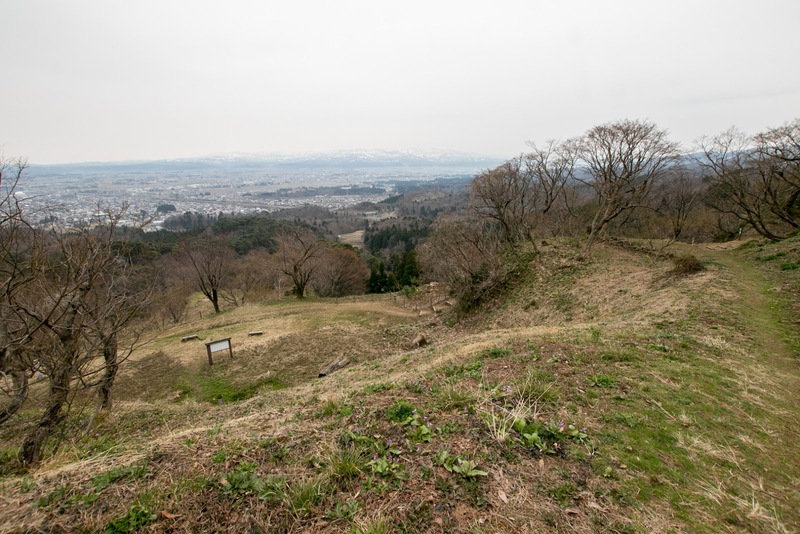 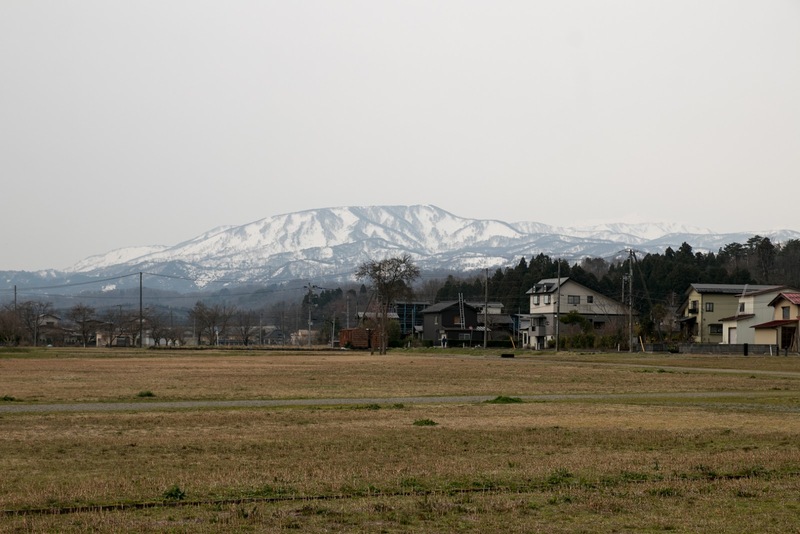 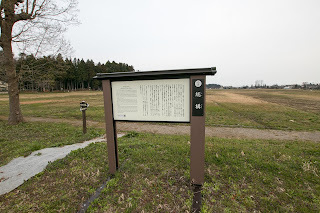 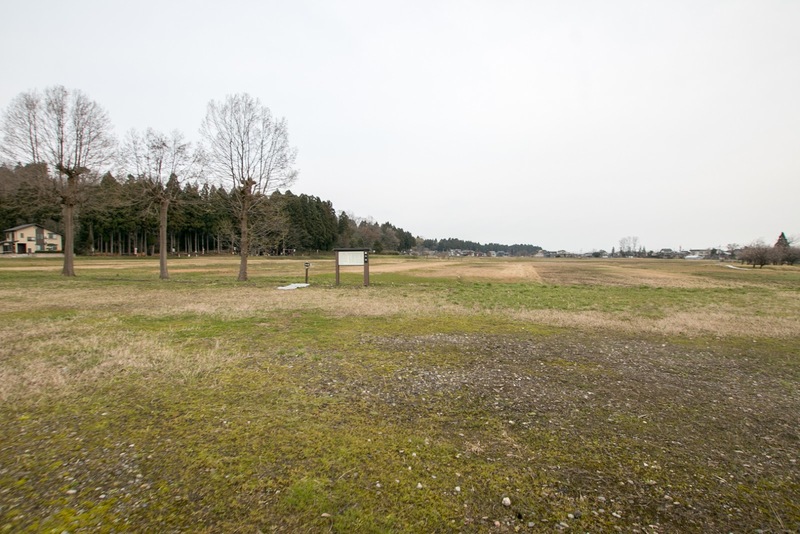 In spite of victory at the battle of Sekigahara, Ieyasu had to stabilize his new government and hoped to avaid further expedition to distant Aizu region. Beside this, Masamune Date who aimed at the territory of Uesugi clan was also crafty and might be the origin of another disturbance. 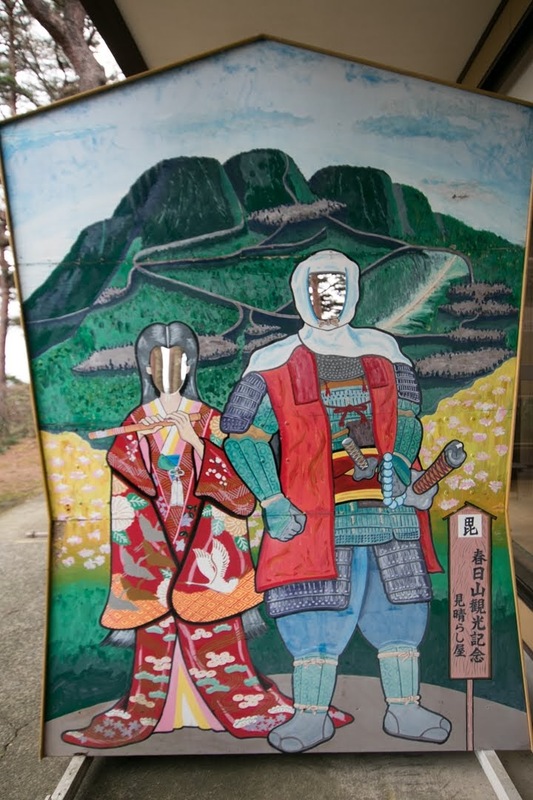 Further the fame of Kenshin might assist Uesugi clan. 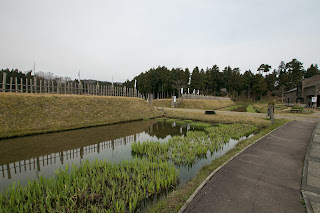 Due to these reason, in 1601 Ieyasu accepted apologize of Kagekatsu under the decrease of its territory to quarter size. Now Kagekatsu became the commander of Yonezawa castle and moved to there. Even though damaged Uesugi clan could survive the turbulent period and continued by the end of Edo era overcoming many difficulties, then could hand down the fame and material of Kenshin to later period. After the movement of Kagekatsu in 1598, Echigo country and Kasugayama castle was managed by Hideharu Hori (1576-1606), son of Hidemasa Hori (1553-1590) who was the close staff of Nobunaga and supported the rise of Hideyoshi. 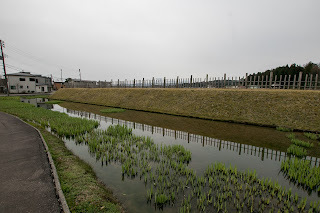 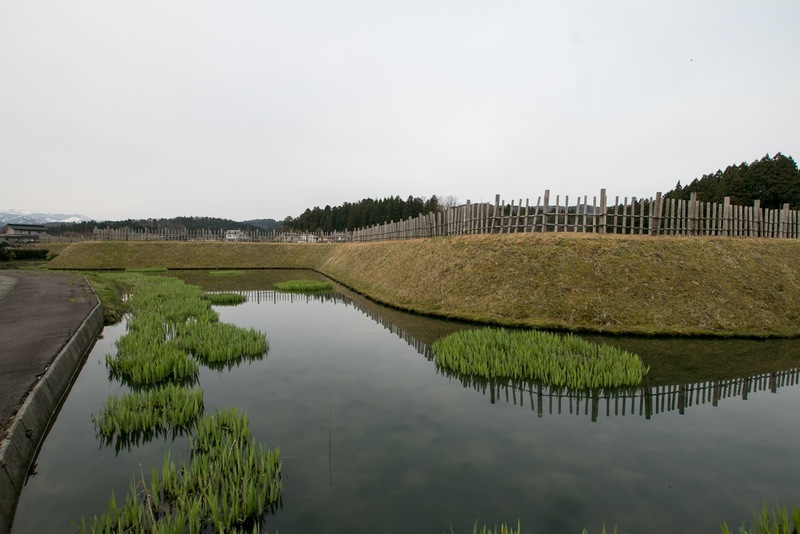 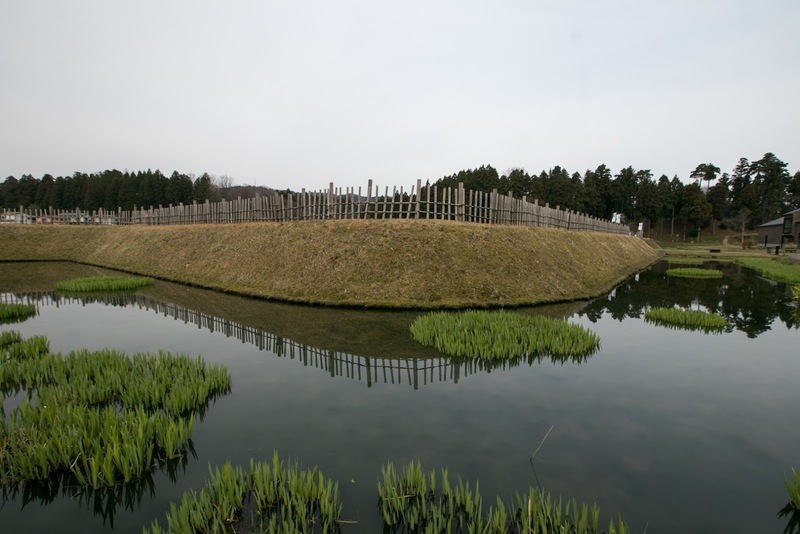 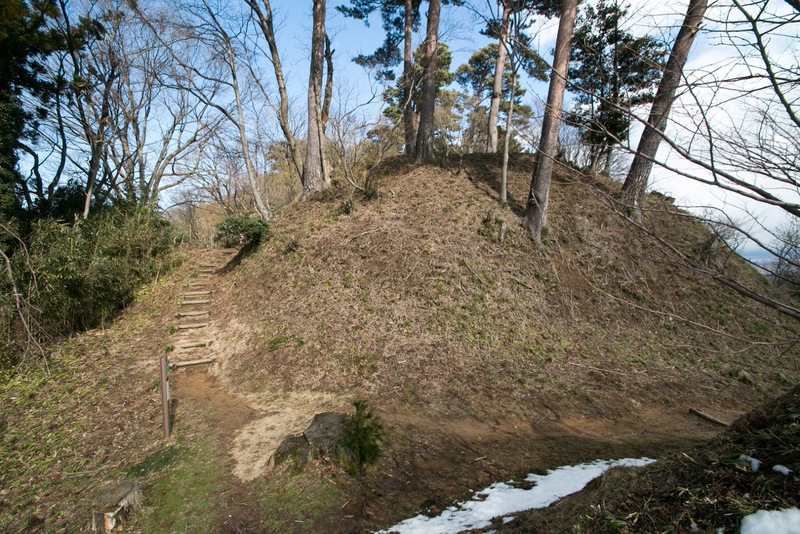 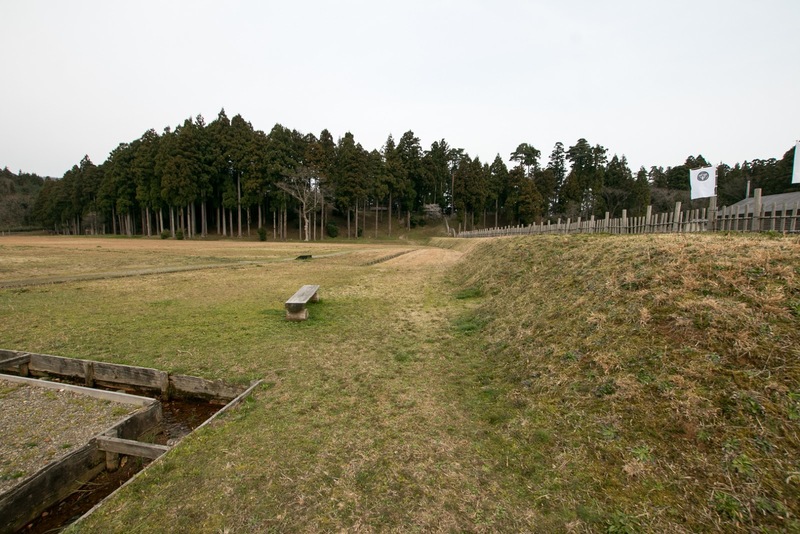 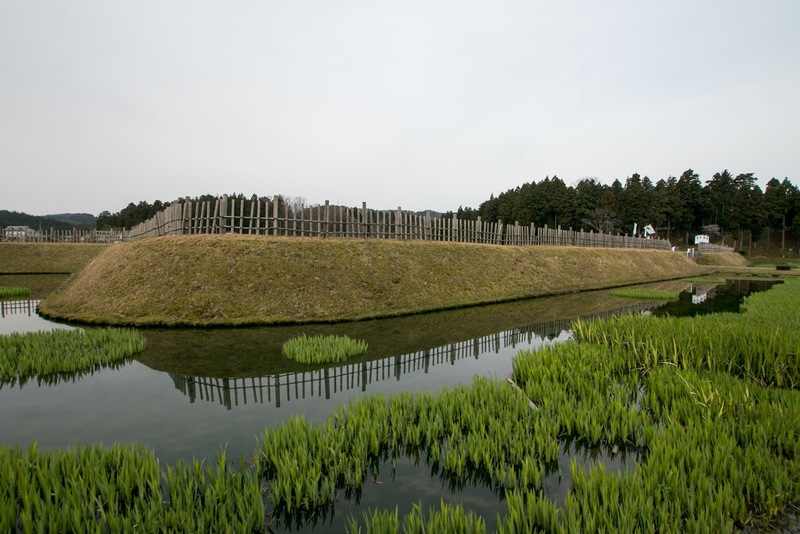 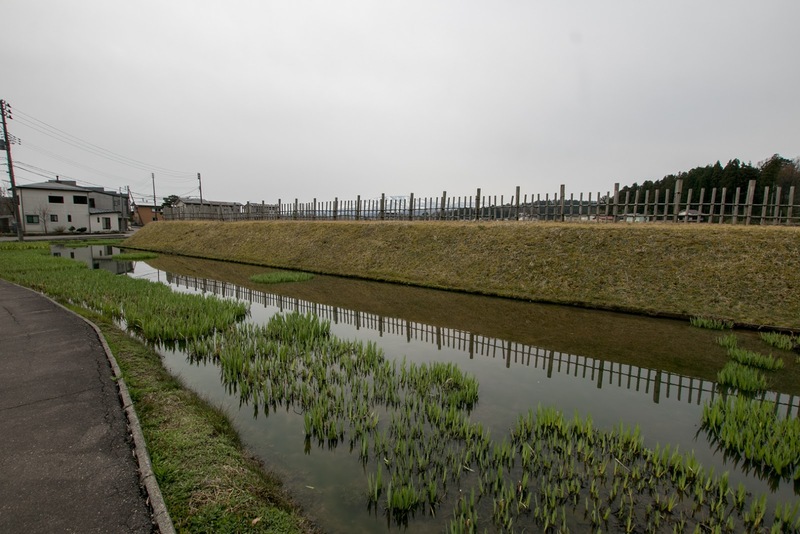 Preparing for the rebellion of former Uesugi retainers, Hideharu built a large barrier with water moat surrounding castle town. 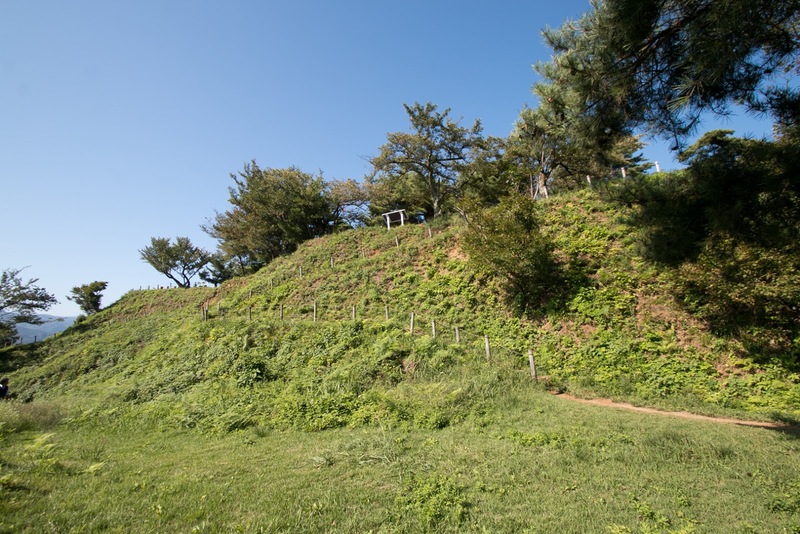 In 1600, Hideharu newly built Fukushima castle at the coast to grasp Naoetsu town and port directly, and abolished Kasugayama castle. 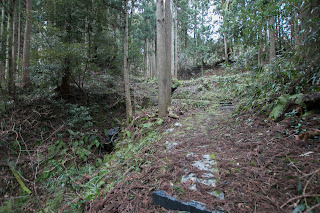 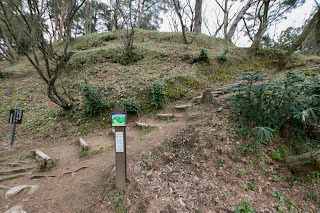 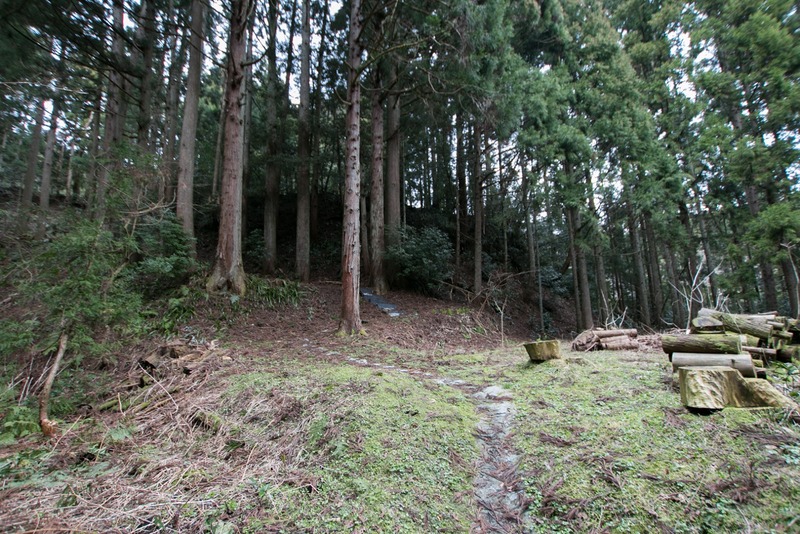 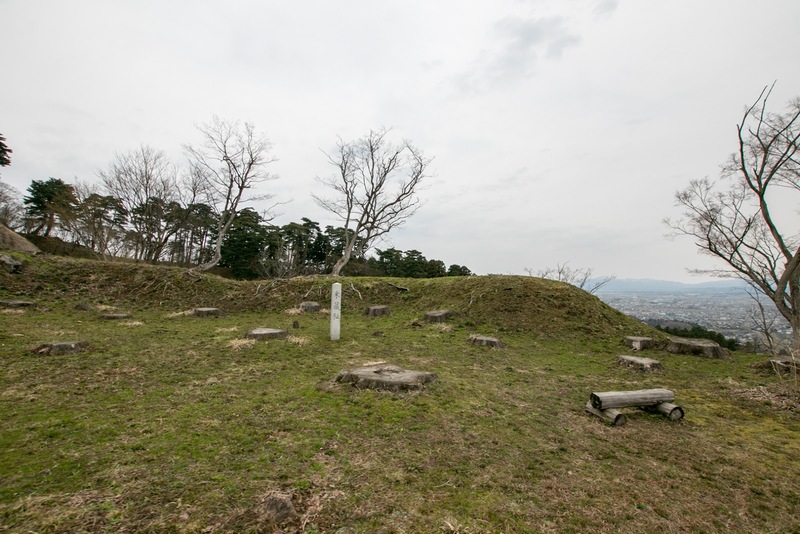 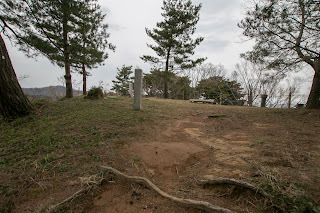 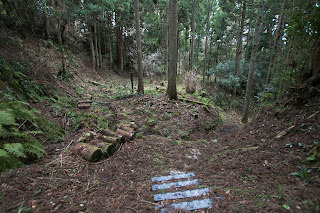 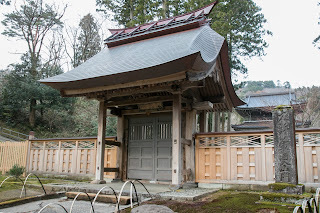 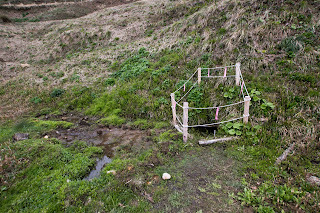 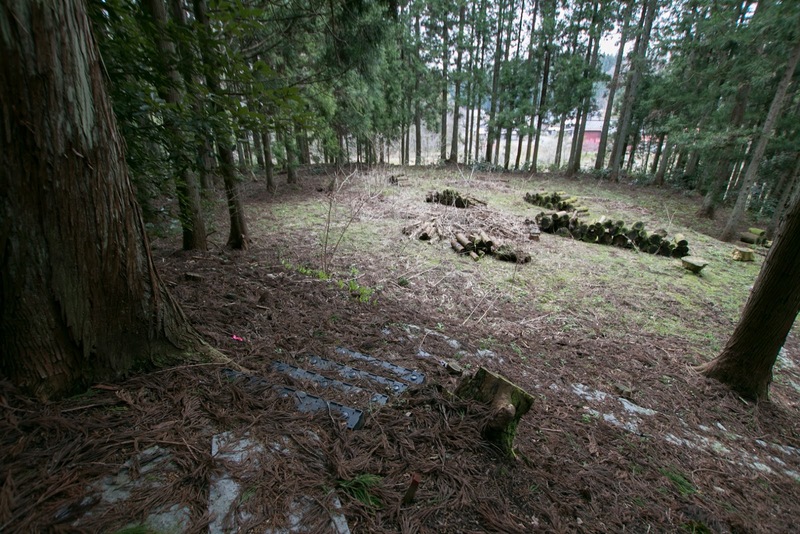 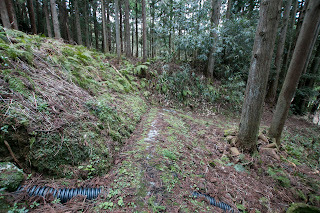 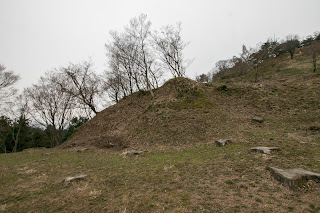 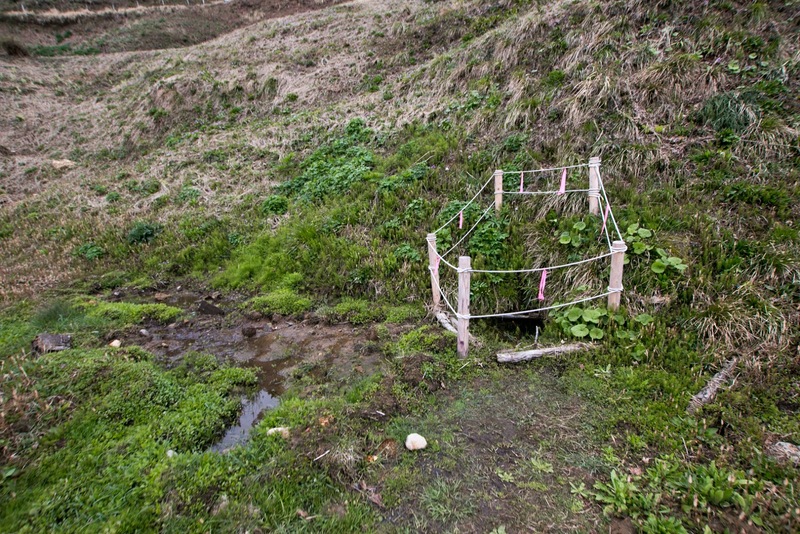 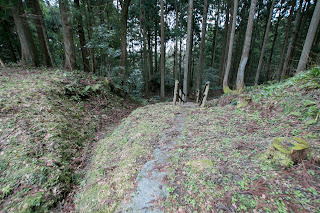 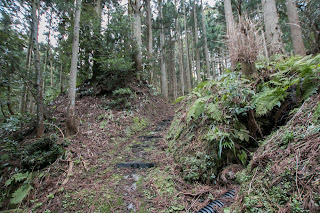 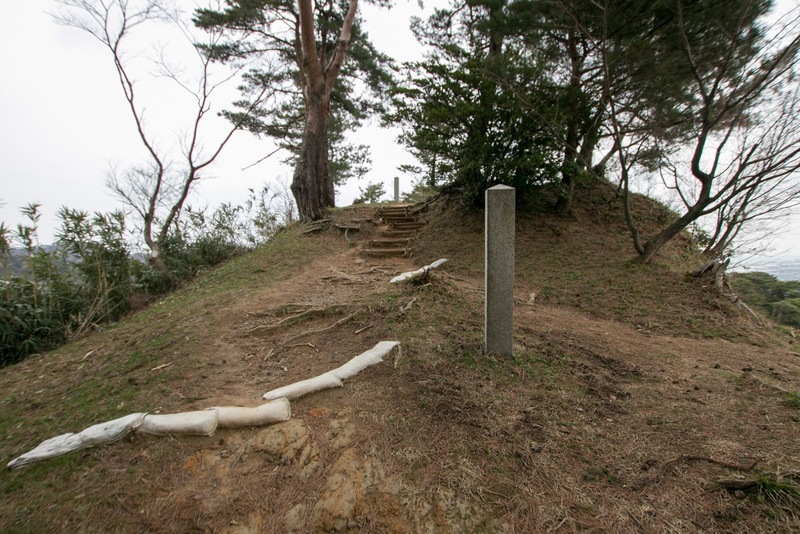 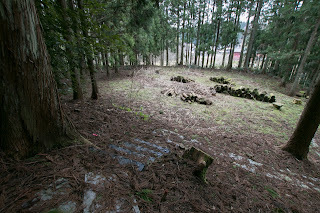 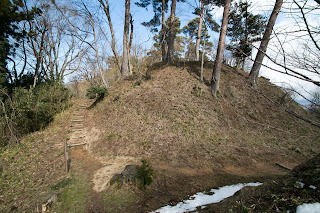 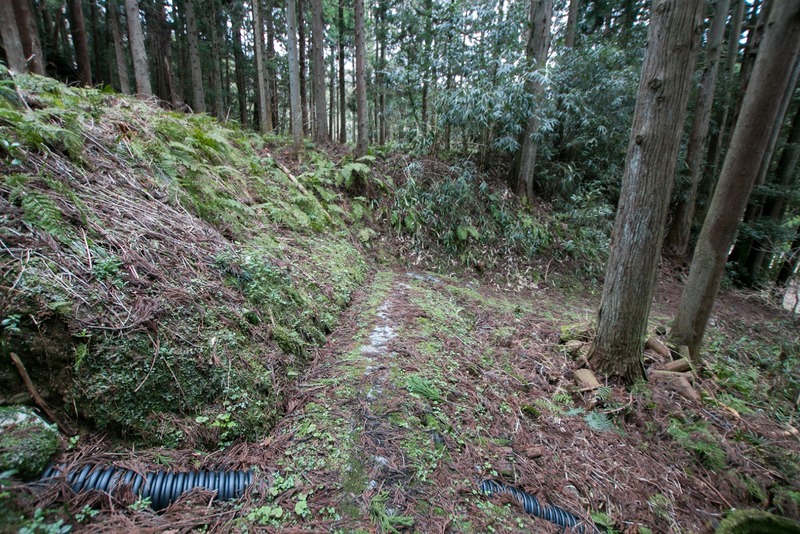 Now all building is lost except for one gate move at Rinsenji temple at hillside area, but structure of the castle well remain all over the mountain. Rough and huge structure of the castle is suitable for the residence of god of war. 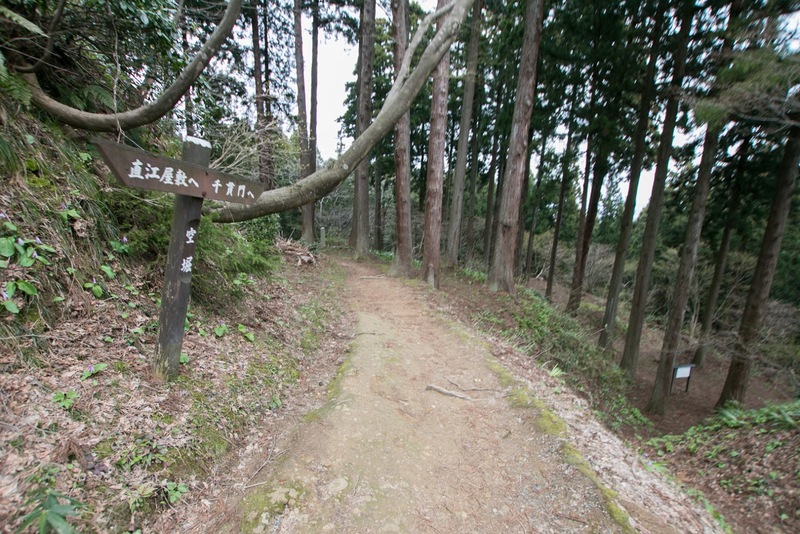 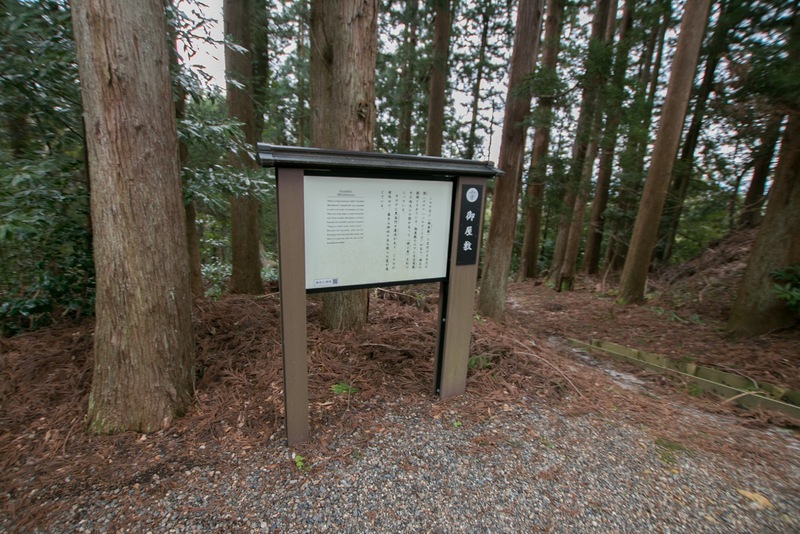 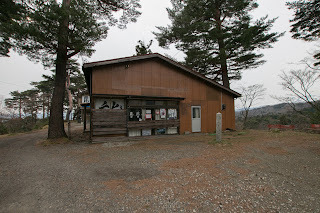 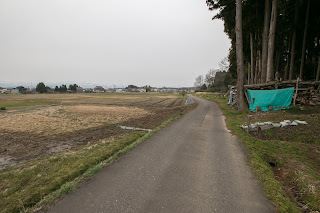 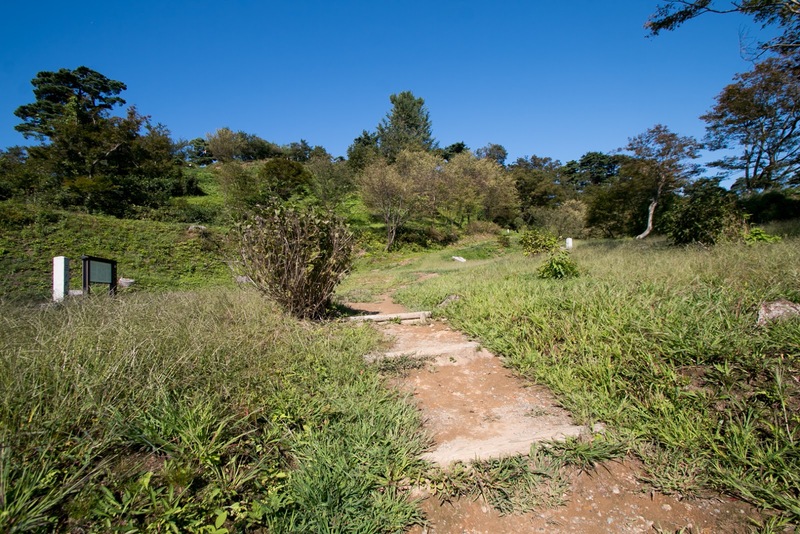 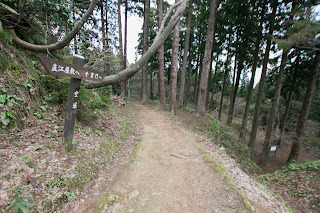 30 minutes walk from Echigo-Tokimeki railway Myoko-Haneuma line Kasugayama station. 20 minutes drive from Hokuriku-Jidoshado Expressway Joetsu interchange to halfway parking. 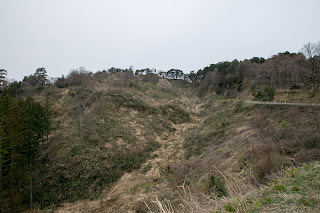 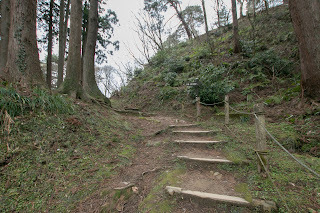 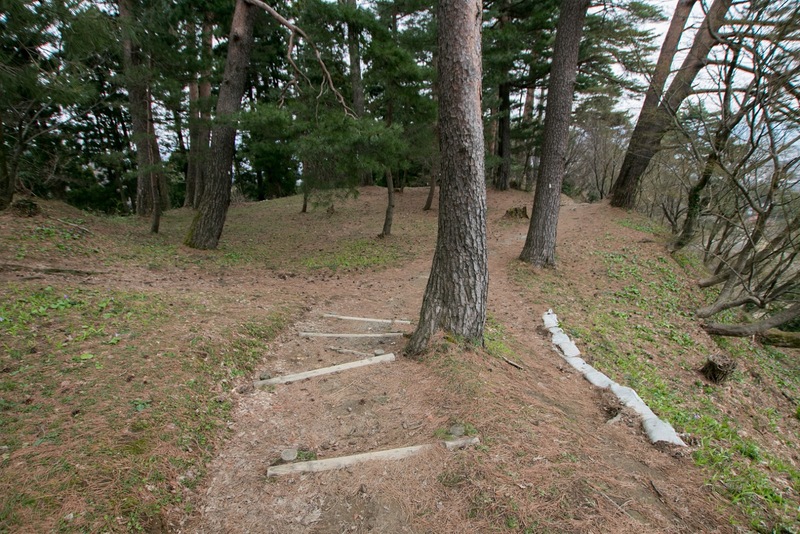 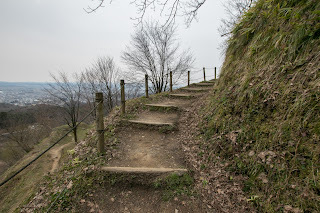 30 minutes walk from hillside to hilltop castle.